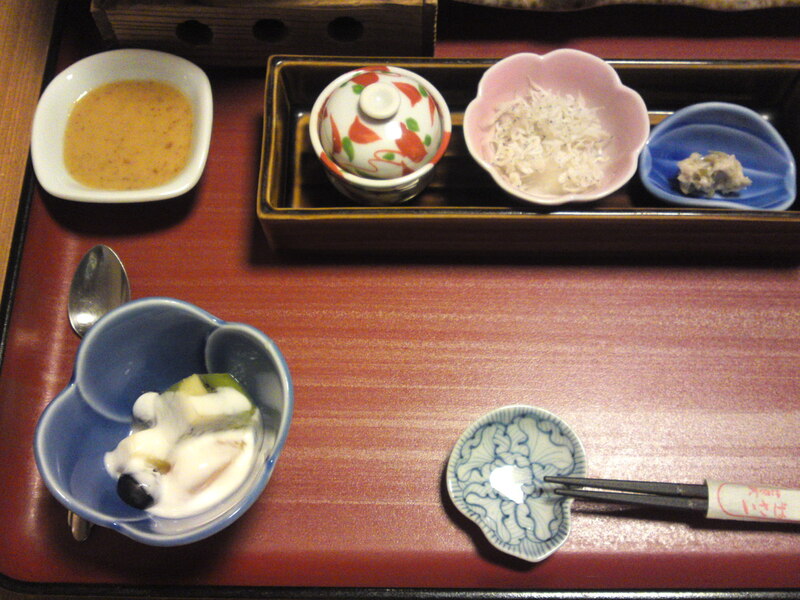 First, the culture of sake rice (as opposite to that of edible rice) is a risky venture financially and a steady supply is fraught with unseen complications. 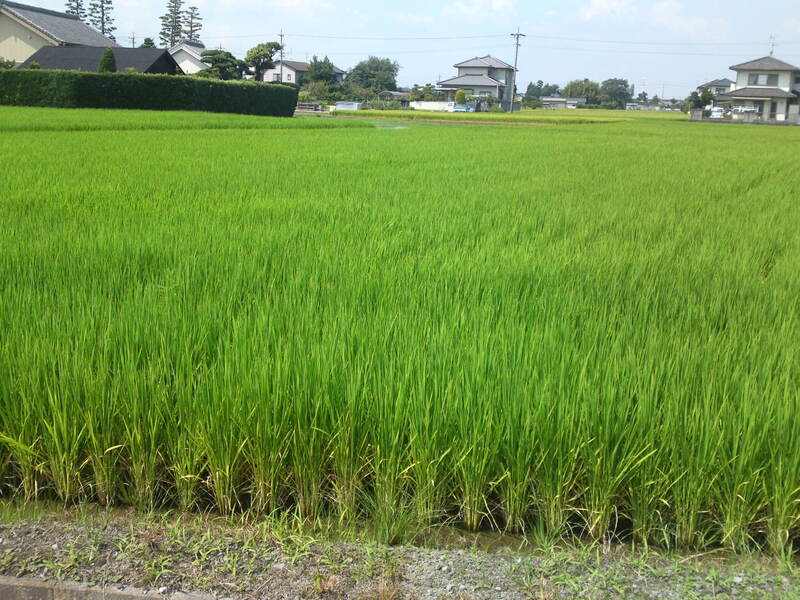 Moreover, most of brewers outside the main sake rice producing areas have to “import” their rice from Hyogo, Hiroshima, Iwate, Niigata and other faraway Prefectures. Moreover, whatever some brewers might tell you when questioned in front of witnesses, the quality of such imported rice cannot be fully insured. 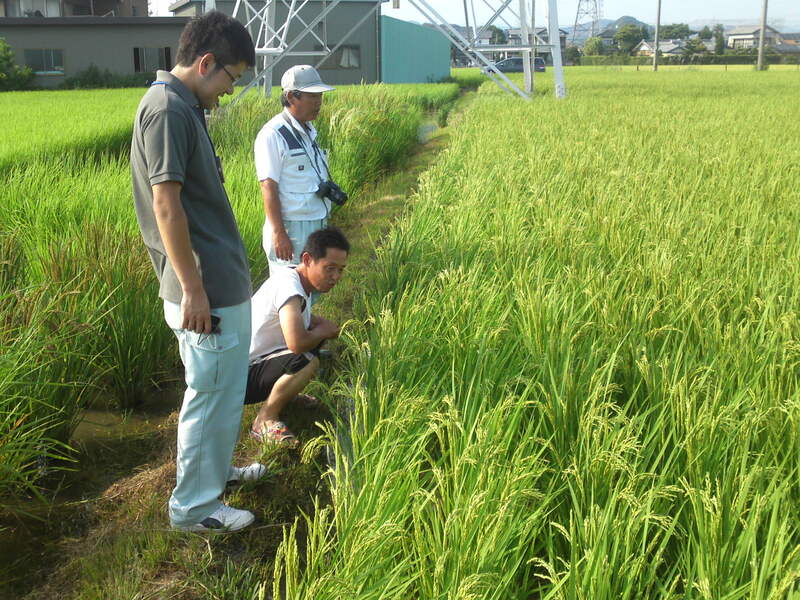 Mr. Muramatsu’s Homare Fuji paddies (30 acres) in Naka Shinden, Yaizu City. 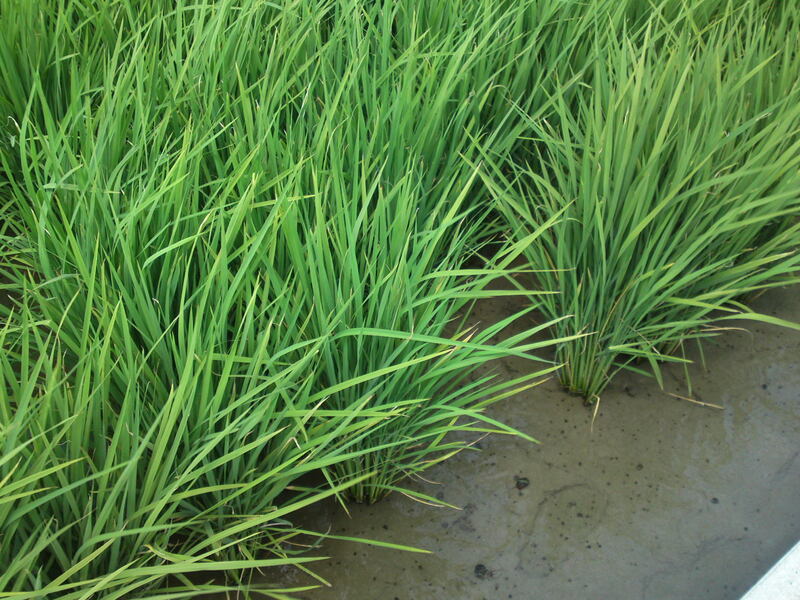 The only solution is to try and grow your own sake rice locally! 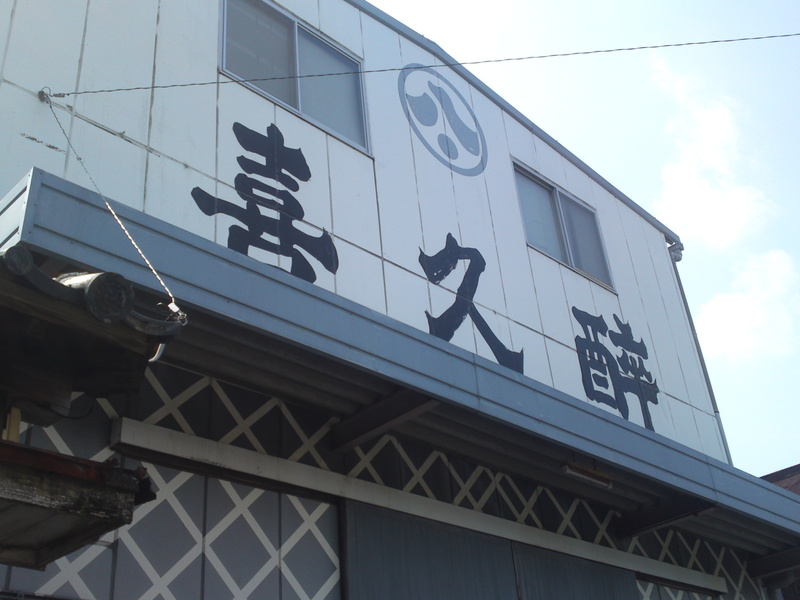 In 1998, under the auspices of the JA research was initiated on the culture of the Yamada Nishiki Sake Rice strain, considered as the best by many, in the Iwata Agricultural Research Center. 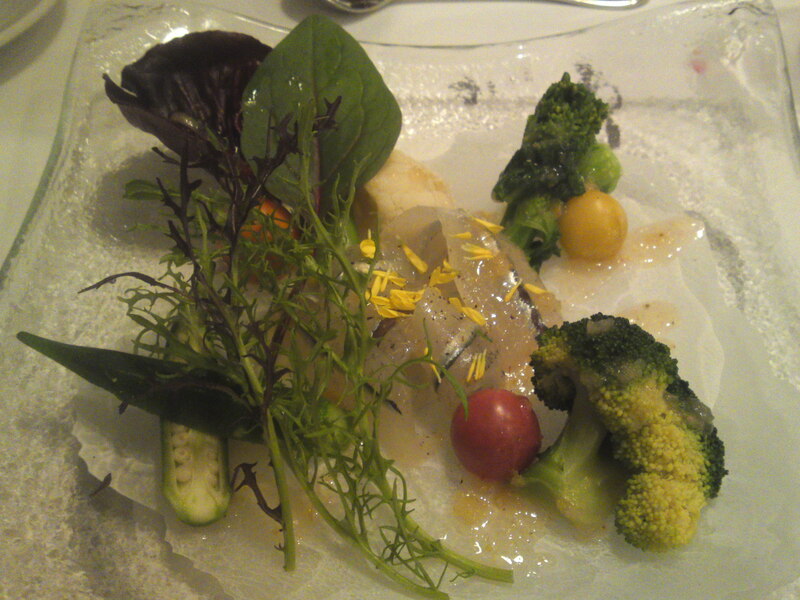 7 years later, 1n 2005, the cultivation was started in earnest in privately-owned fields under the guidance of such specialists such Mr. Miyata. 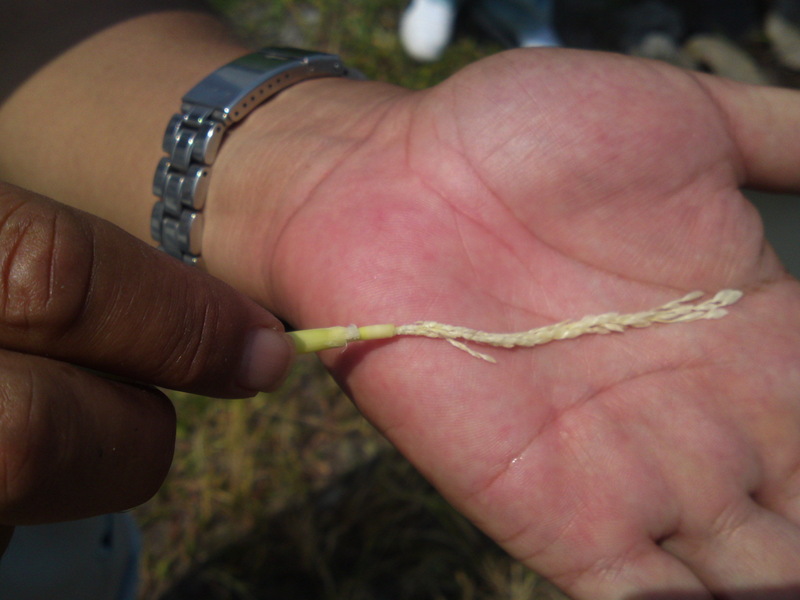 The rice stalks grow a lot thicker and nearer to each other than normal rice. 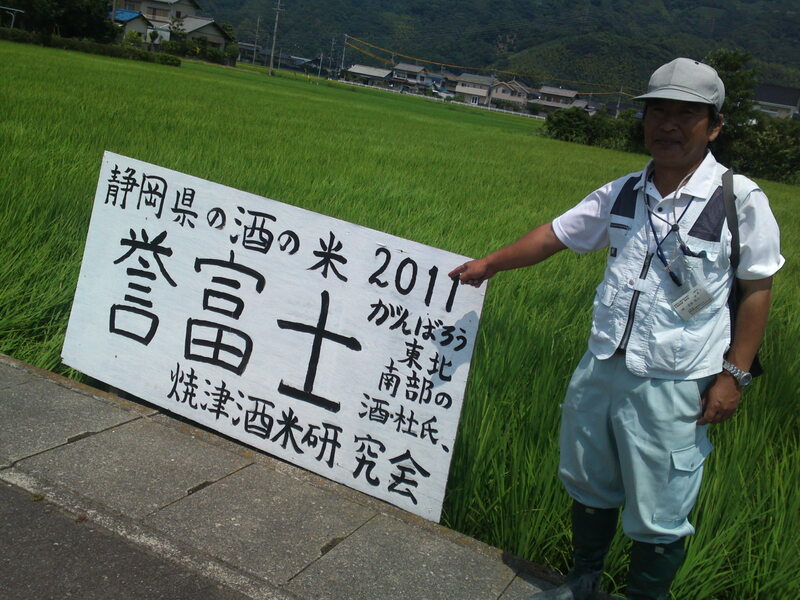 The Yaizu Sake Rice Research Association grouping 15 farmers grows more than 60% of this Yamada Nishiki Sake Rice under the name of Homare Fuji Sake Rice. 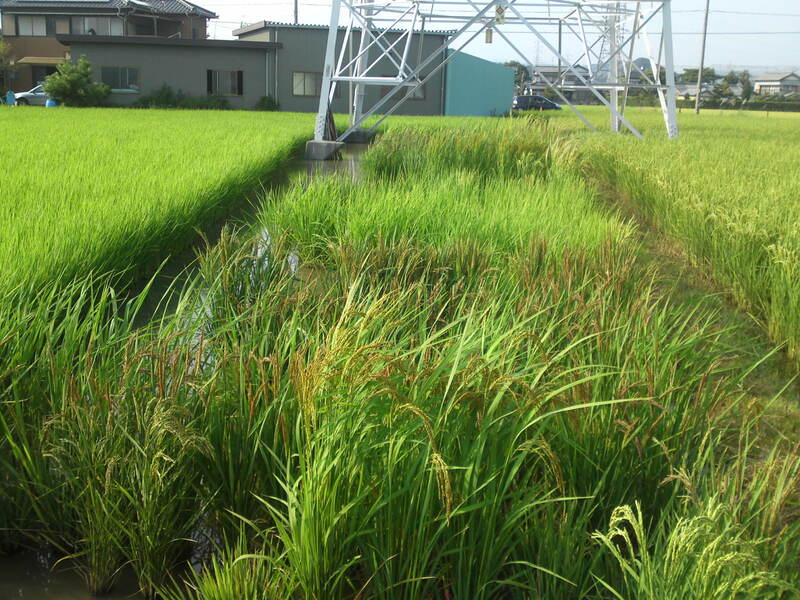 Actually the same Association grows Homare Fuji Rice on 10.3 ha, Yamada Nishiki Rice on 5.6ha and Gohyakumangoku Rice on on 4.7 ha. 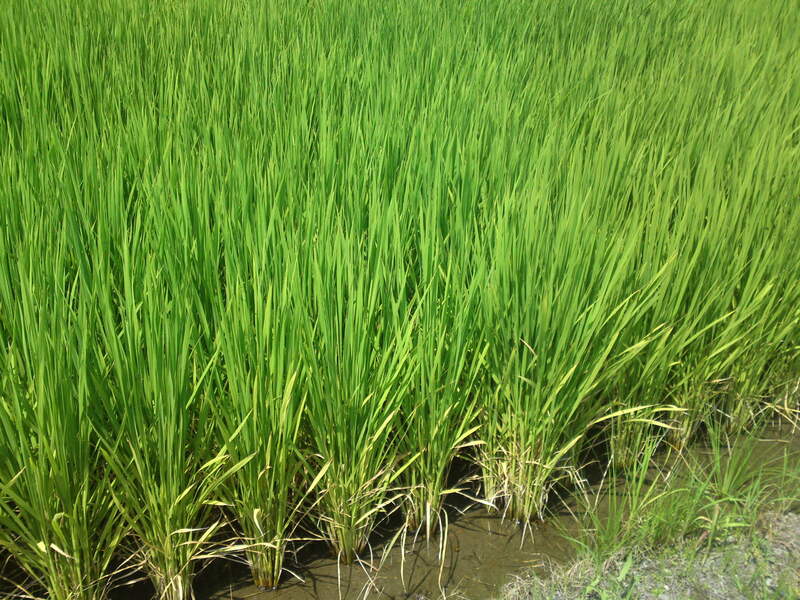 Homare Fuji Rice is presently grown by 31 farmers in 7 distinct areas across the whole Prefecture. 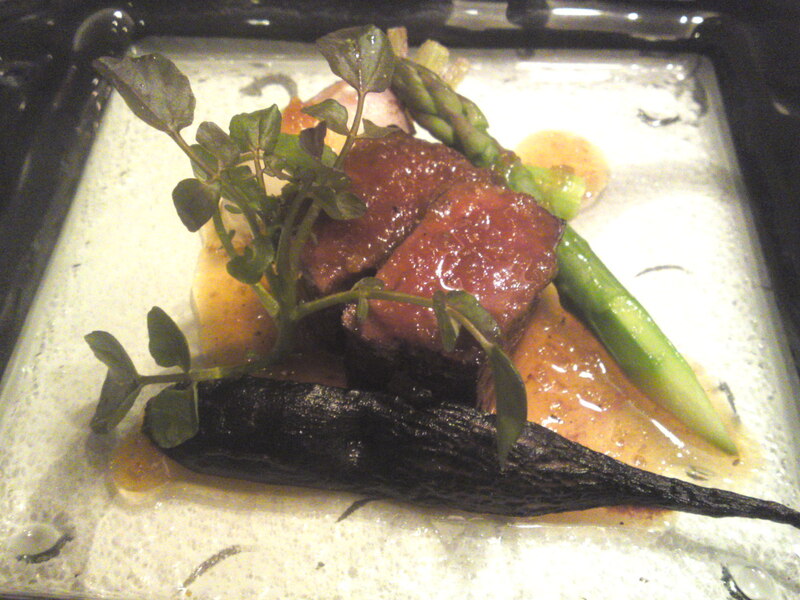 Moreover, 20 out 28 breweries presently produce some of their sake with Homare Fuji Sake Rice up to Junmai Ginjyou level. 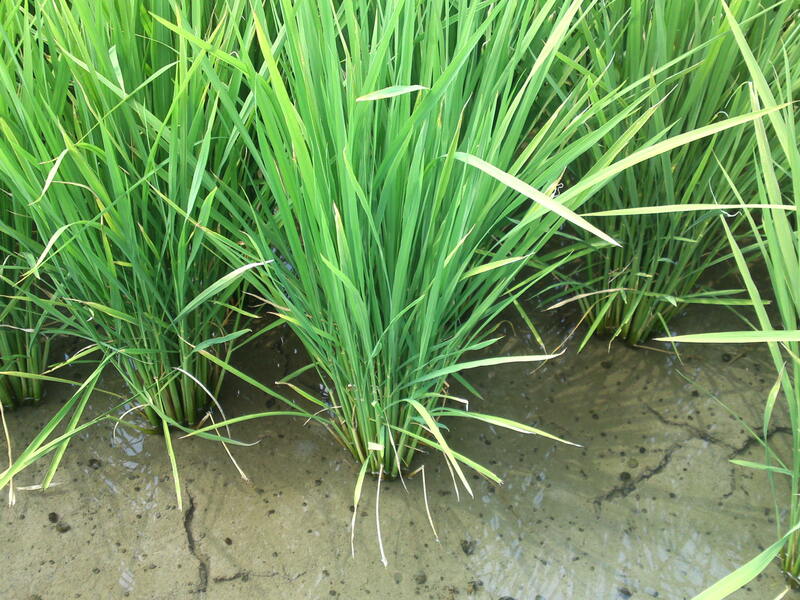 It has become serious business as from this year the Yaizu JA Agricultural Association (governmental) will assume the responsibility for the sales of Homare Fuji Sake Rice grown in the Yaizu City area! The personal help of Mr. Ryohei Miyake of the Shizuoka Prefecture Shida Haibara Agriculture & Forestry Bureau was certainly welcome to deal with all these farmers and JA representatives! 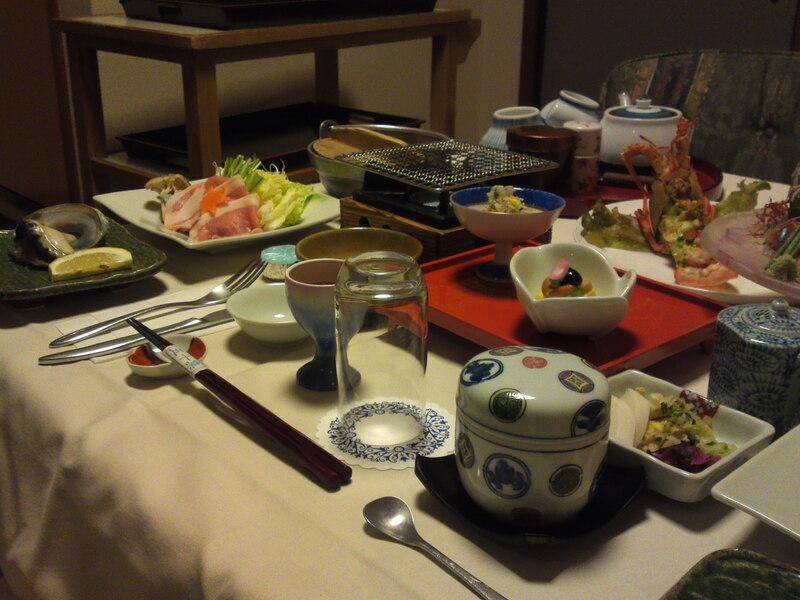 Messrs. Miyake and Miyata were kind enough to pick me up at Fujieda Station and take care of me for the whole day! 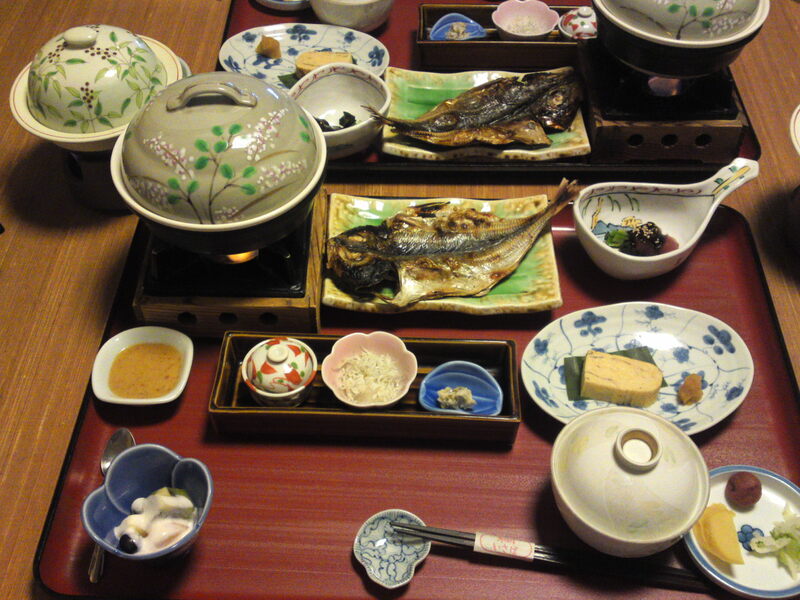 They took me to 3 different paddies including that of Mr. Muramatsu mentioned above and introduced me to the JA Ooigawa Representative and other personalities of the business! 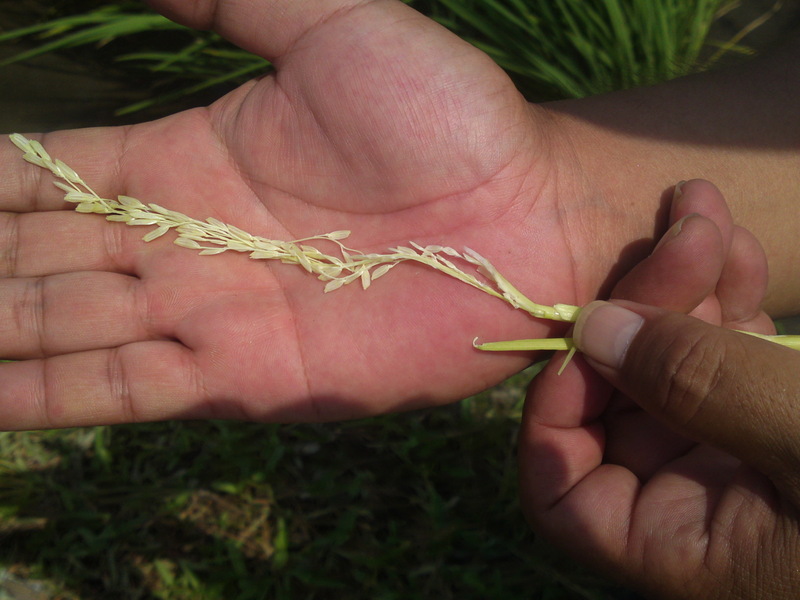 In every paddy Mr. Miyata took out a rice stalk to painstakingly open it with his nails to show me the grains already developed inside and to tell me thus exactly when the rice would appear and would be harvested by the day! 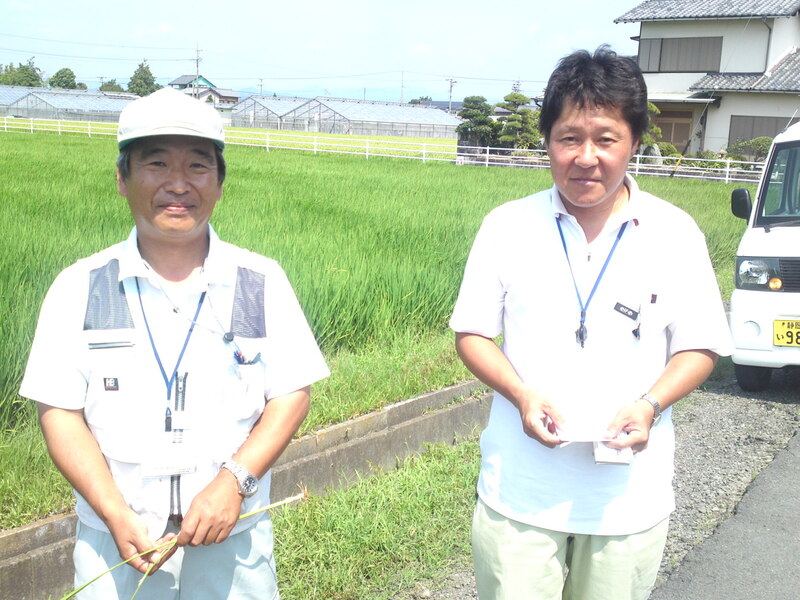 The second paddy was that of Mr. Matsumura (20 acres), Higashi Mashizu, Yaizu City, where planting and harvesting events are regularly held! 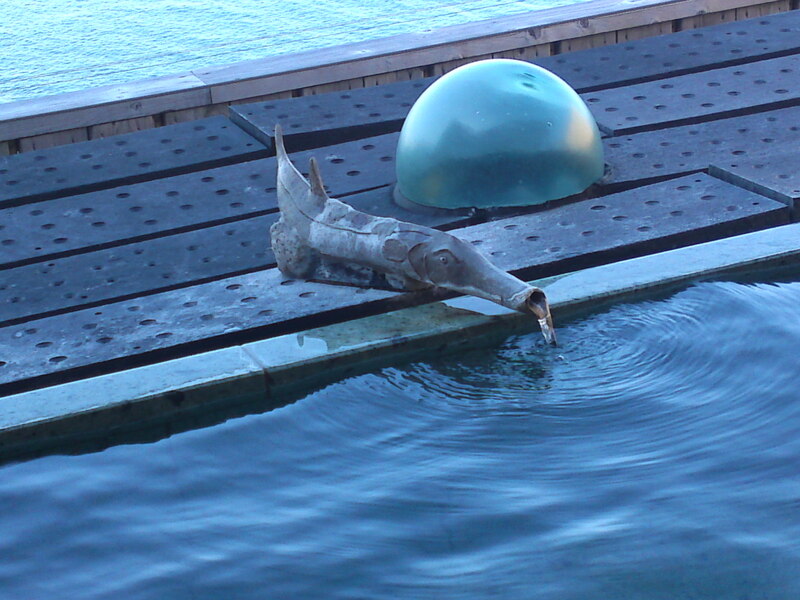 its stalks are shorter and harder and will not break under heavy winds, even those of typhoons. 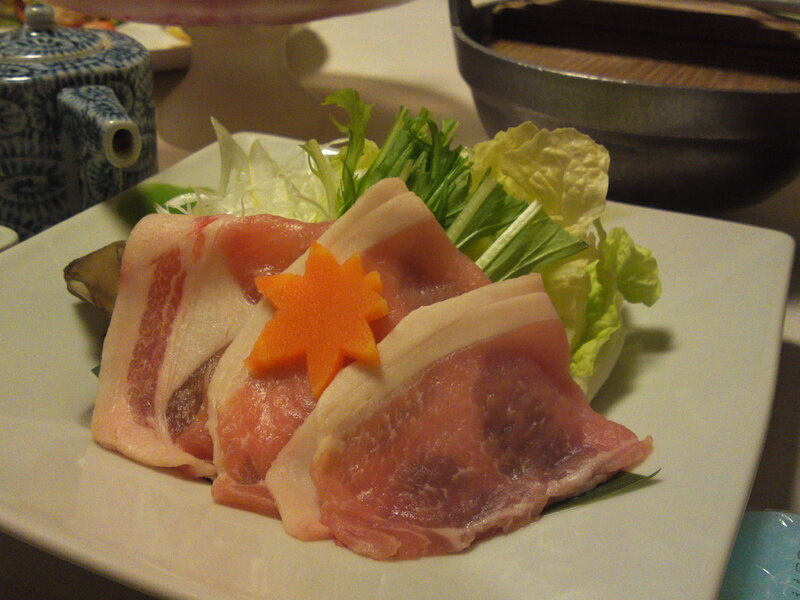 Moreover, their rice contains a lot less proteins than others, which allows for an exceptional maturing of sake! 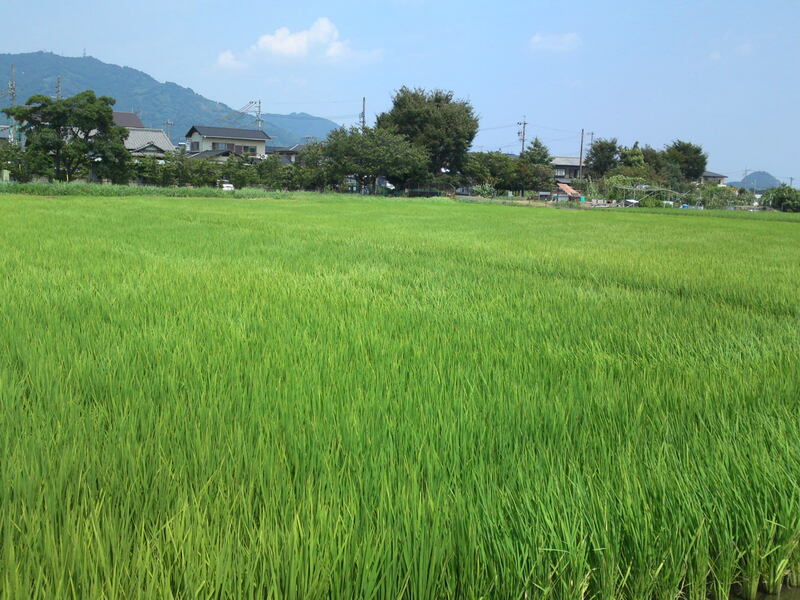 Yaizu soil is of two types whether the fields are on the former bed of Ooigawa River with a high concentration of sand like the above-mentioned two paddies or of a clay type if closer to the mountains. 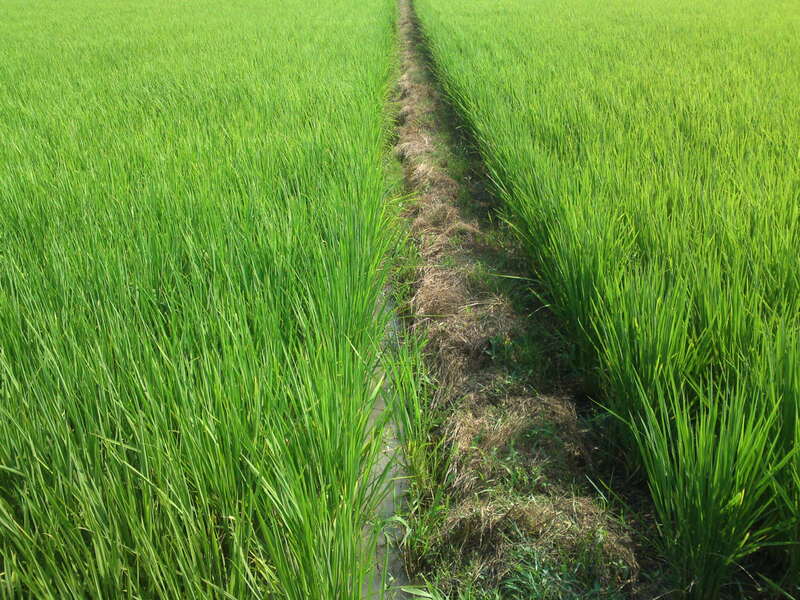 Naturally the soil quality has to be taken in account for each paddy! 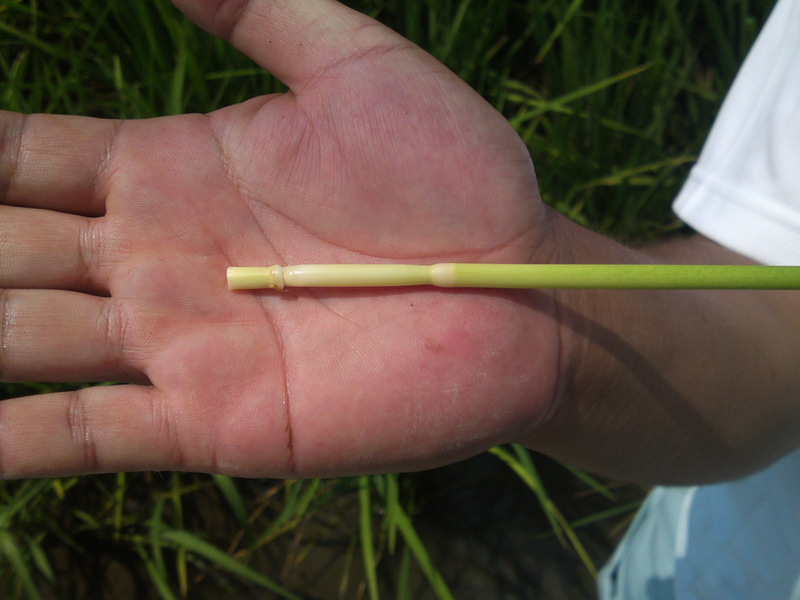 The Homare Fuji Rice stalks are comparatively short (25 cm shorter that those of Yamada Nishiki) , but the proportion of the leaves and bottom stalks (“saya”) are longer and the very foot (“fushi”) shorter and thicker. 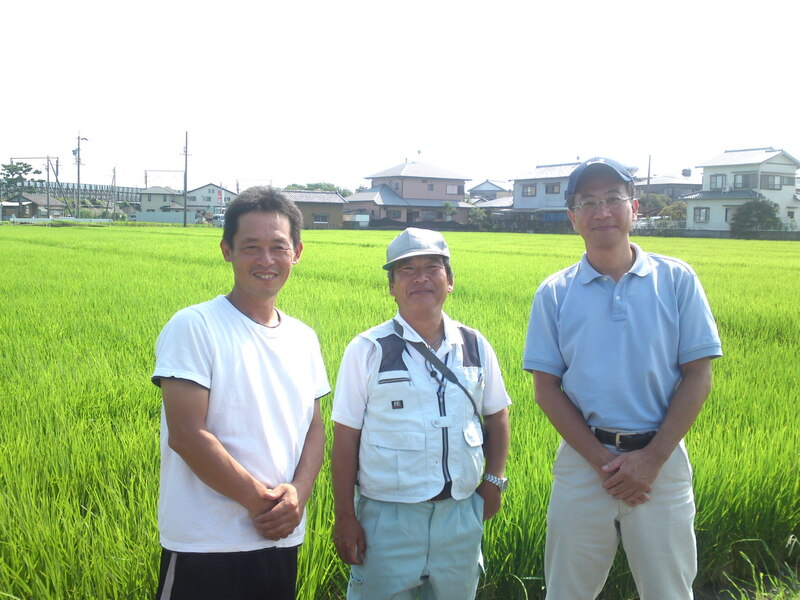 The third paddy I was taken to is the “heart of the Homare Fuji Sake Rice” as Mr. Toshirhiro Umehara has taken charge of growing the rice for the grains only to be re-planted elsewhere for the last 3 years! 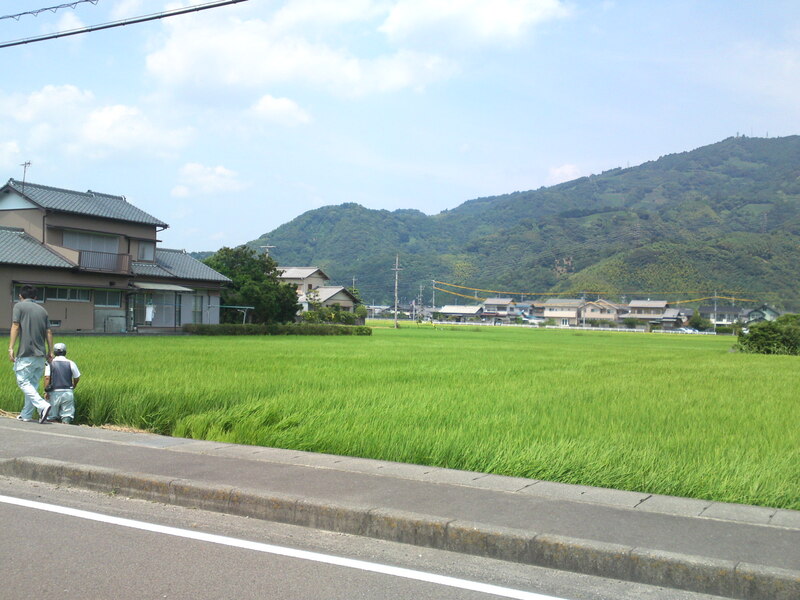 This 30-acre paddy is located in Hirajima in Fujieda City! 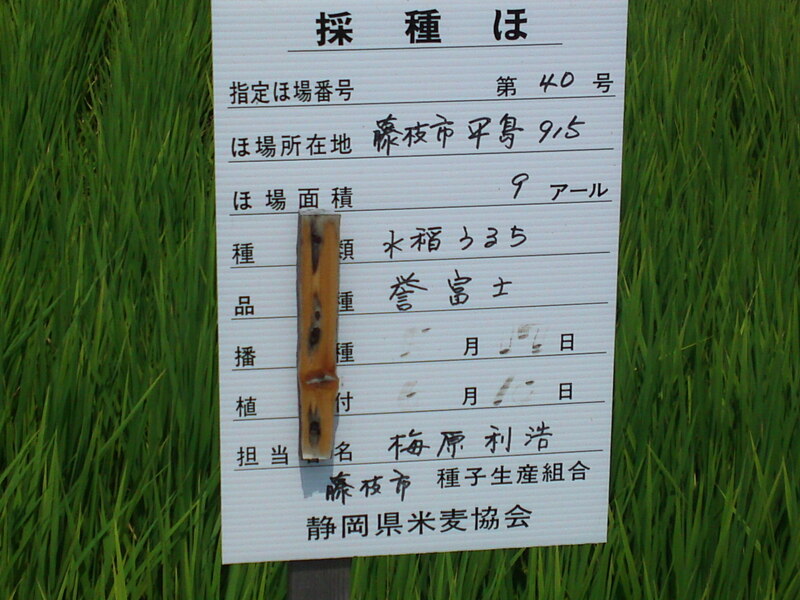 The grains will appear in about 10 days and the rice will be harvested in October! 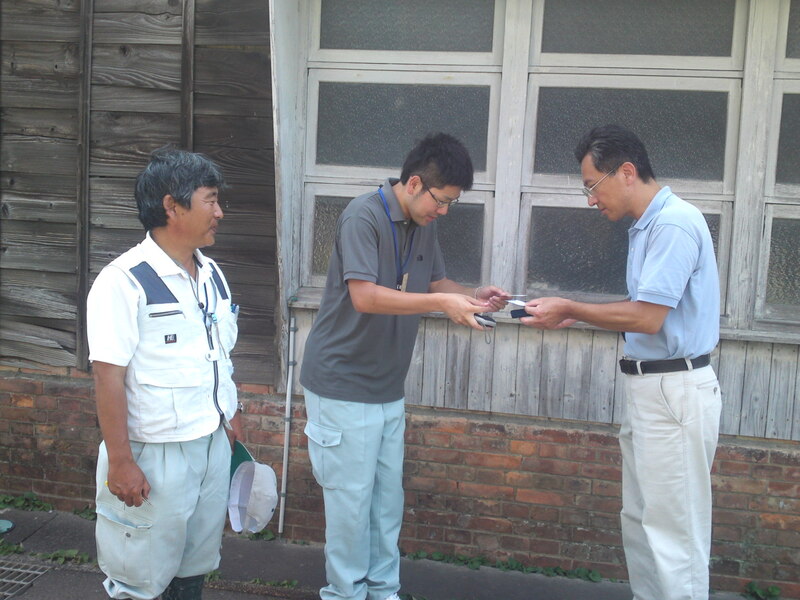 The men behind our regional sake, Mr. Yuuji Miyata and Mr. Toshihiro Umehara! 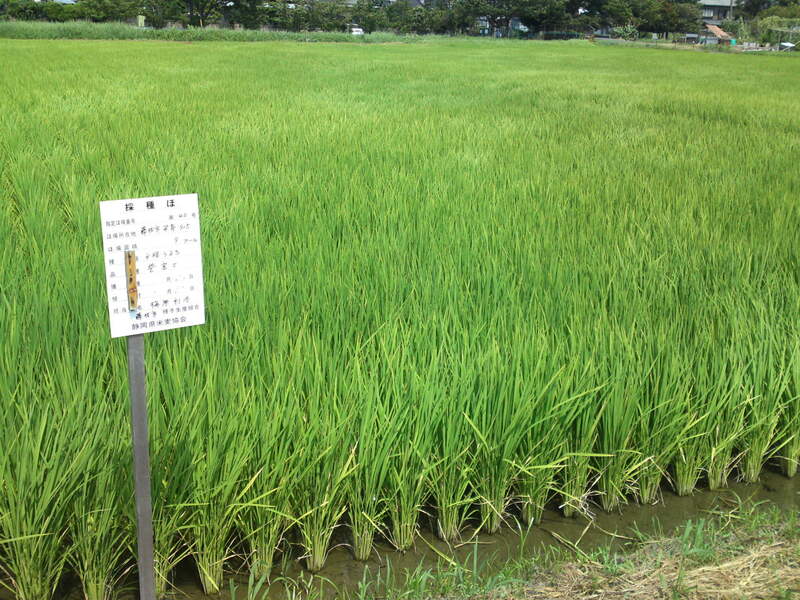 This is what is going to grow into full-fledged rice thanks to these farmers and later become the nectar of Japan (and Shizuoka Prefecture) thanks to our brewers! 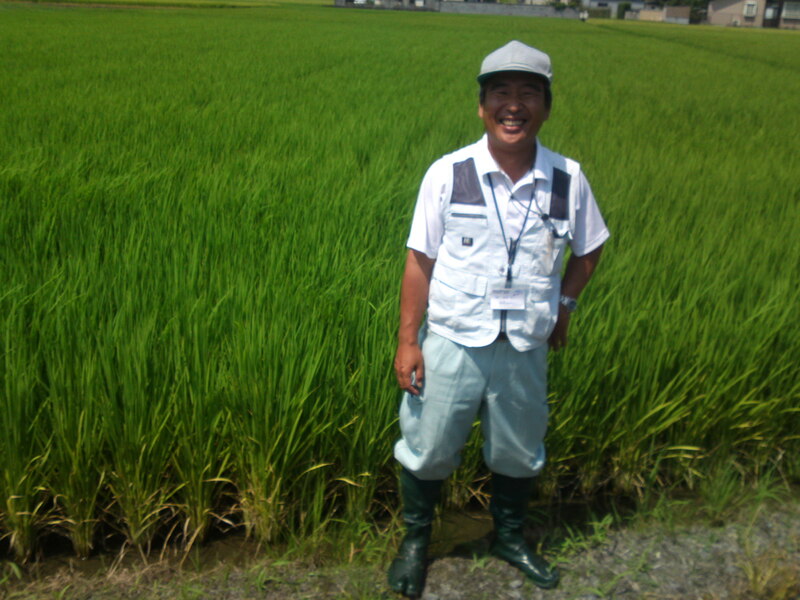 Shizuoka Agriculture: Akihiro Matsushita: Organic Sake Rice Grower in Fujieda City! Akihiro Matsushita/松下明弘, Yuuji Miyata/宮田祐二 and Densaburou Aoshima/青島傳三郎! Akihiro Matsushita is a true pioneer! 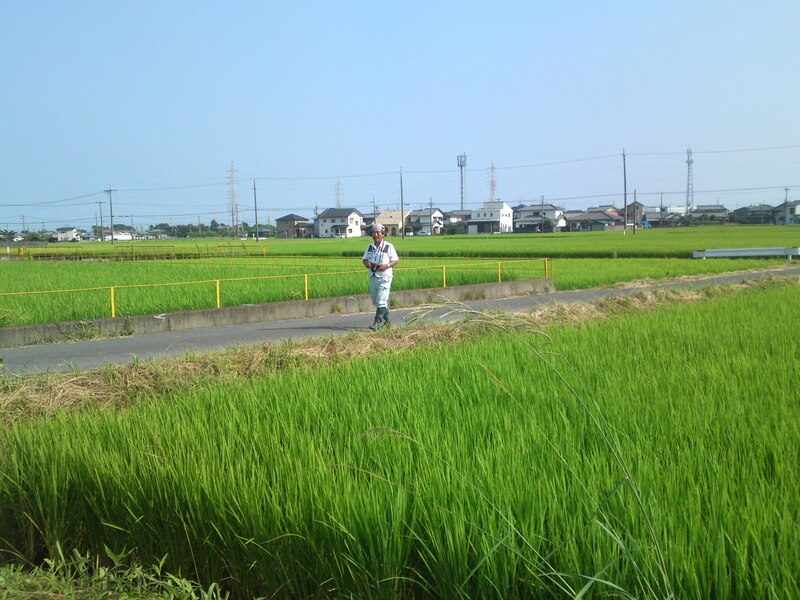 No less than 17 years ago he decided to grow all his rice organically, a revolution at the time that did not please many people in the very closed world of Japanese farming! 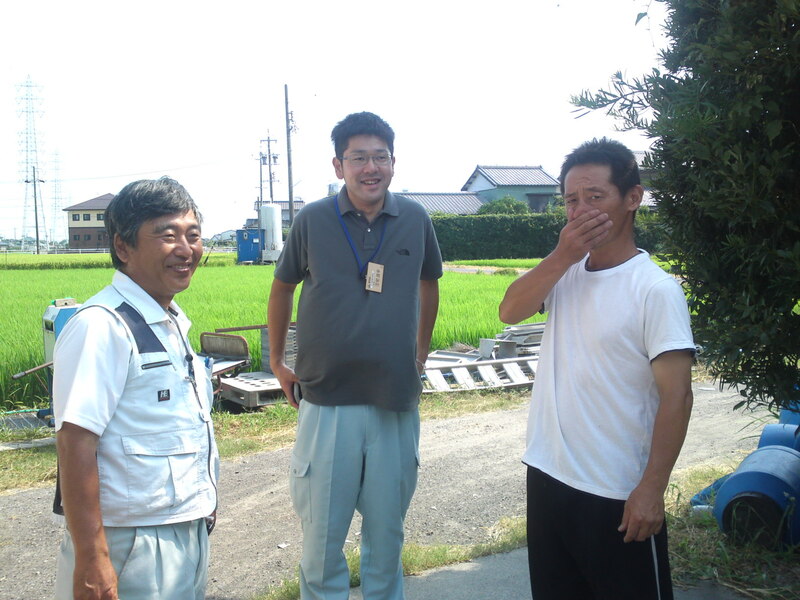 15 years ago Akihiro contacted Densaburou (Sake Brewmaster’s name) Aoshima of Aoshima Sake Brewery in Fujieda City to aks him if he would be interested in creating sake with truly organic rice. 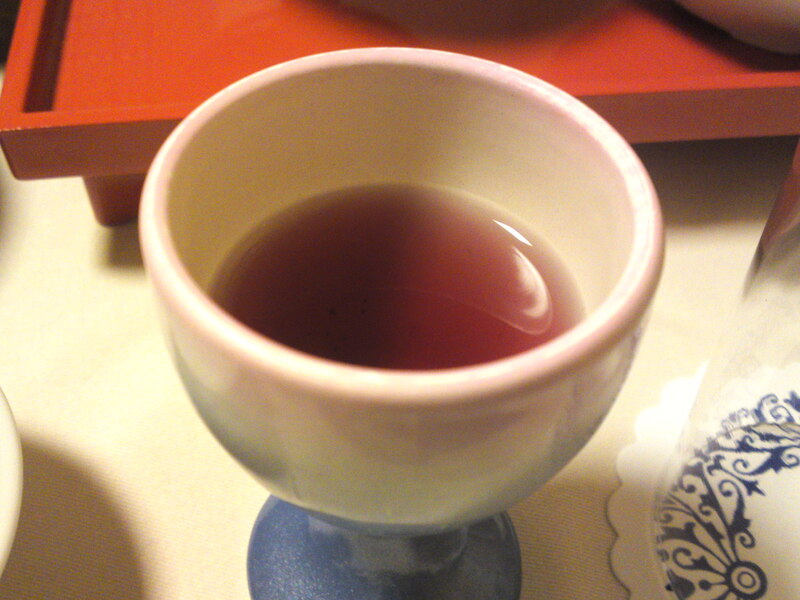 Densaburou is also a true pioneer in his own closed Japanese sake world who gladly accepted the challenge. And it certainly was a challenge! 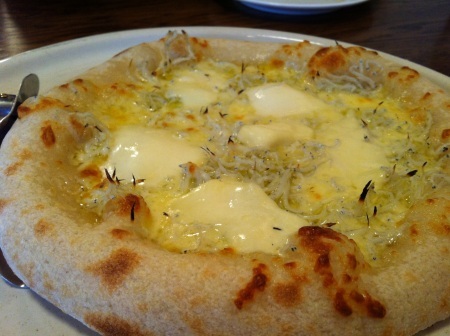 Aoshima Brewery in Fujieda City! 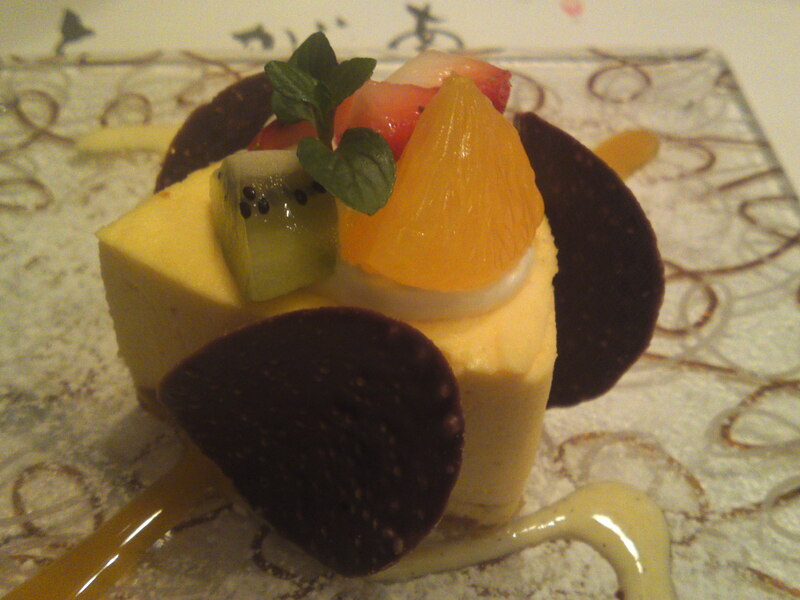 Kikuyoi/喜久酔 is their main brand name! I’ve known Densaburou for quite some time now, and the fact he speaks fluent English does help when I introduce him to foreign fans of his nectars! 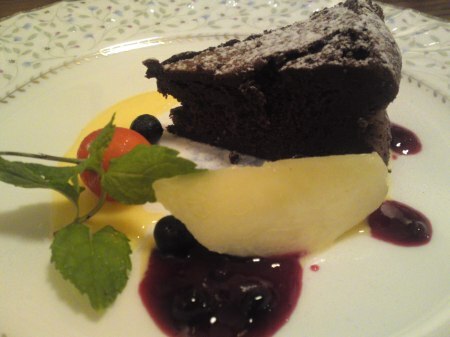 Whatever the occasion, this is Japan, and nothing will start before business cards have been exchanged! The fact I know quite a lot of people in the Japanese sake world in Shizuoka Prefecture even helps with my Japanese friends and colleagues. Before meeting Akihiro Matsushita in his farm, Yuuji Miyamata, the man in charge of the development of Homare Fuji Sake Rice in Yaizu City and Ryohei Miyake, an official from the Shida Haibara Agriculture and Forestry Bureau joined me to visit Densaburou at his brewery as we were all going together to Akihiro’s place. 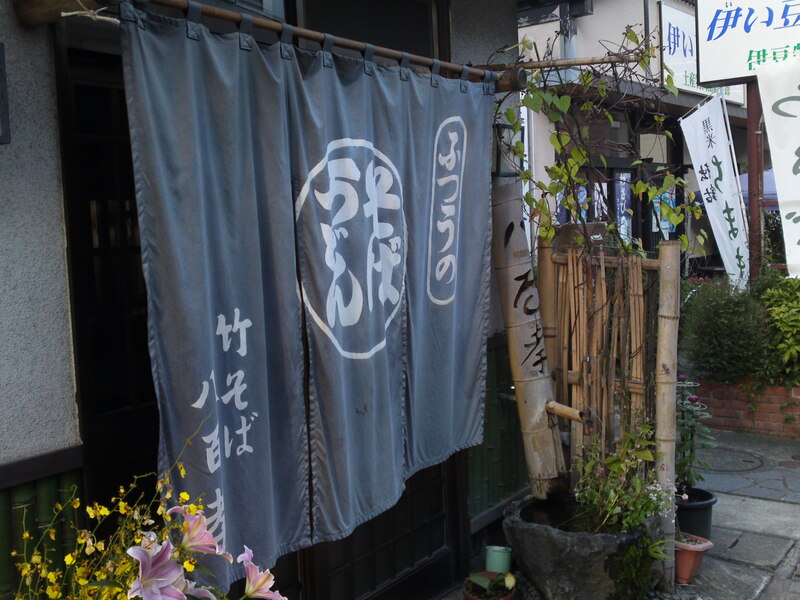 Densaburou does not use the Homare Fuji Sake Rice in his brews but he entertains warm relations with all people concerned with the sake business in his region. 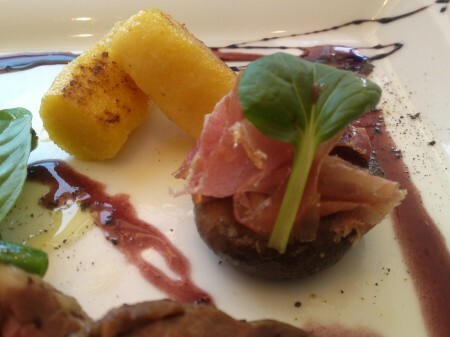 Akihiro is a shy gentleman who will nonetheless quickly open and talk passionately about his trade. And you certainly need to be passionate and extremely knowledgeable to convince people in one of the most conservative regions of Japan! 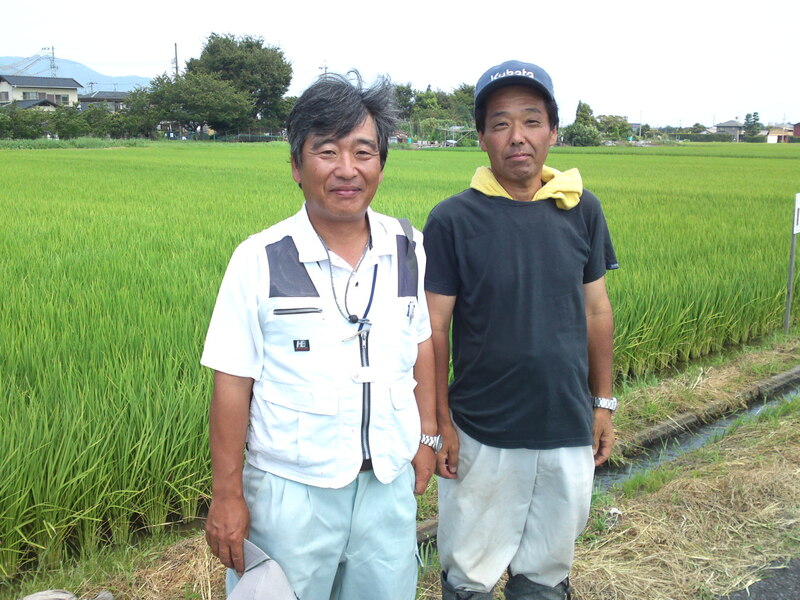 But since then Akihiro has been recognized and accepted as a true grower as amply proved by his JAS Organic Grower Recognition and his Shida EM Organic Agriculture Association Chairmanship! Not only his fields, but surrounding areas have to be kept clean of any chemicals and unwanted materials. 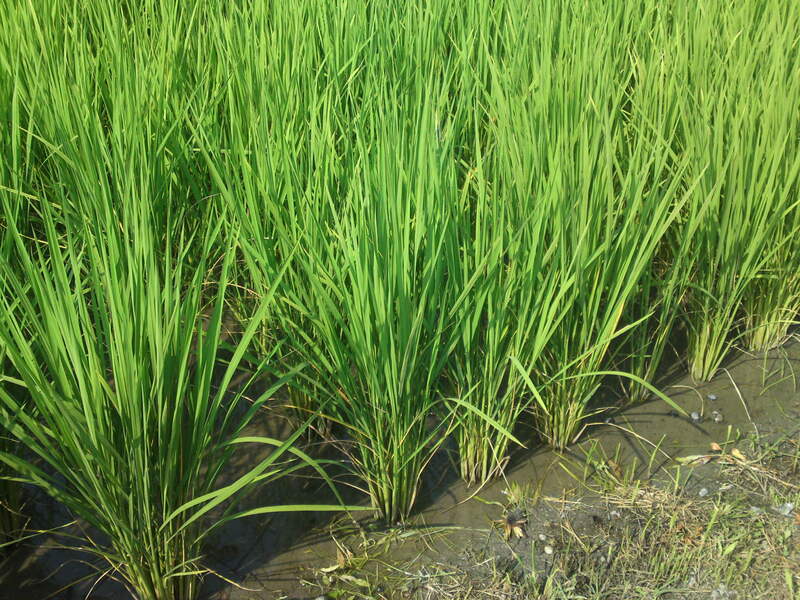 Even so, rice growing within a few meters of the perimeter of his fields will not be sold or used! 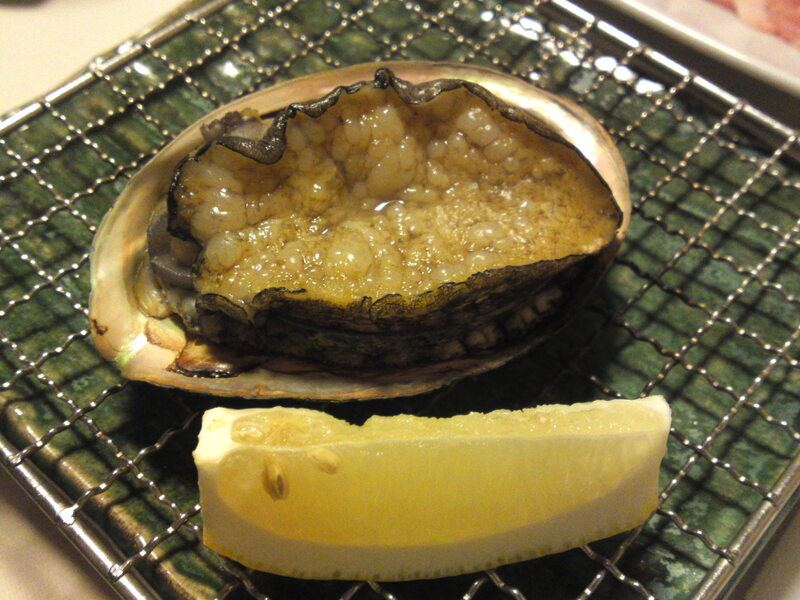 Yamada Nishiki, the most famous sake rice variety in Japan! 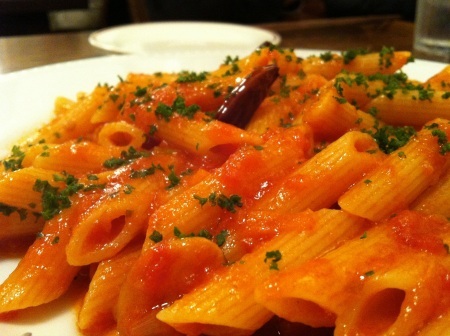 The grains will appear end of August! 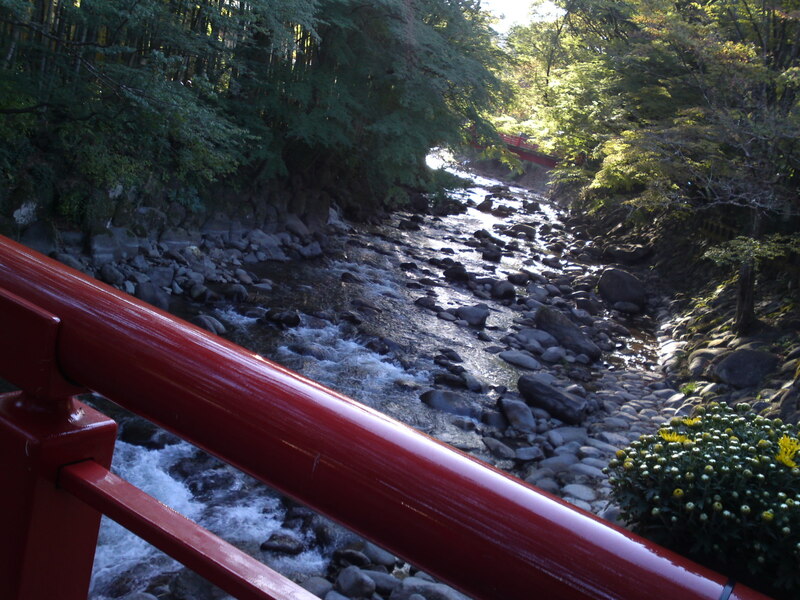 The soil being part of the Ooigawa River bed is sandy. The same sand is river sand formed by the constant rubbing of stones. 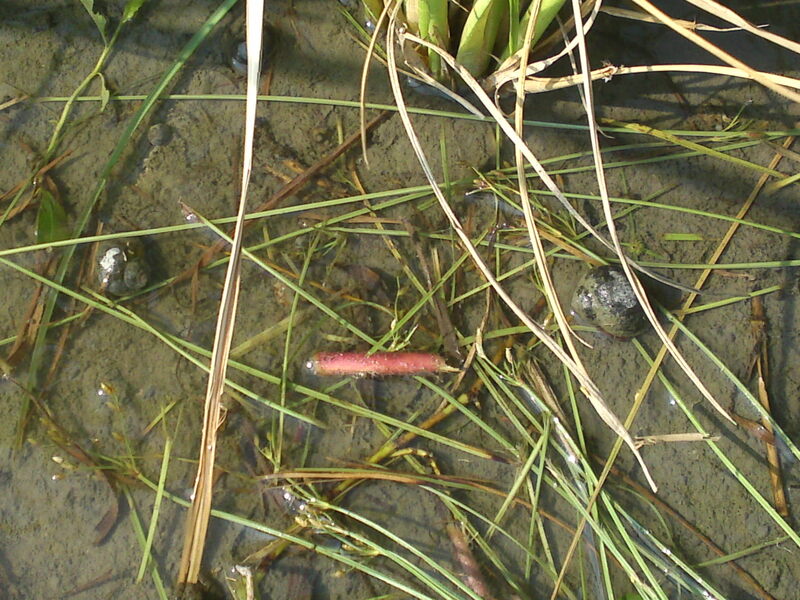 A single look at the water and soil will tell you this is organic environment with all these bugs and snails! 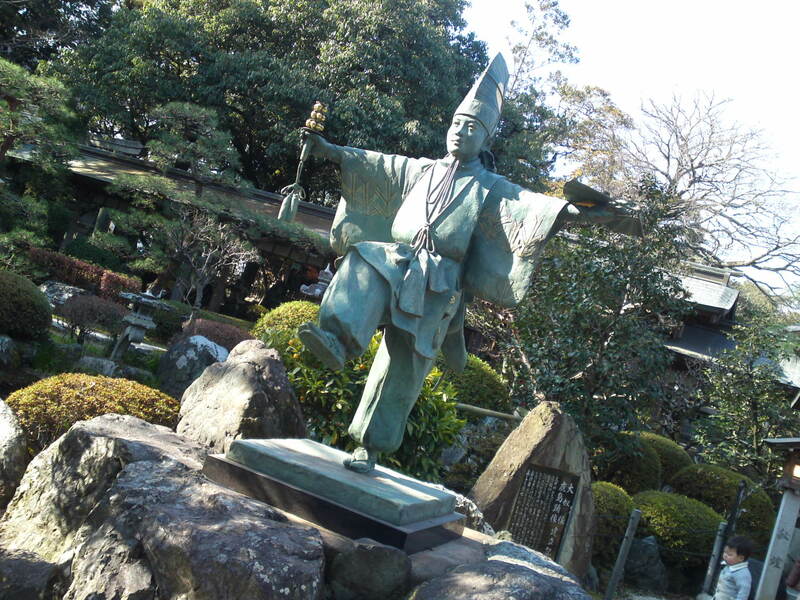 Akihiro and Densaburou had once thought of ducks to keep their fields clean of bugs. Unfortunately the local stray cats put an end to the trials! 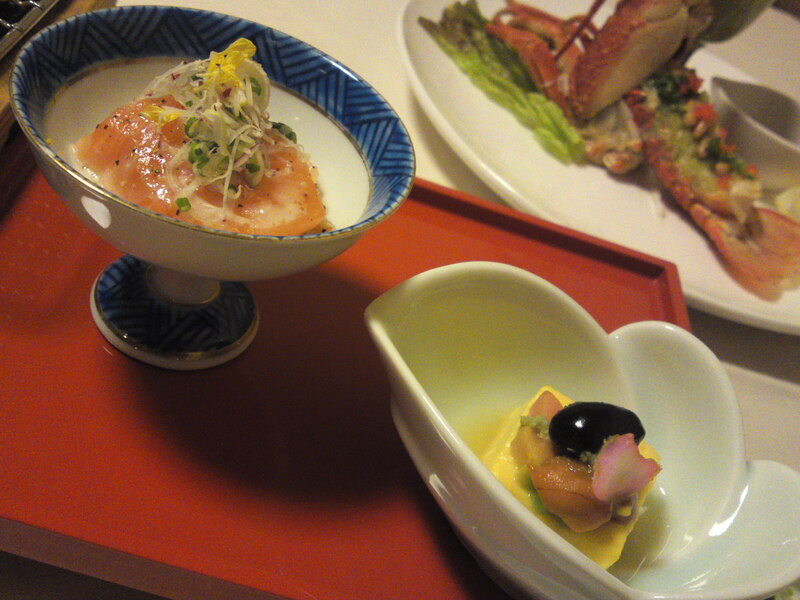 Although Mr. Miyata’s field is not concerned with Yamada Nishiki Sake Rice, his expertise is always welcome! 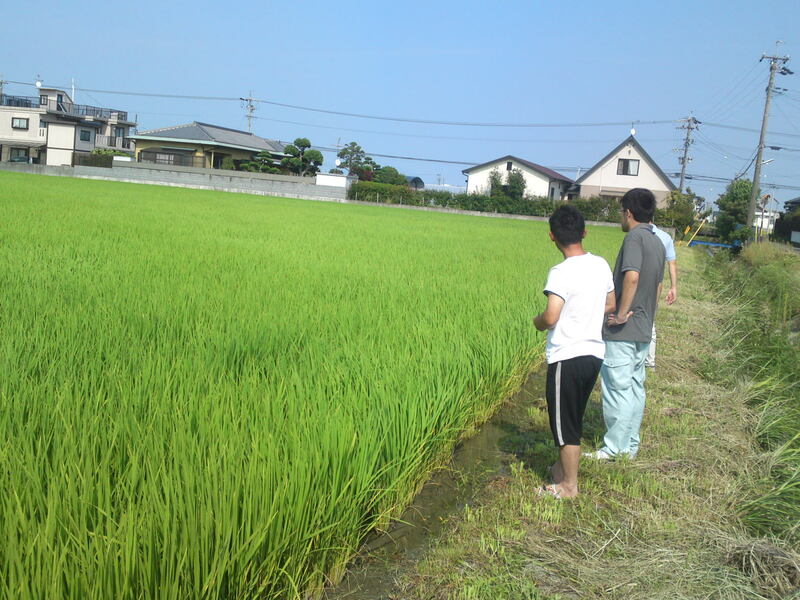 Akihiro’s fields of organic sake rice and those or normal edible organic rice occupy a lot of land here and there. I asked him if he would be interested in exporting some. He replied that he wouldn’t have enough land to do so! An unequivocal proof of his peers’ and customers’ recognition! Everyone soon forgot me so passionate their discussions had become! 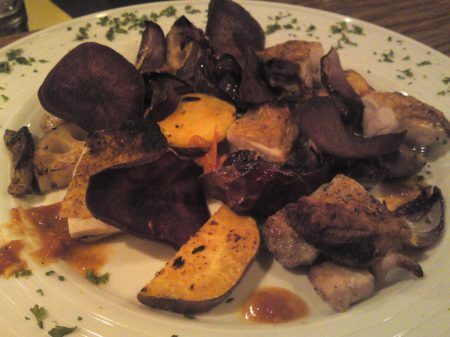 For all his extremely busy life, Akihiro still finds enough time for constant research: organic black rice! This passion and thirst for new solutions just proves that Japan and its people, for all the cataclysms that regularly visit them, might bend now and again but will never break like the stalks of their rice! 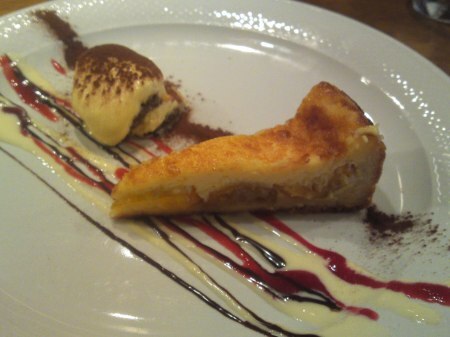 Smoking allowed BUT Non-smoking until 20:00 everyday! 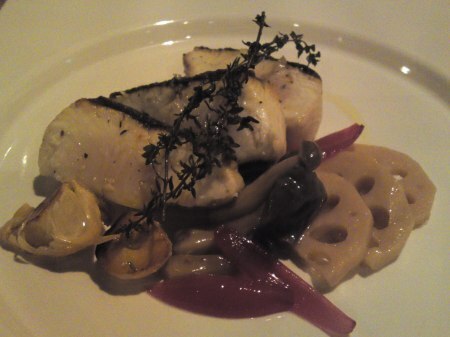 Strong points: Many local products be they from the land or the sea. 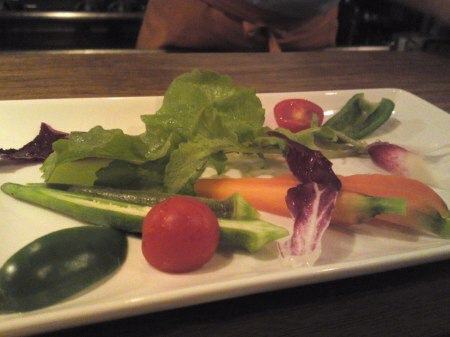 Organic vegetables. Car park. 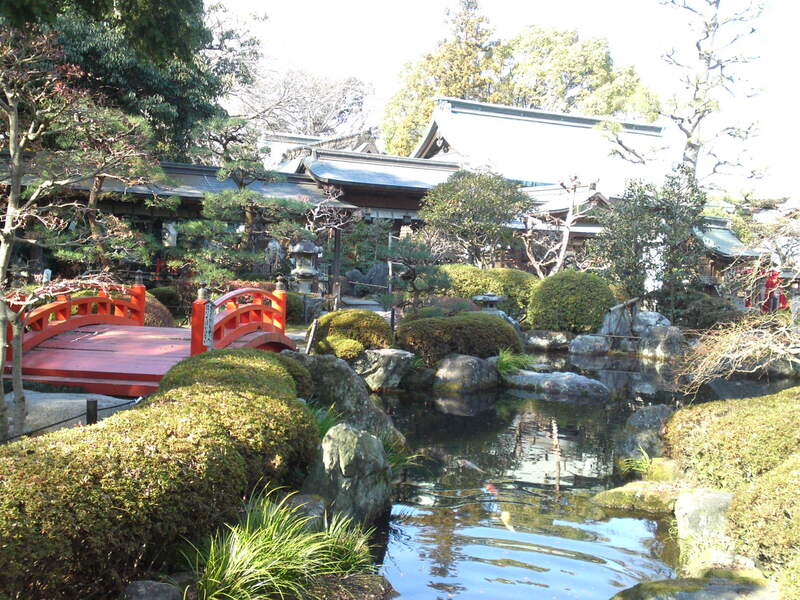 Ooi Shinto Shrine in Shimada City! 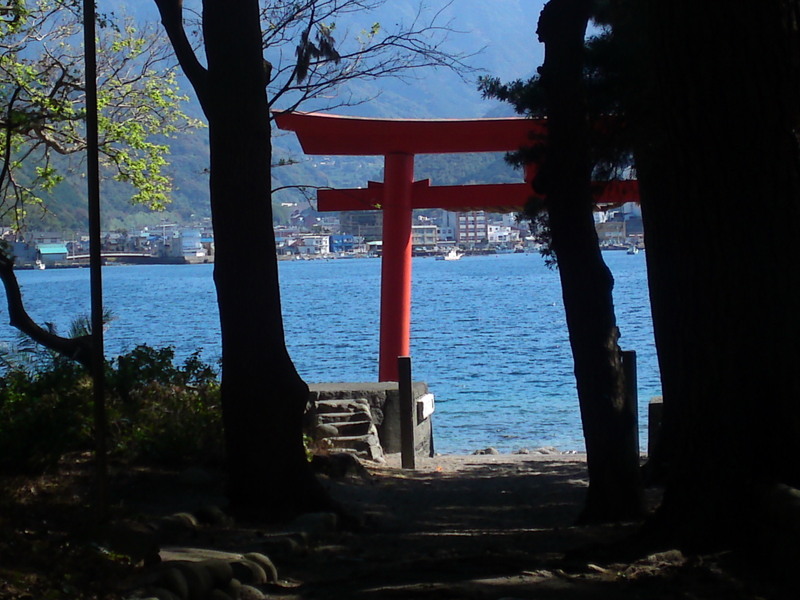 Whatever City you visit in Japan, down to the smallest mountain village, you will discover at least one Shinto Shrine venerated by the locals. And if you are lucky enough to visit them during traditional holidays or festivals they become an unending source of lore study and photography! 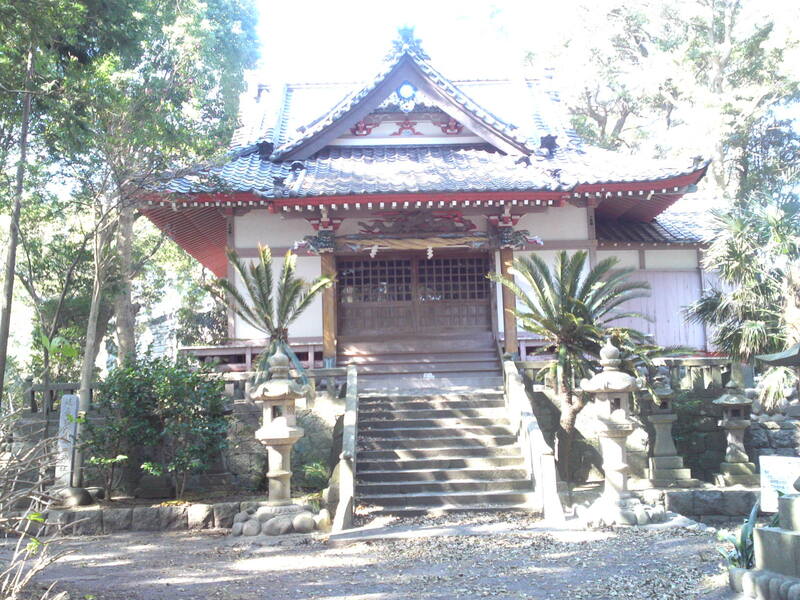 How do you recognize a Shinto Shrine from other cult sites? 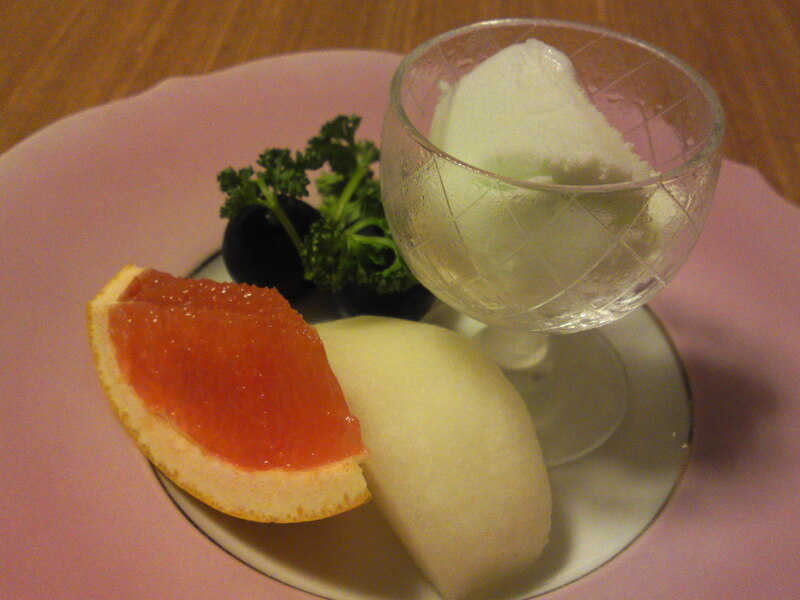 It is actually very simple even if you can’t read any Japanese! 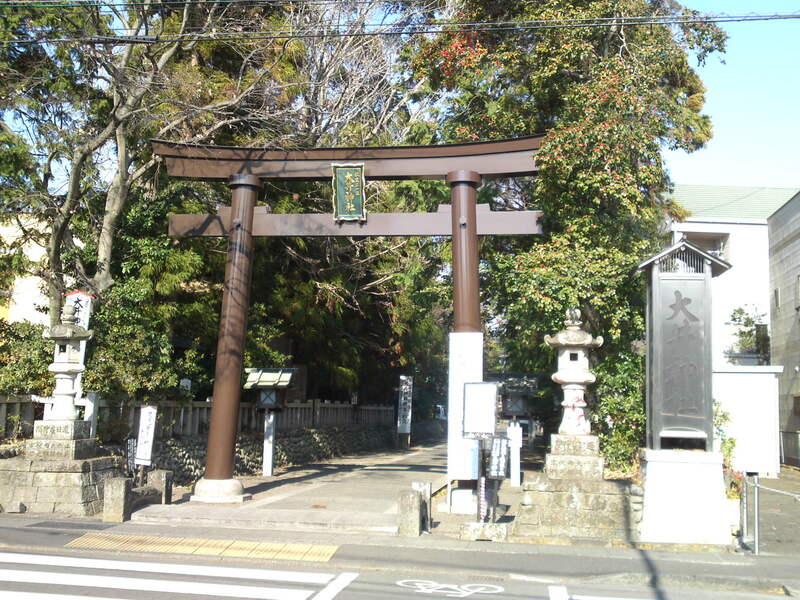 1) The entrance is always marked with “torii/鳥居/portal”, however tiny the shrine. 2) You will usually find a hand-washing fountain/basin. 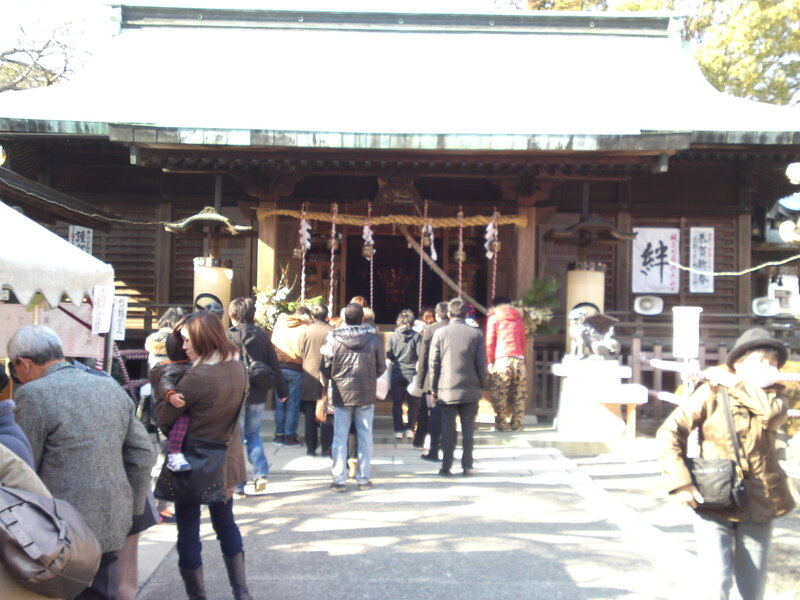 3) Entrance is free contrary to some of the shrines of other beliefs. Actually you will often see children playing in their yards in daytime. 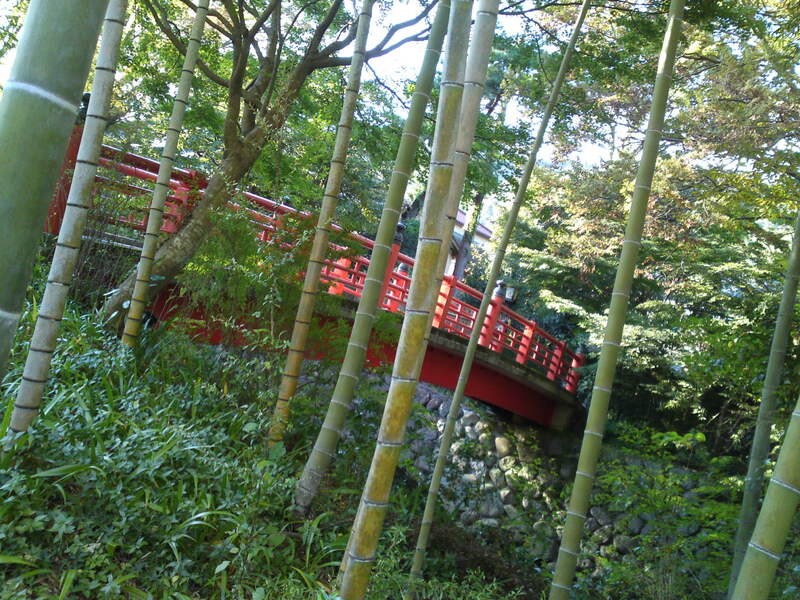 Now, if you happen to pass through Shimada City, by road or train or on your way from the International Airport take a couple of hours off for a leisurely visit of Ooi shrine/大井神社 as it is only a 10-minute walk from the railway station! It is just the right size and a true representative of the long local history and culture. 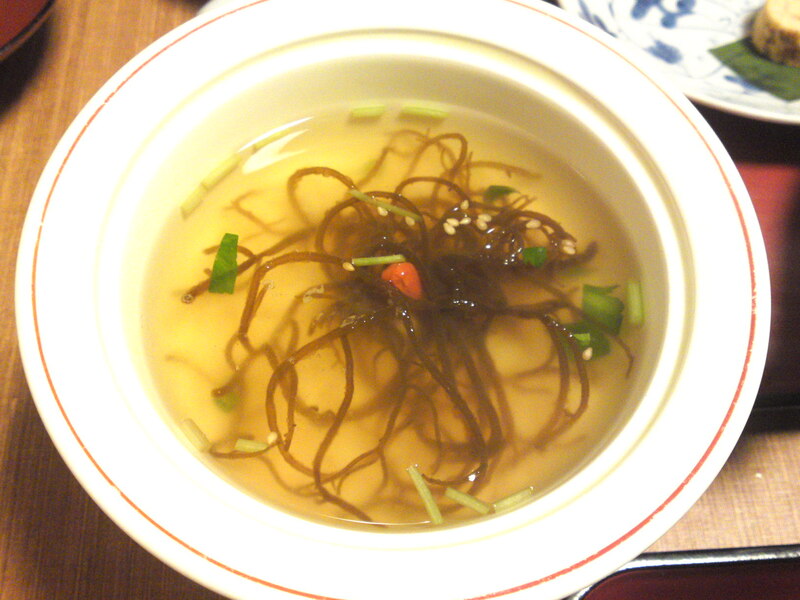 It is also within walking distance to places such as Setsugekka Soba Restaurant where you could take a beautiful lunch before proceeding to the next stage of your trip through Shizuoka Prefecture and Japan! 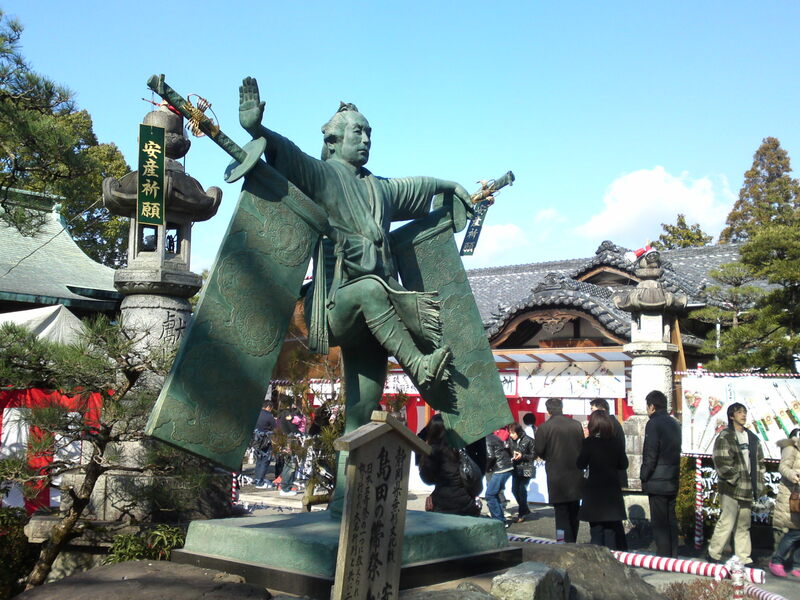 Shimada is celebrated for its Shimada Obi/belt Matsuri/Festival, an event officially designated as one of 20 strangest/most original festivals in Japan. 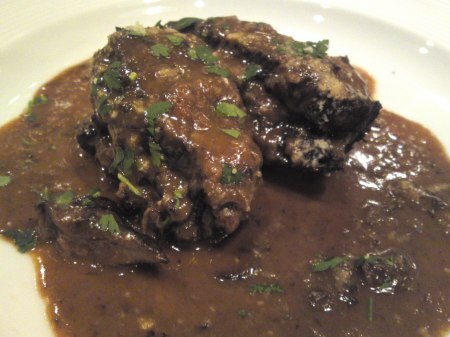 It is held every 3 years on the Years of the Tiger, Snake, Monkey and Wild Boar! A young dancer of the other celebrated Shimada Festival, the 300-year old Daimyo Gyoretsu, which imitates the procession of a grand jumangoku (one hundred thousand koku, units of rice) daimyo with a total of 250 marchers stretching over 500 meters! 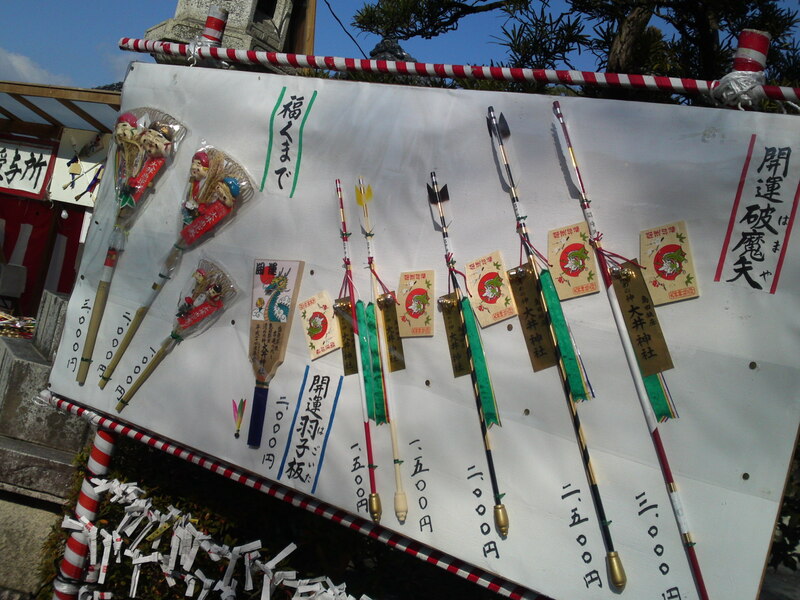 The New Year is an important time for the Shrine to collect money through the sales of New Year decorations! 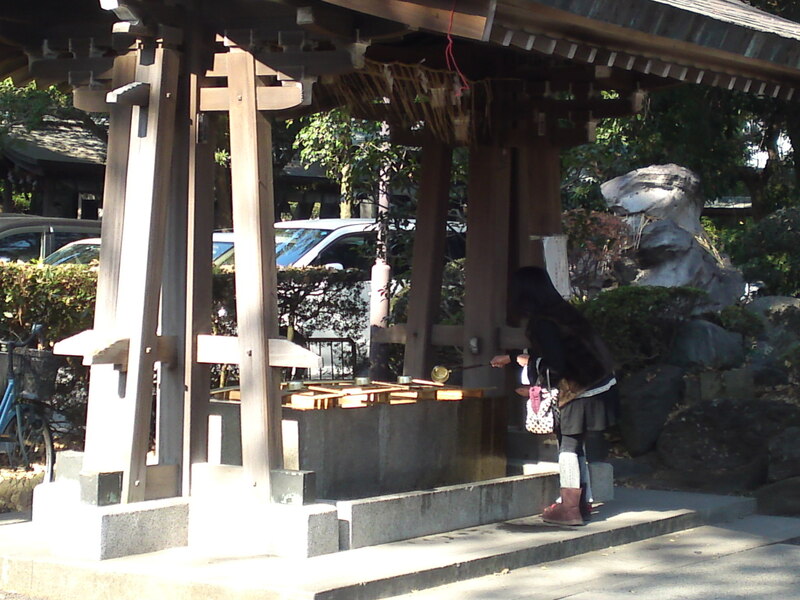 The New Year is a great time for photography when people of any age and station visit the shrine! 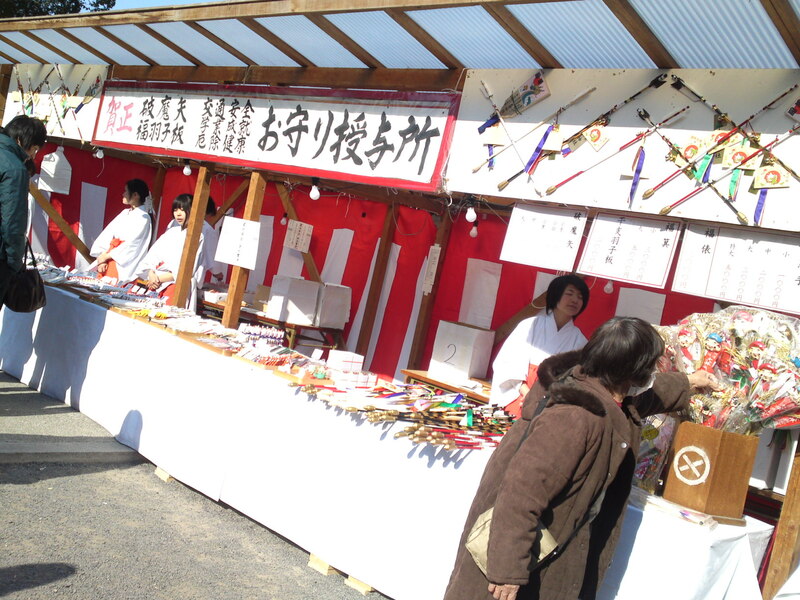 New Year Decorations sales booth. 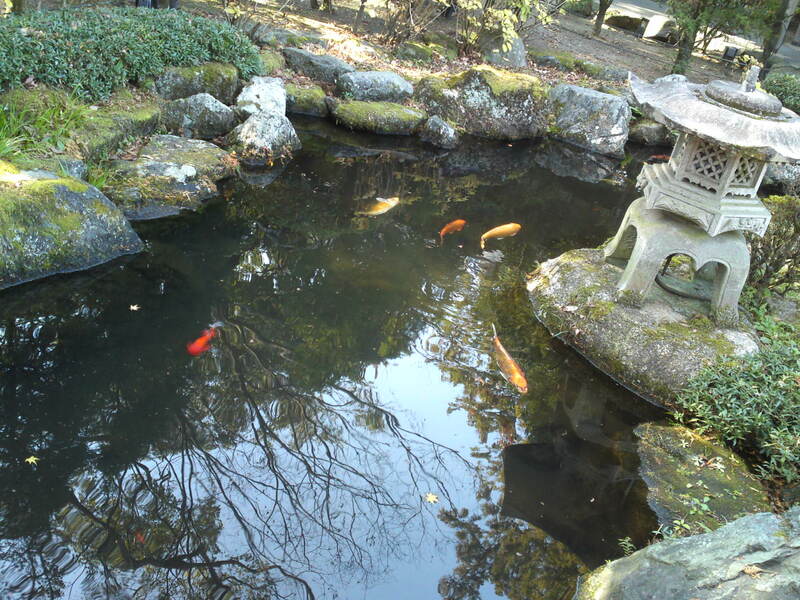 The Shrine has a small and cute garden with a carp pond and arched bridge! 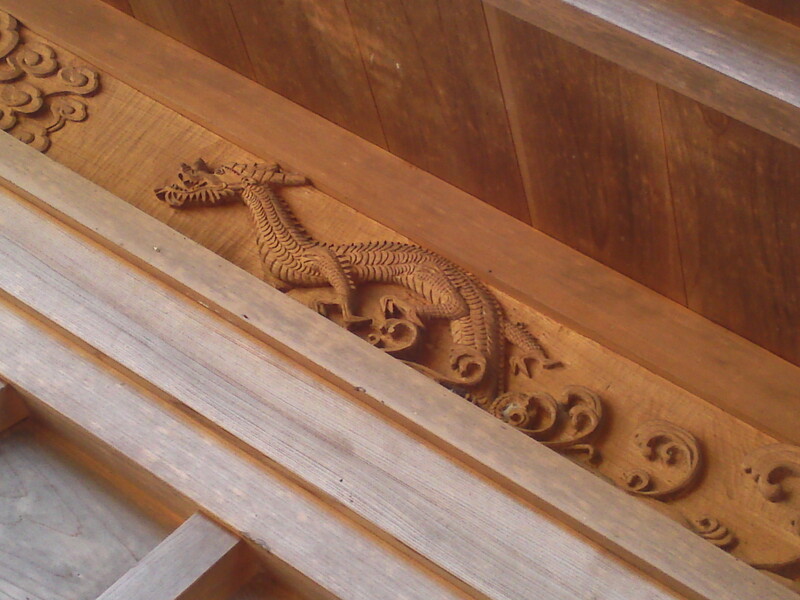 2012 being the Year of the Dragon, so it would be a good idea to search for hidden representations of the fabled creature! 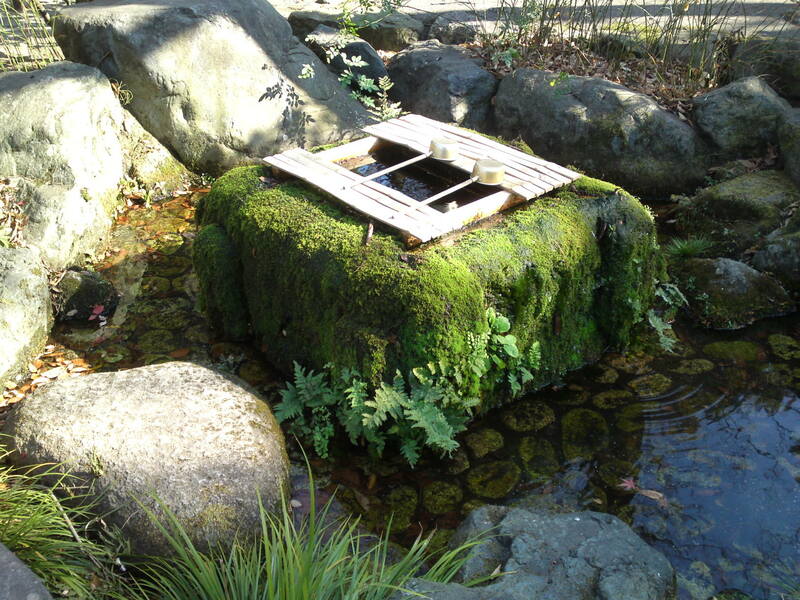 An ancient hand-washing basin inside the garden! 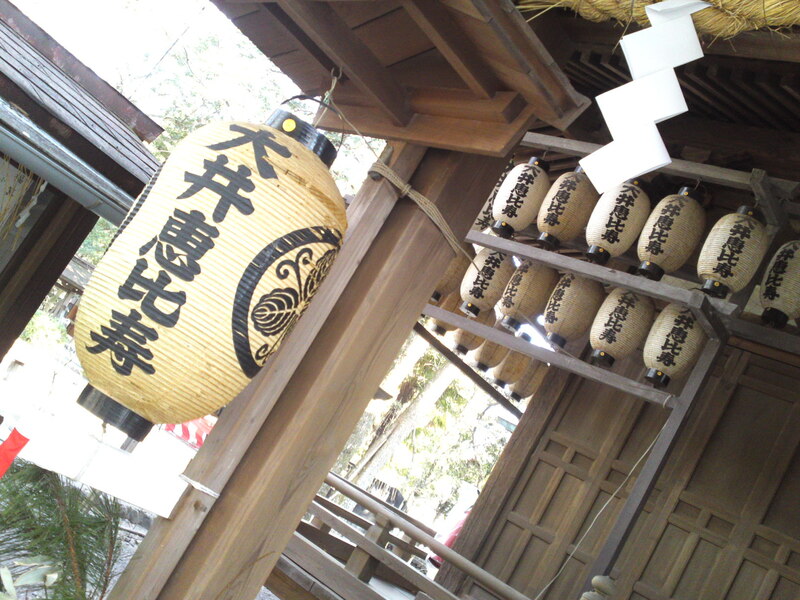 Traditional paper lanterns/chōchin (提灯), make for great photographs! 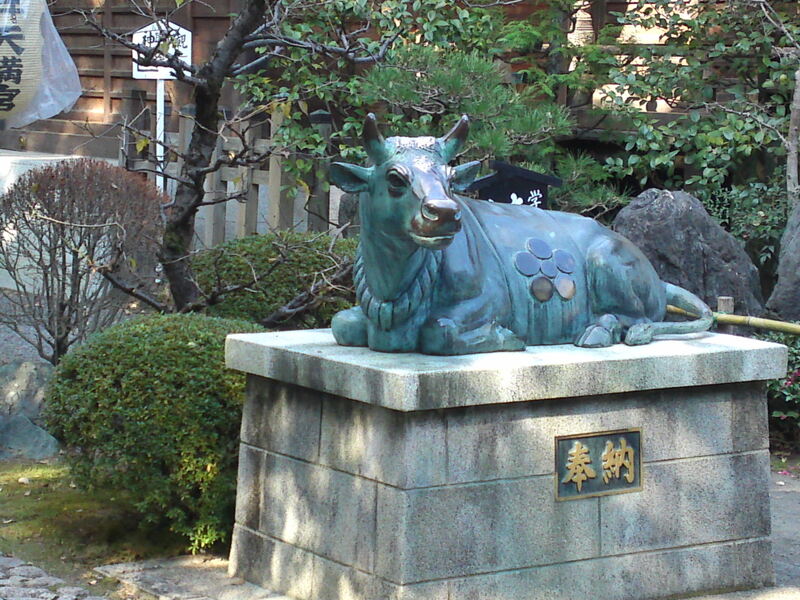 A sacred cow, symbol of fertility and wealth! 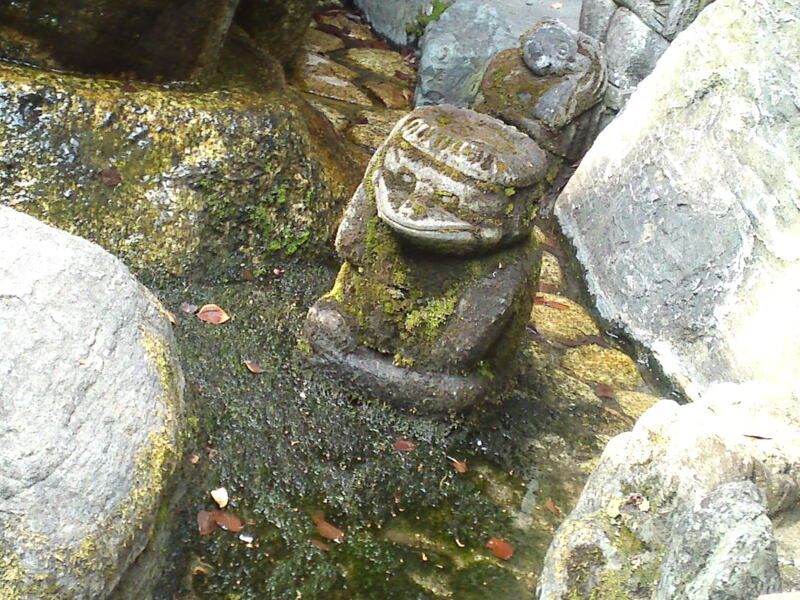 Keep your eyes open and you will discover some very intriguing statues such that of a “kappa/河童”, the Japanese cousin of the Scottish kelpie! 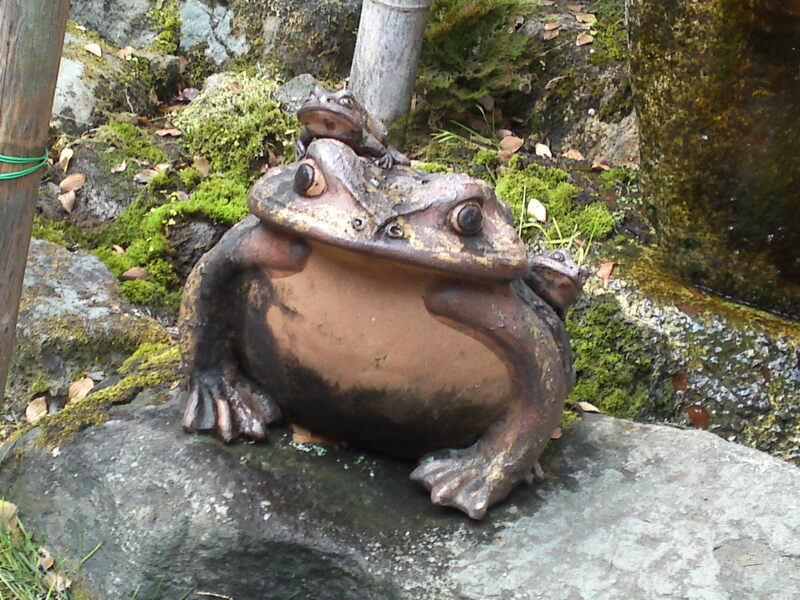 The French will be glad to discover frogs everywhere! 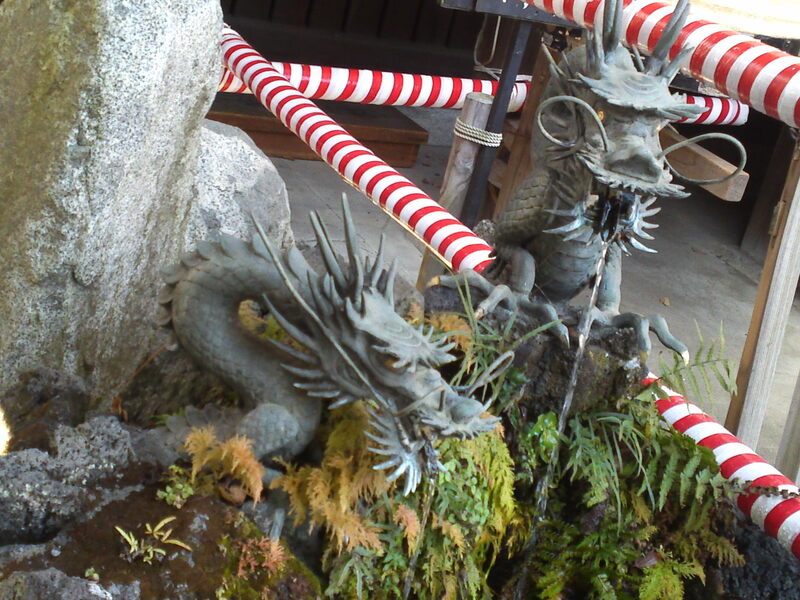 More dragons spouting water instead of belching fire! 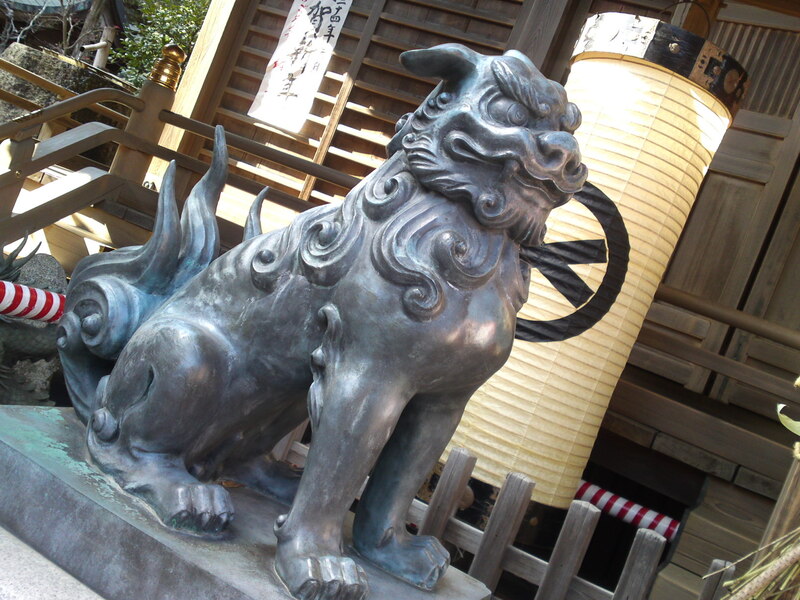 Lions help the dragons guard the shrine from evil spirits! Looking forward to meeting you at the next shrine! 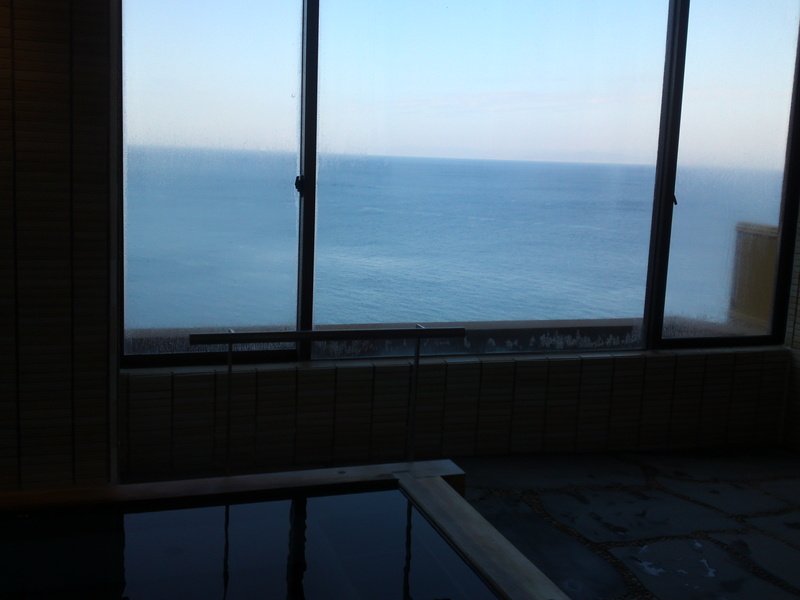 Izu Peninsula Hotspring Resort: Hotel Isaba in Heda! 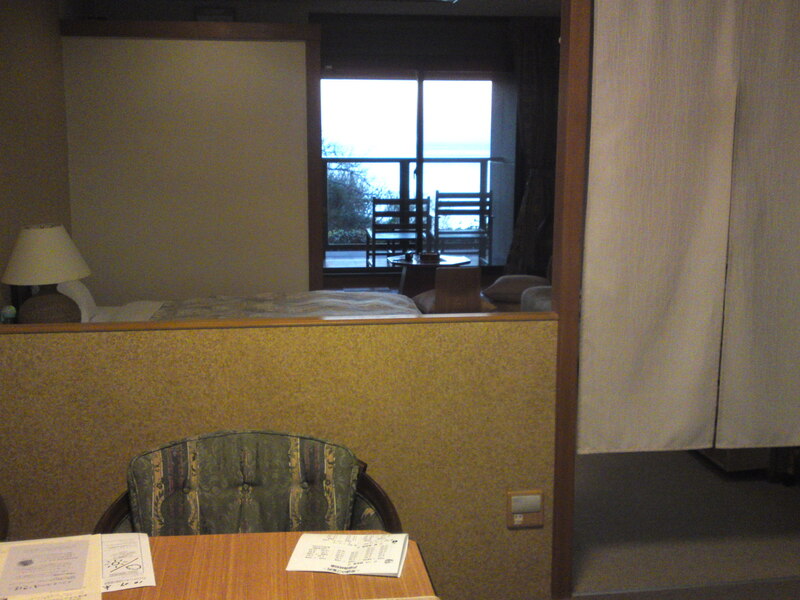 The best time to check in a hotel in Heda is at sunset when you can admire the sinking sun over the horizon from your windows! It is the more striking when you squid fishing boat cutting the sea under a sinking flaming orb! 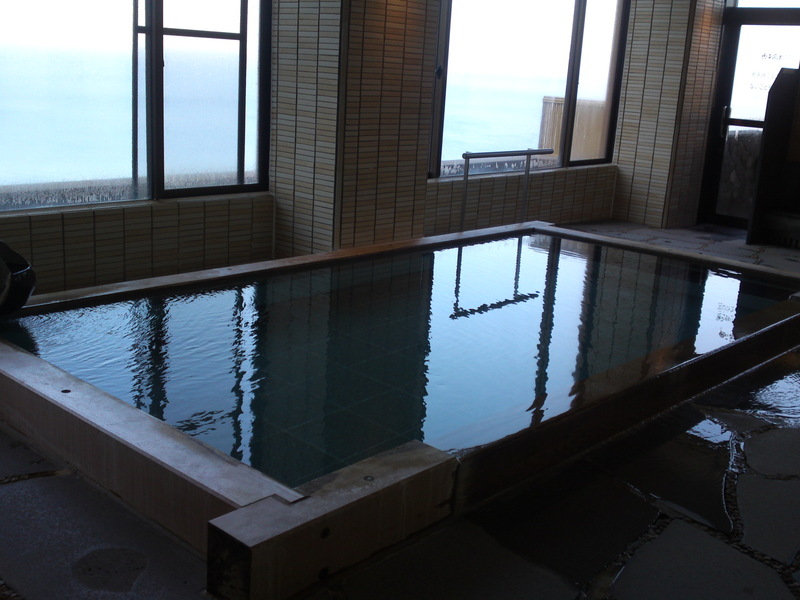 Hotel Isaba is one of the most popular hotspring resort hotels in Heda, Izu Peninsula, thanks to its location overlooking the great sea expanses. 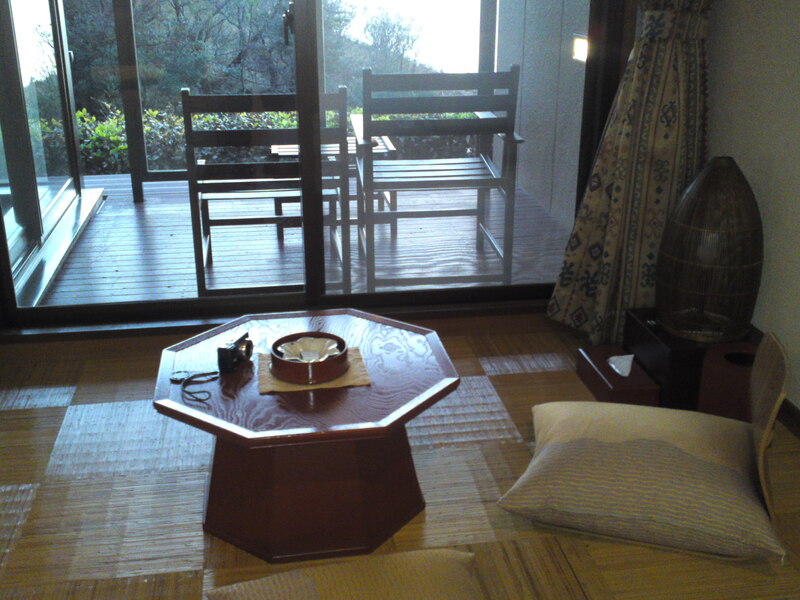 One can choose a room Japanese-style or Western-style. 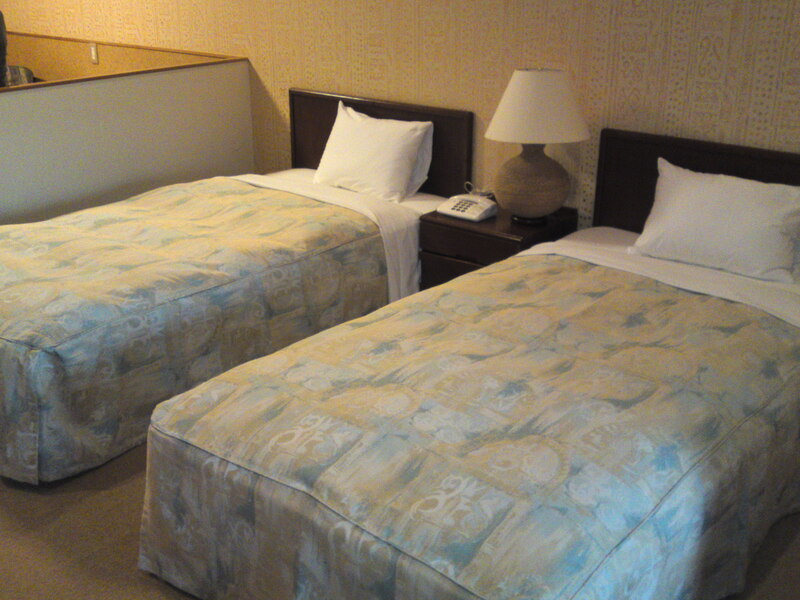 The hotel is a bit kitsch and definitely from another age but comfortable with all amenities. 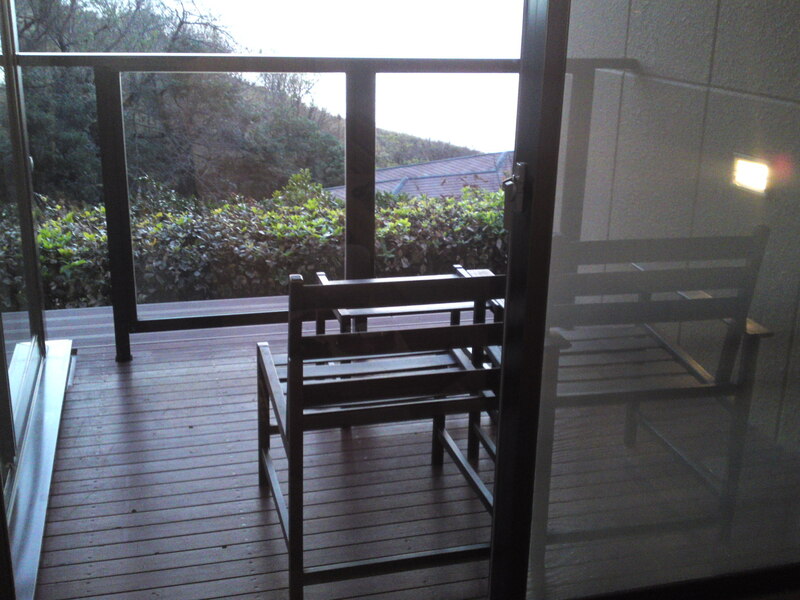 The better rooms have a nice, if small, kind of terrace opened onto a great sea landscape. Cozy place to enjoy a drink or a book in summer! 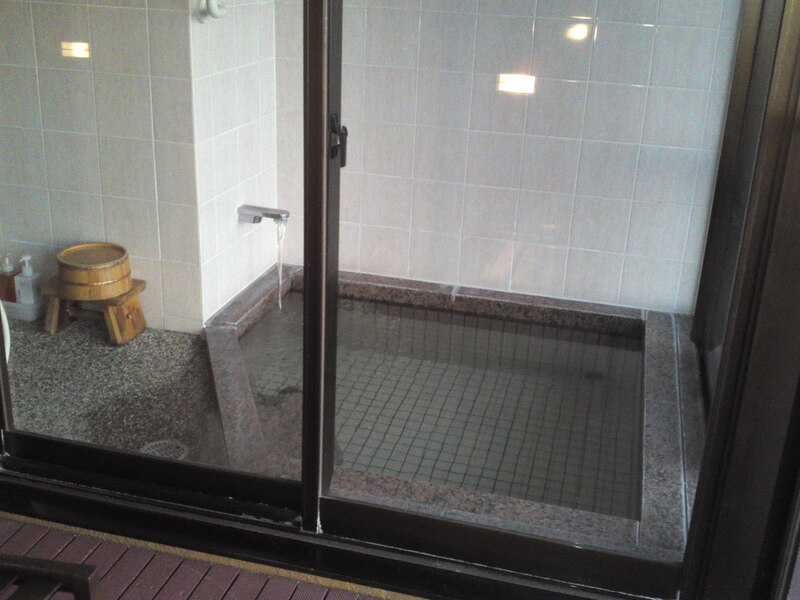 The private hotspring bath, small by Western standards is big and deep enough for two adults! 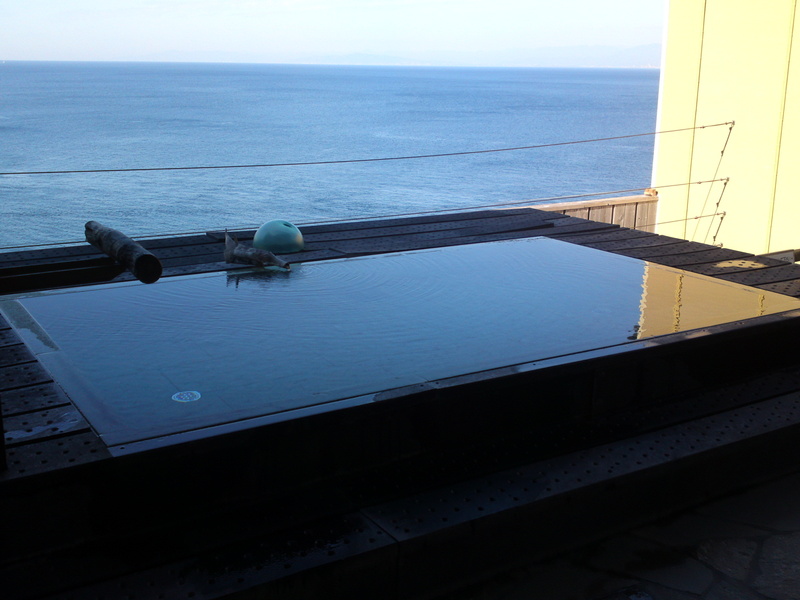 Like the terrace it opens onto a sea landscape particularly striking at dusk and dawn! 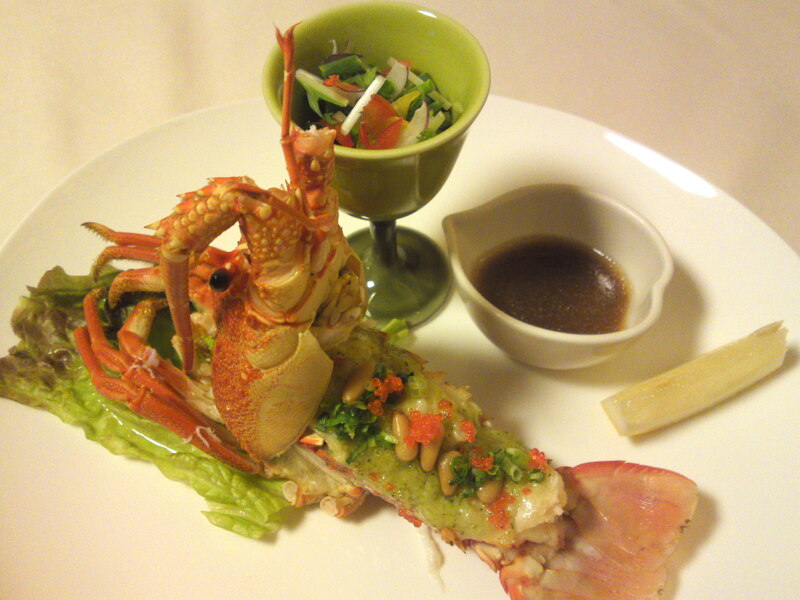 The dinner served inside your room over a table large enough for 4 adults is a big affair! 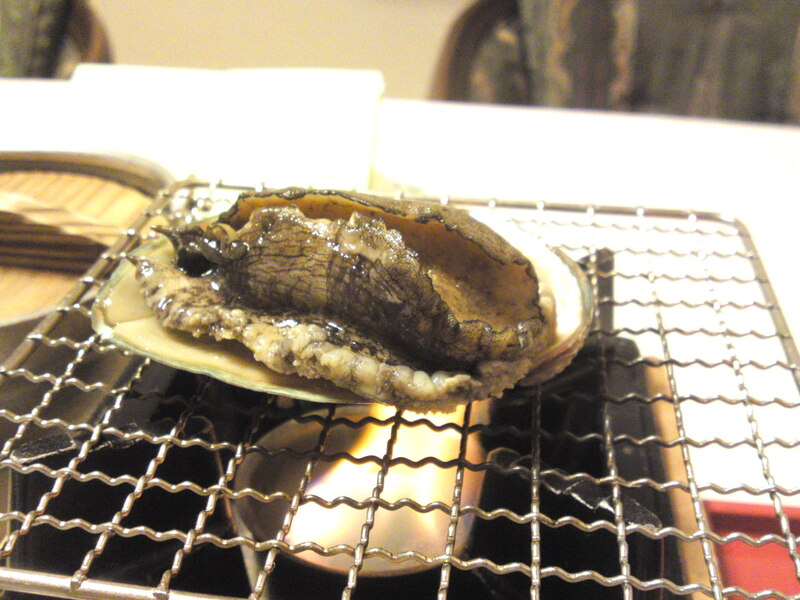 Live abalone you grill by yourself after listening to the maid’s instructions! It’s dancing over the fire! 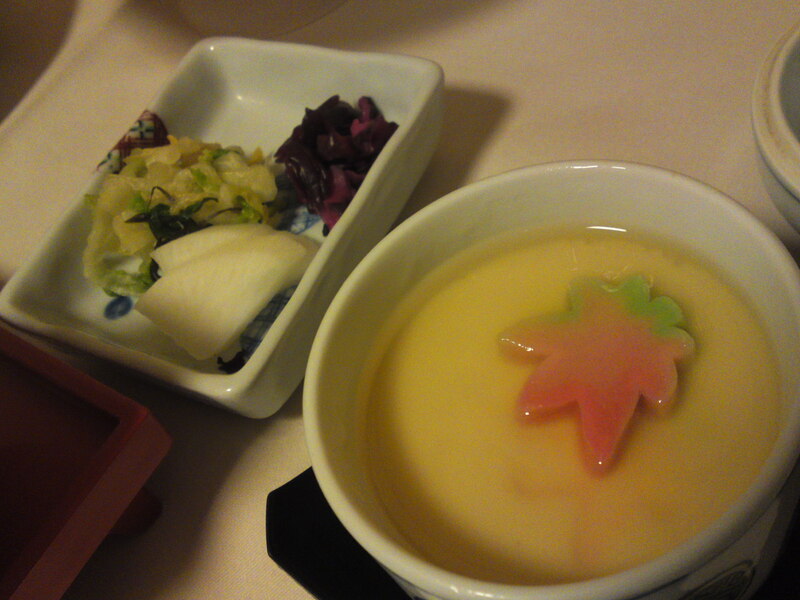 Chyawanmushi/Japanese hot salted pudding and Japanese pickles. 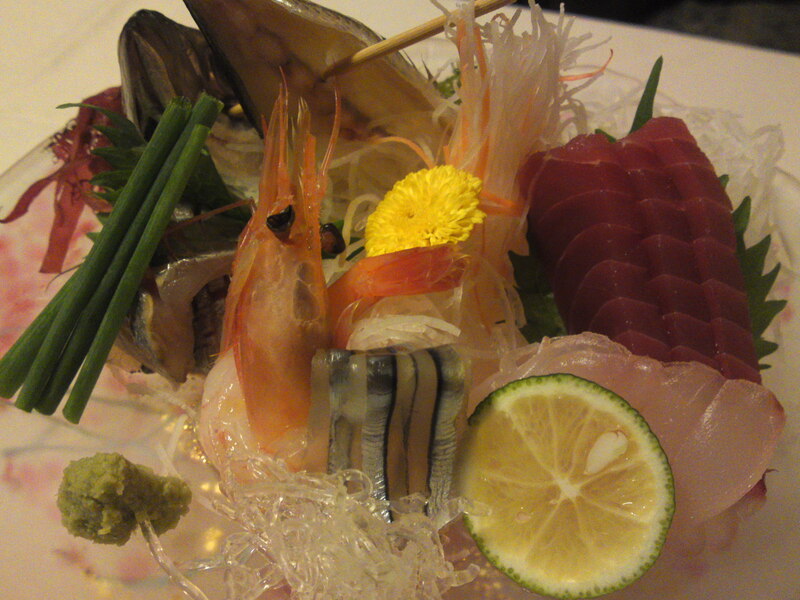 Sashimi plate from Suruga Bay! 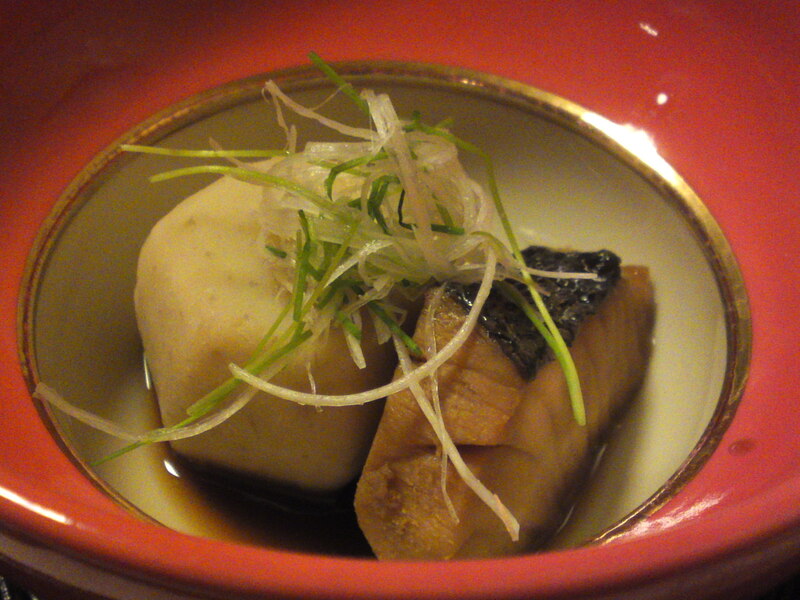 Simmered “Medai” seabream and taro. 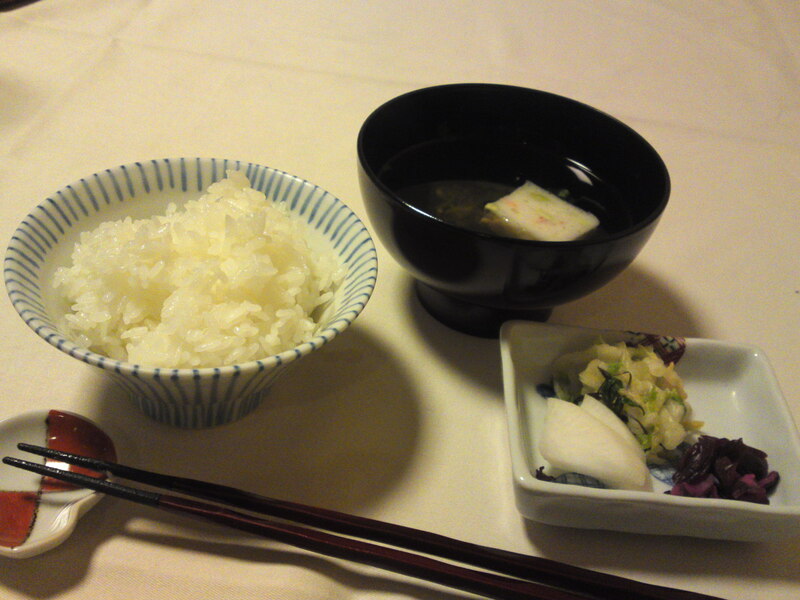 Plenty of rice and miso soup! 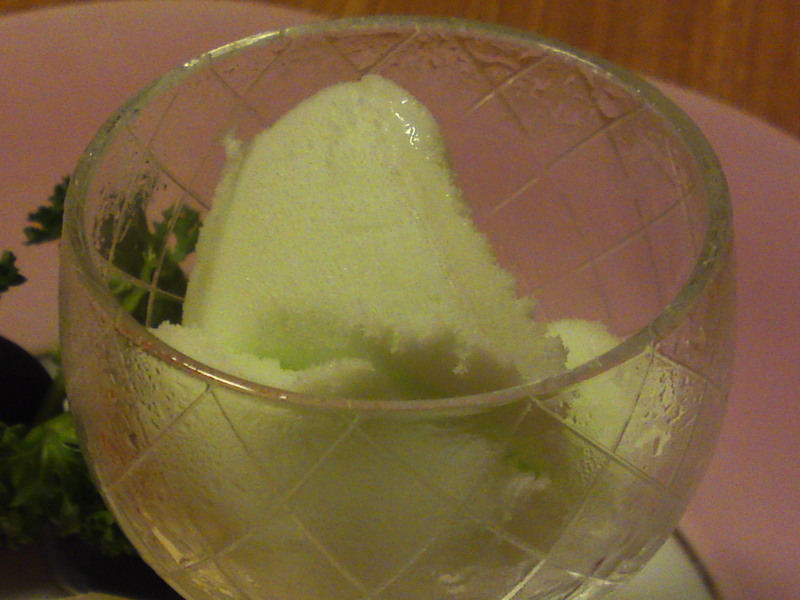 The specialty of the house: Suruga Bay sea-salt sorbet! 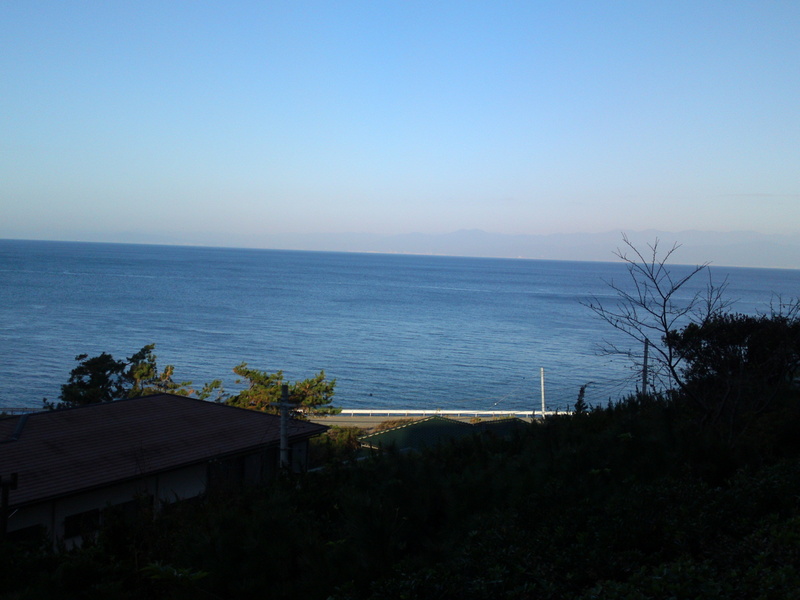 Wake up early enough in the morning to enjoy a great ocean view! 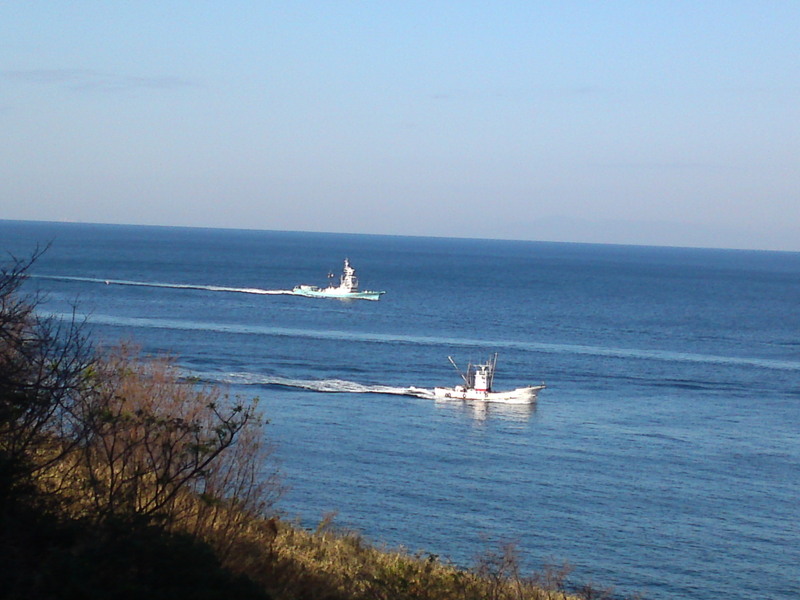 And catch the sight of the returning squid fishing boats! 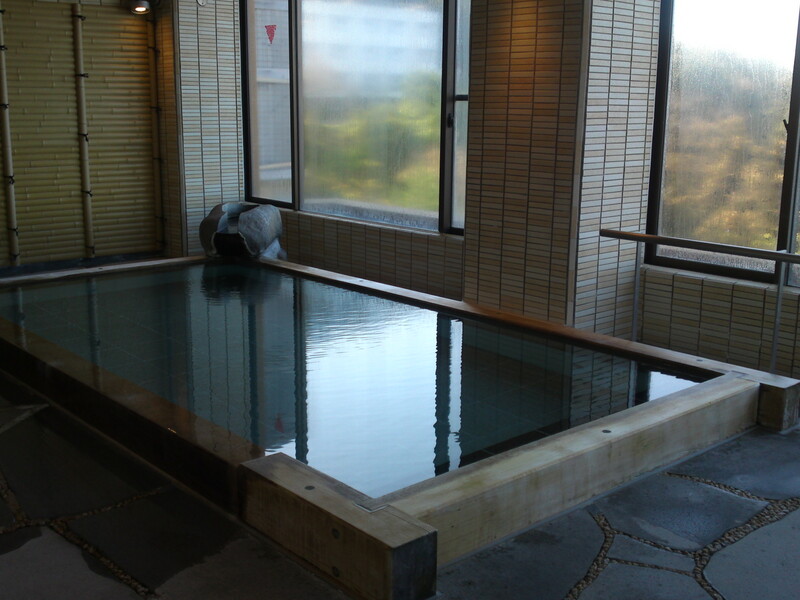 And then first pay a visit to the large hotspring bath on top of the hotel! Don’t forget to scrub yourself before taking a dip! Large bay windows will allow you to enjoy a great view again at the same time. 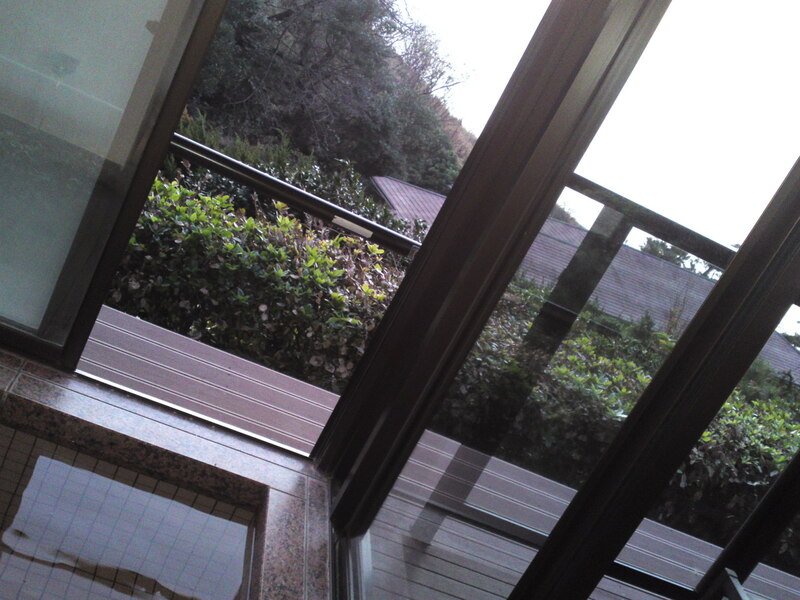 But your hotspring experience will not be complete with another body-relaxing dip in the “rotenburo/open-air bath” outside the main bathroom whatever the season or weather! 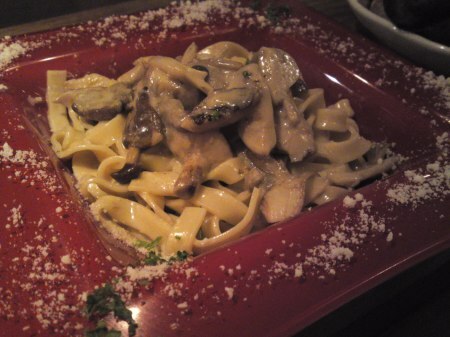 Breakfast is simply enormous and should last you half a day! 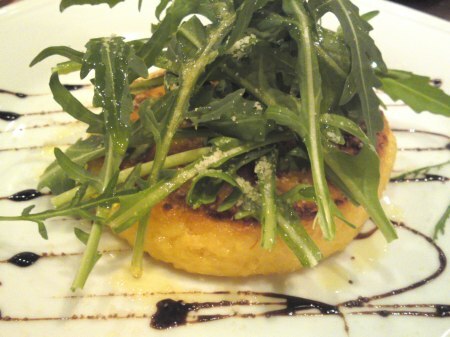 And very healthy too with local ingredients! 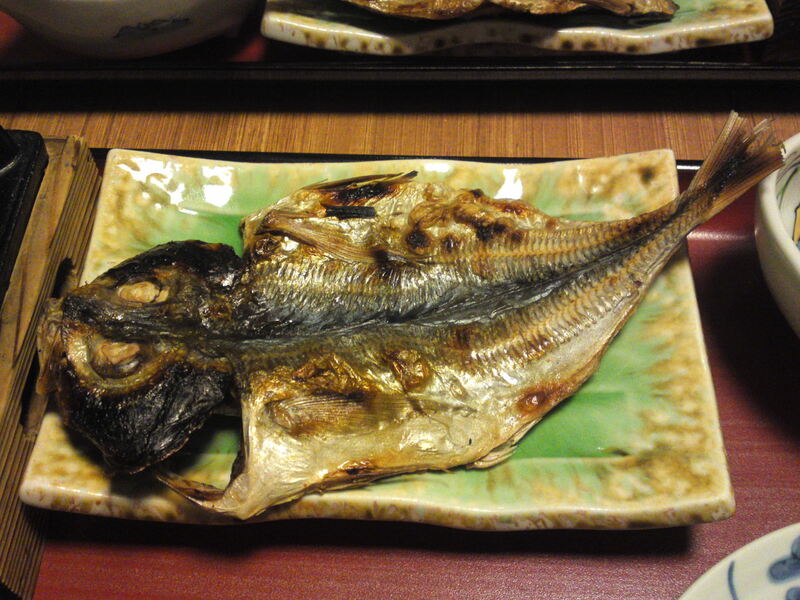 Horse mackerel from Suruga Bay. 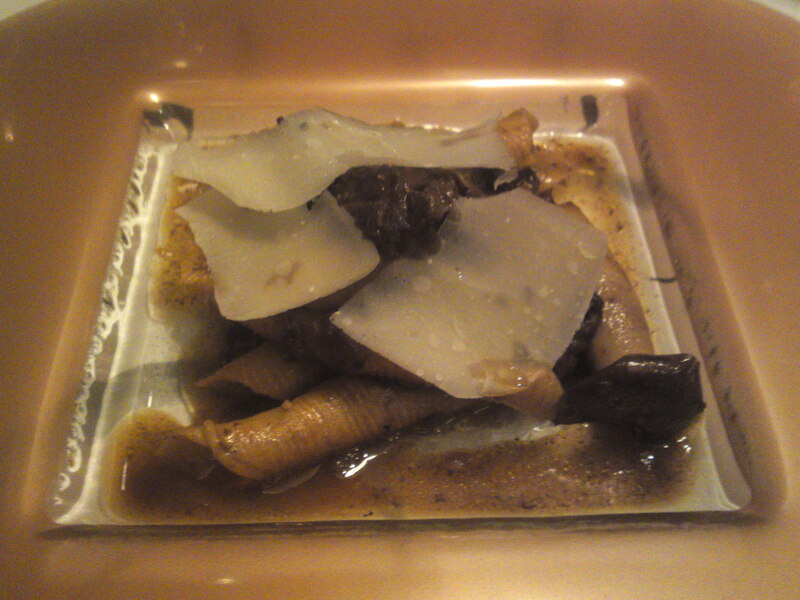 All kinds of tidbits to accompany the rice, and a little dessert. 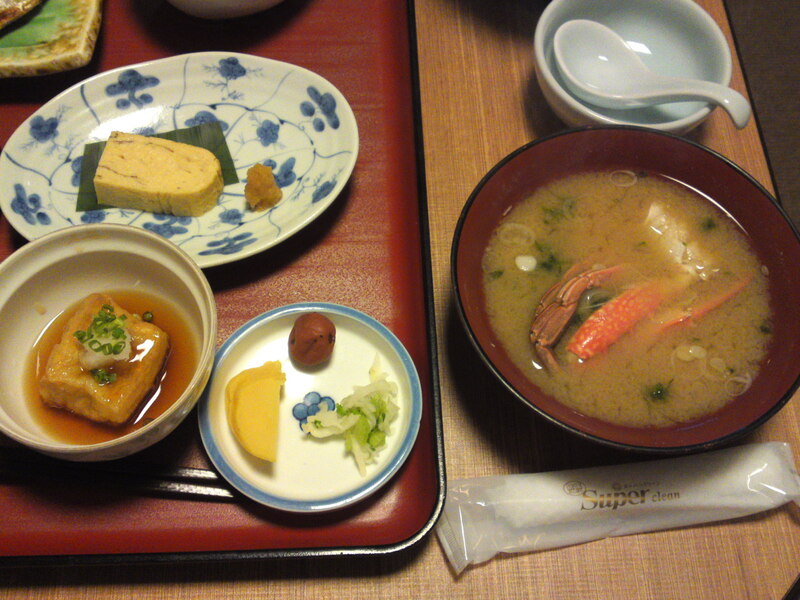 Tamagoyaki, Sweet and sour tofu, pickles and crab miso soup. 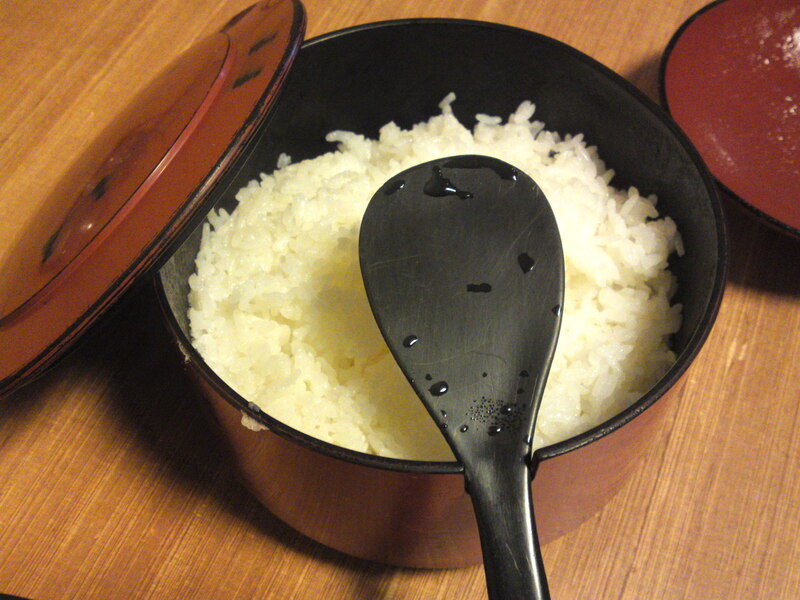 And plenty of rice, the traditional way! 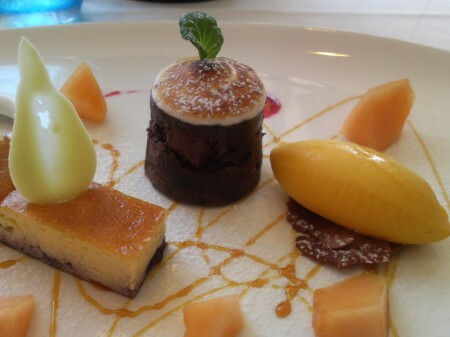 Shizuoka Touristic Spot: Heda in Izu Peninsula! 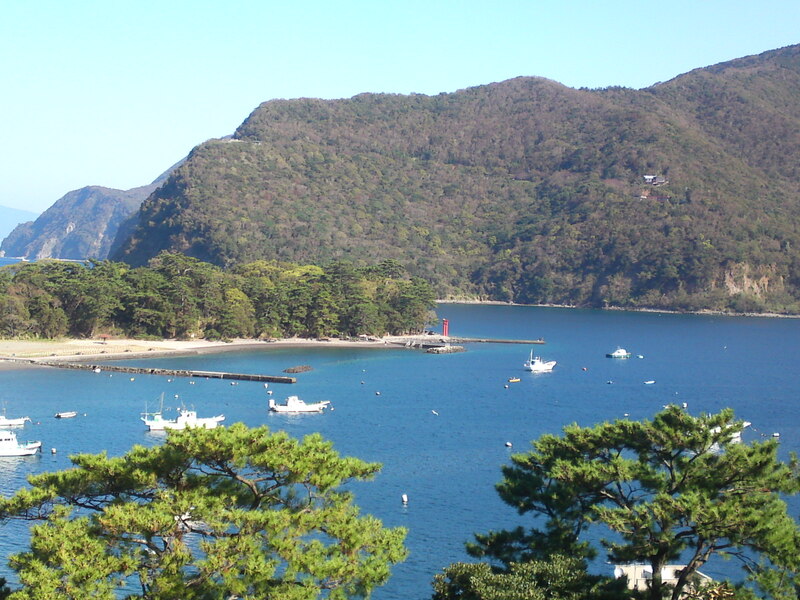 Heda, a harbor tucked away inside an almost closed cove is the epitome of what Izu Peninsula in Shizuoka Prefecture has best to offer to any tourist, be he/she Japanese or from distant shores! 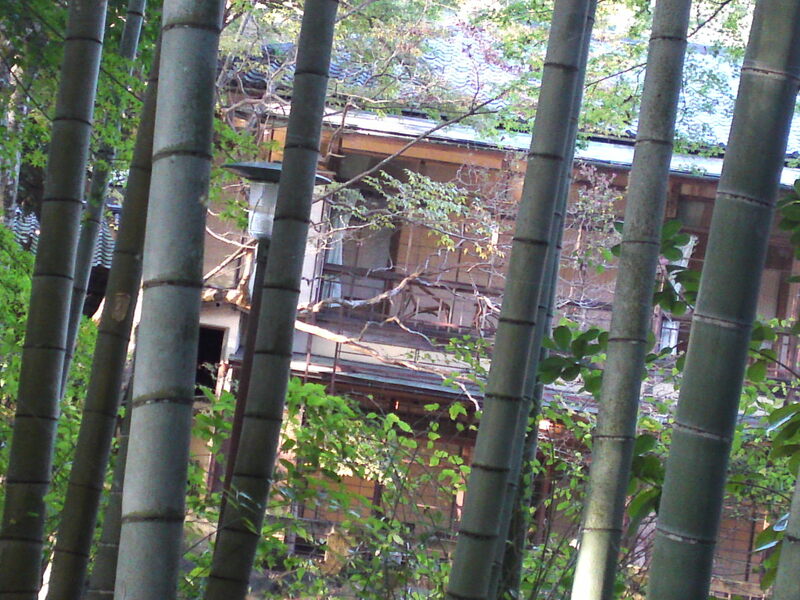 -A resort off the beaten tracks. 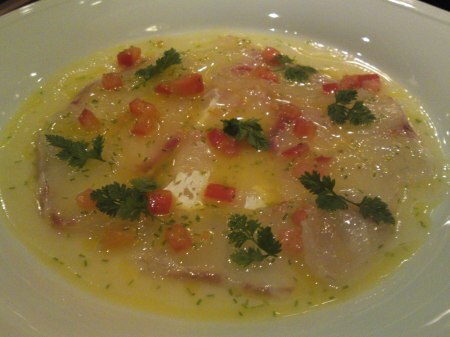 -A spa renowned for its thermal hot springs. 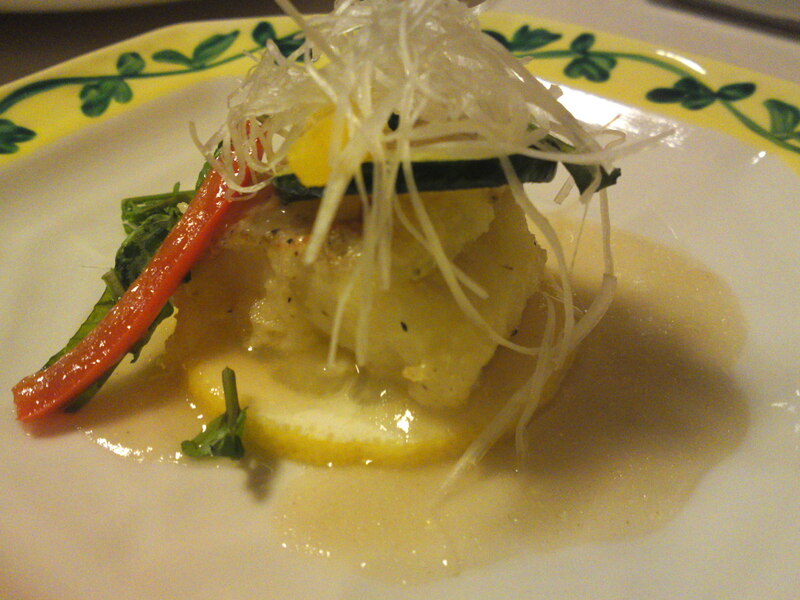 -A major fishing harbor part of Numazu City, one of the main providers of seafood to Tokyo. 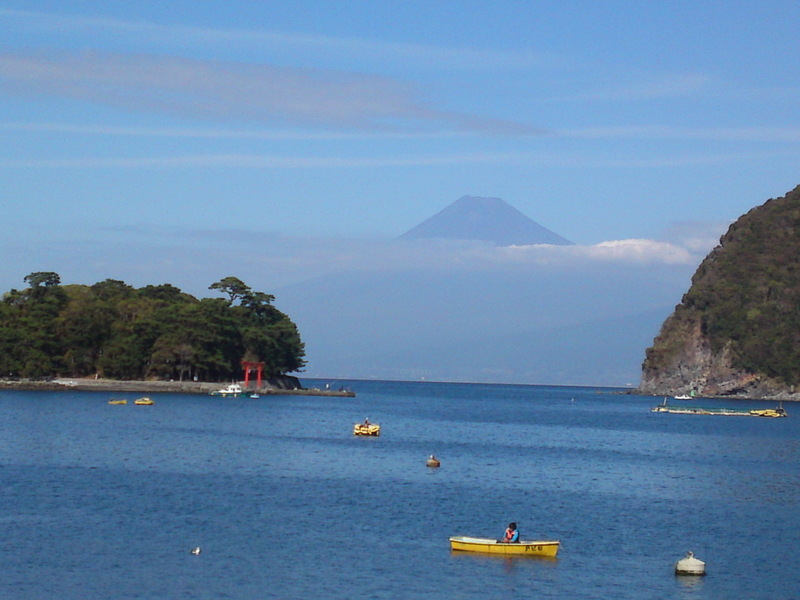 -Arguably one of the best spots to admire Mount Fuji in the whole of Japan! 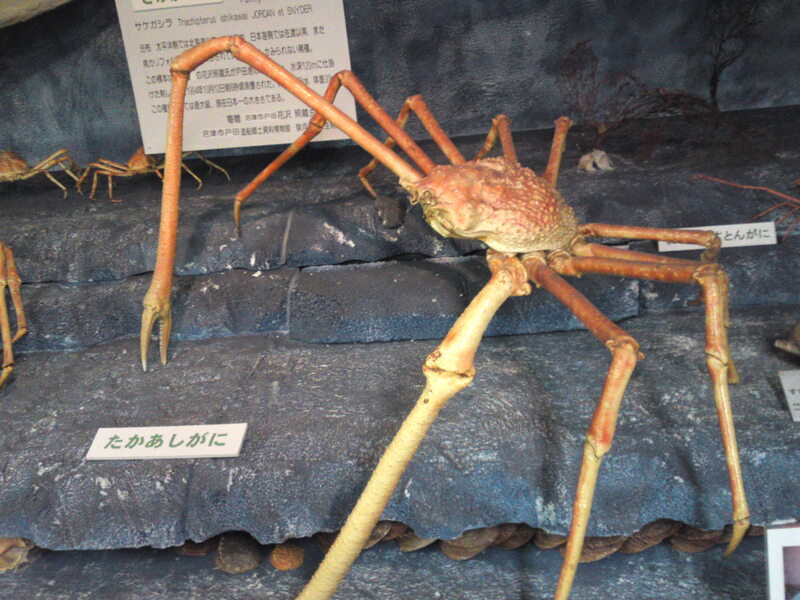 -A gastronomic venture with its deep-sea fish and marine life including the largest crab in the world, Takaashigani/高足蟹/Japanese Spider Crab! 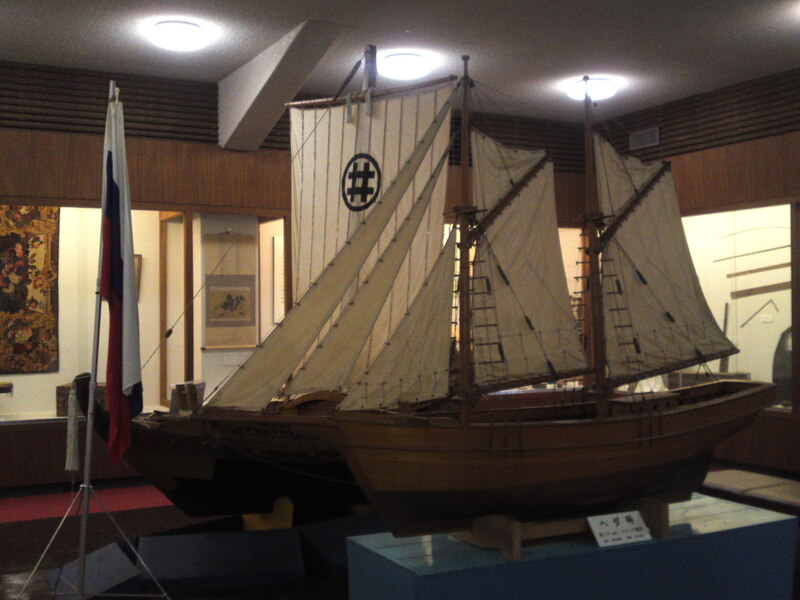 -History: It was visited in 1854 by the Russian frigate Diana of the Imperial Russian Navy, the flagship of the Russian explorer Yevfimy Putyatin when it was damaged in a tsunami, following the powerful Ansei-Tōkai earthquake of 23 December 1854. 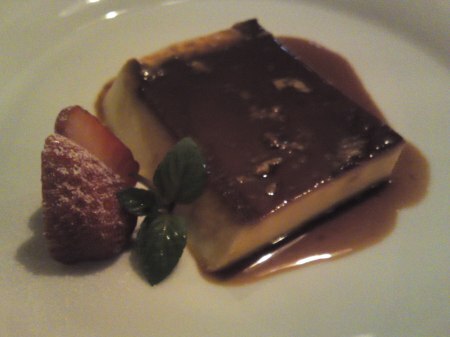 The Diana sank while sailing from Shimoda to Heda for repairs! 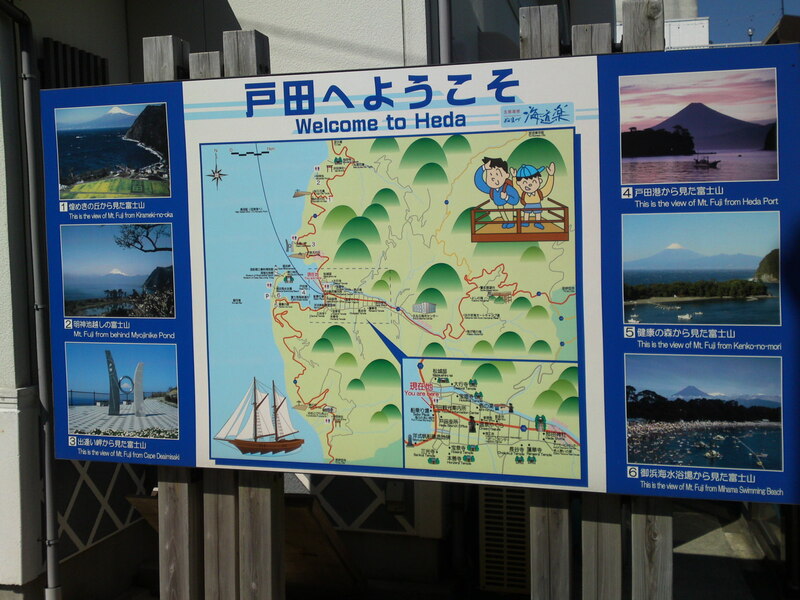 Board in front of the tiny but extremely useful Heda Tourist Bureau. Go down at Mishima JR Station (Shinkasen Bullet Train Stop) and proceed to the neighboring Izu Hakone Line Station (right of the Mishima JR Station South Exit). 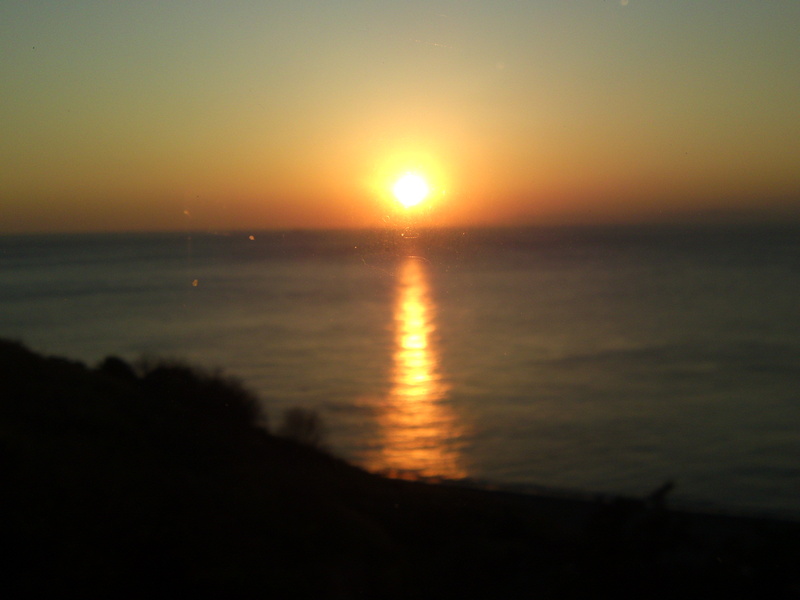 Board the local train/Izu Hakone Line to Shyuzenji (30 minutes, 510 yen). 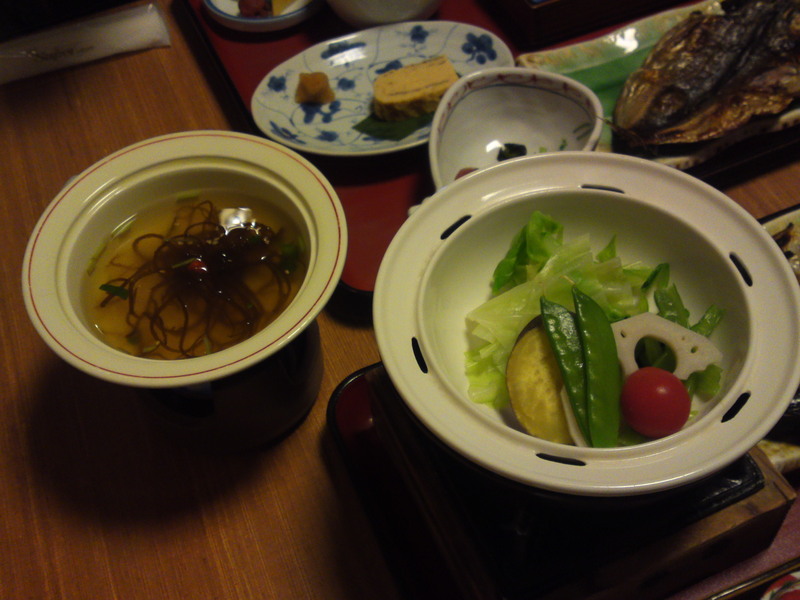 Take a bus from Shyuzenji Station, terminal No 6 to Heda (54 minutes, 1,000 yen). The bus will reach Heda just beside the Tourist Bureau you ought to visit to get as much information and as many pamphlets as possible from the very kind staff! First of all, Heda is a paradise for photographers, amateur and professional alike, who can take innumerable shots of Mount Fuji from various view spots all year round as the sacred mountain is changing its robes daily! 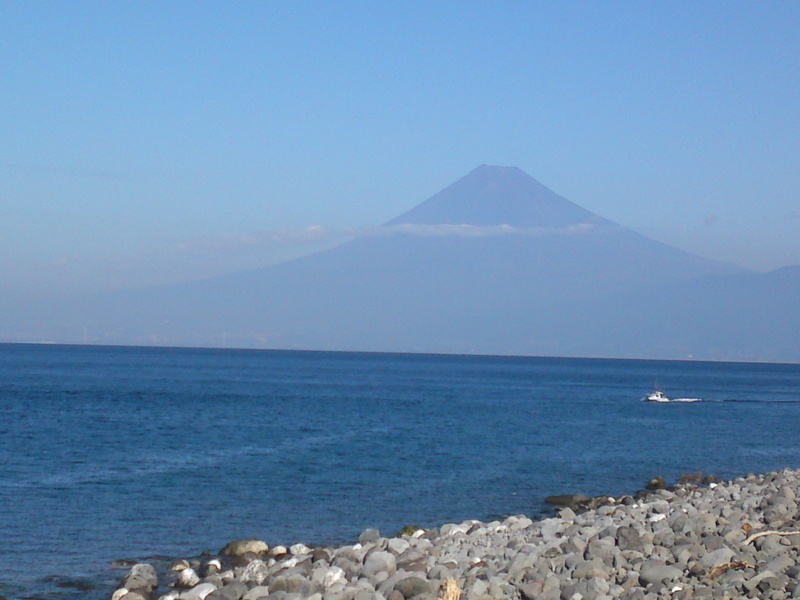 In Autumn, one may sight Mount Fuji as a dark and mysterious figure shrouded in mists looming beyond the sea. Sometimes it does look as surging out blue expanses! 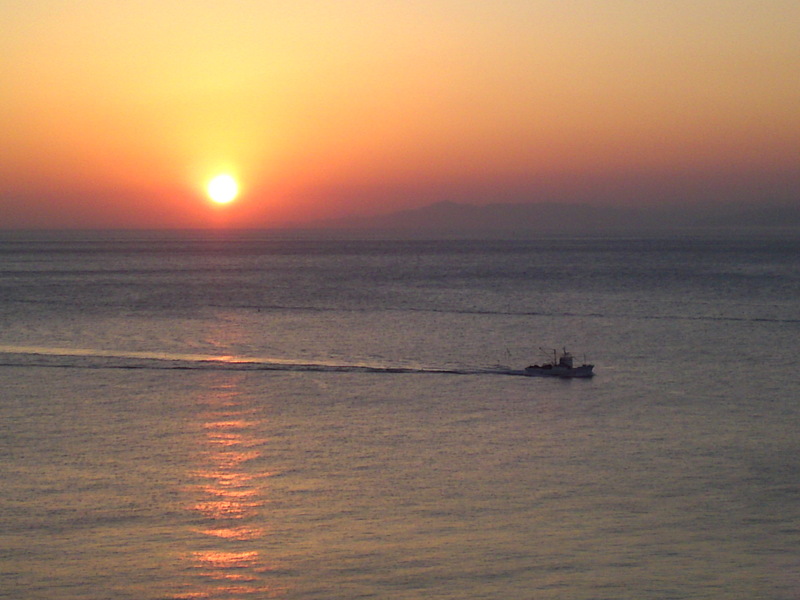 At dusk it will be blurred out of the sky by magnificent sunsets irreverently crossed by returning squid fishing boats! 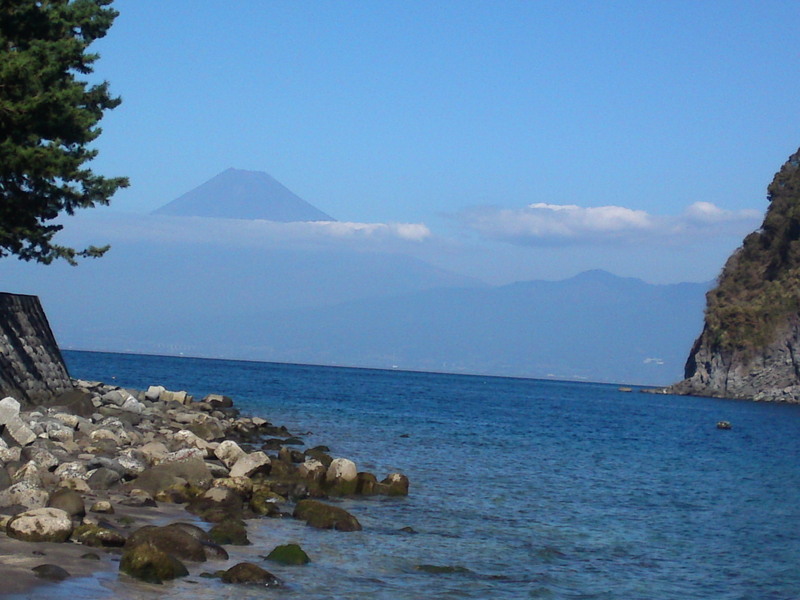 Once you have managed to take your eyes off Mount Fuji you will realize that the cove itself is also worth clicking away all day long! In the middle of November the surrounding mountains will explode into autumnal colors and the first snow will don a cap to the faraway Mount Fuji! 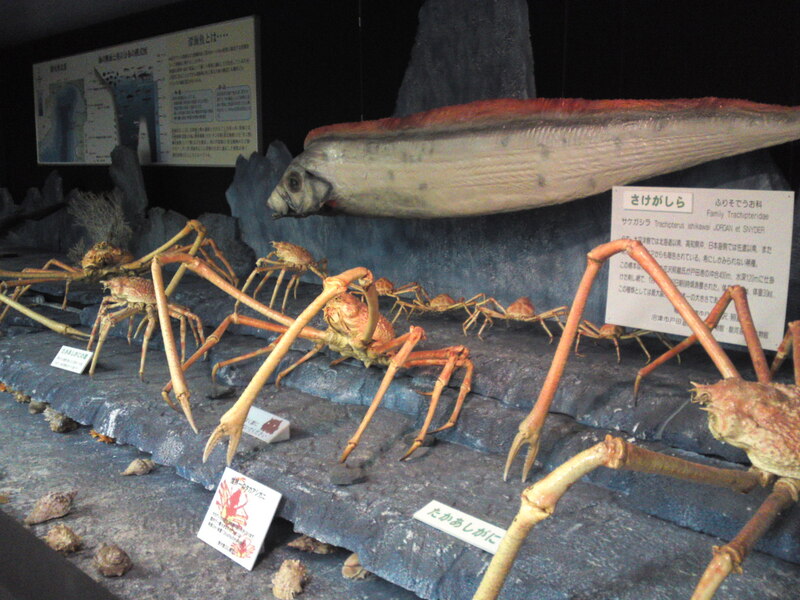 But before you linger on the inside beach let me take to the tiny Shipyard and Suruga Bay Deep-Sea Museum past the old lighthouse! It is an old and almost decrepit building, the more when you realize that the various monuments left and donated by the Soviet Government date back to 1947! 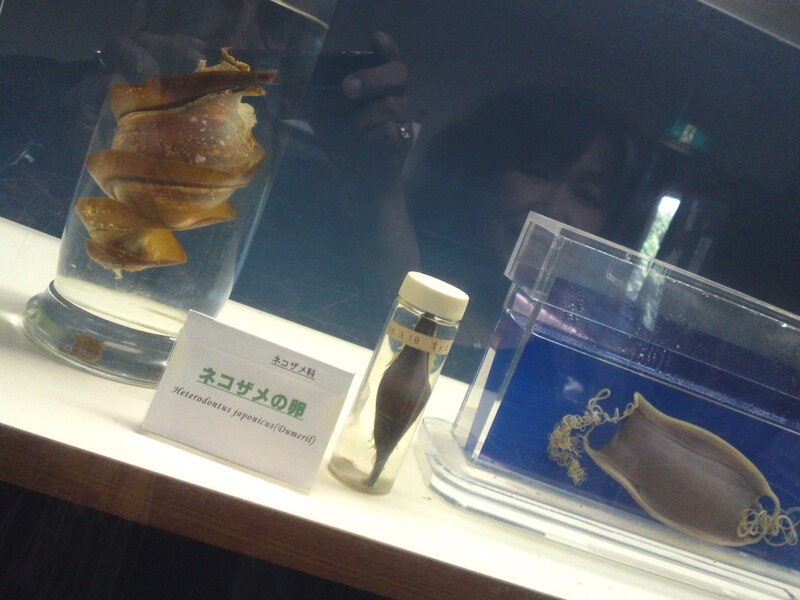 But the entrance fee is a mere 200 yen as the Museum is managed by the City! 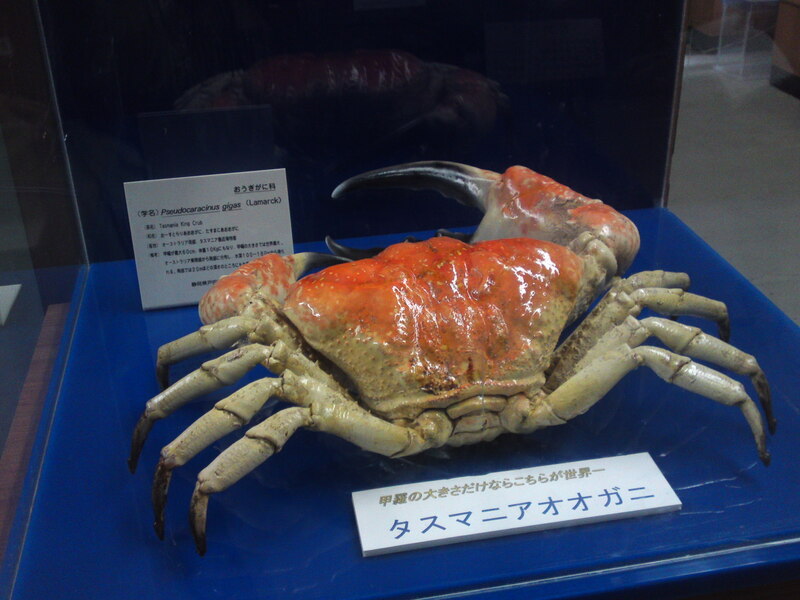 The largest crab in the world, Takaashigani, almost 3 meters from leg tip to leg tip! 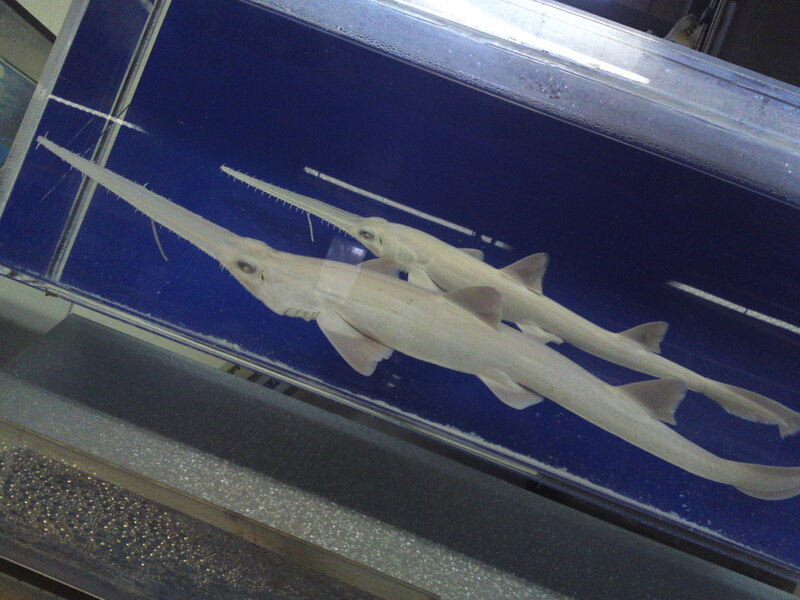 The Museum is divided into two distinct parts, the Shipyard & Suruga Bay Deep-sea Hall on the lower level and the upper level dedicated to Yevfimy Putyatin and his frigate Diana. 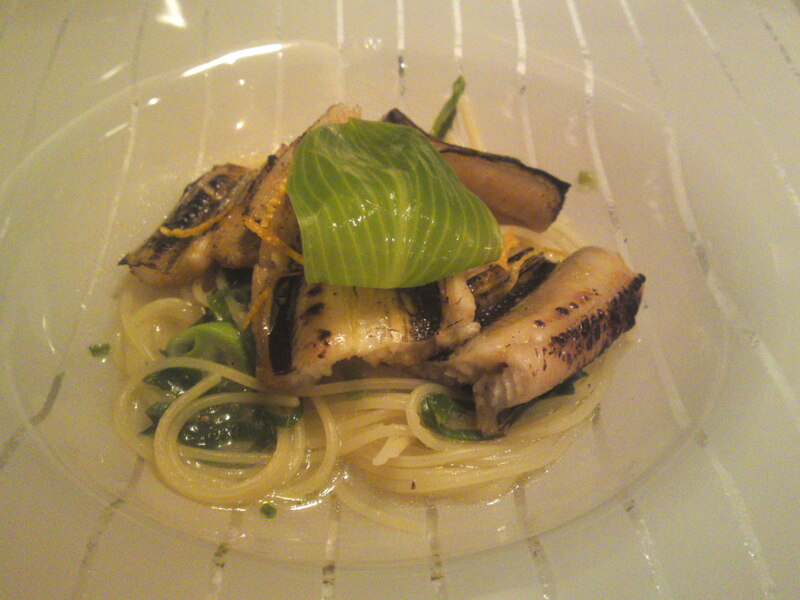 A real Sakegashira, a variety of deep-sea mahi mahi, even bigger than the Japanese Spider Crabs! 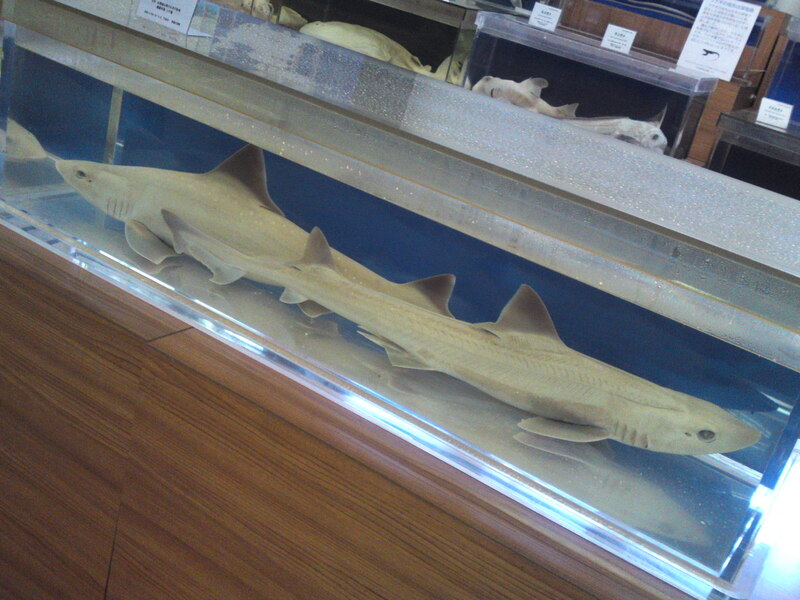 Most of the displays were donated by local fishermen or well-wishers. 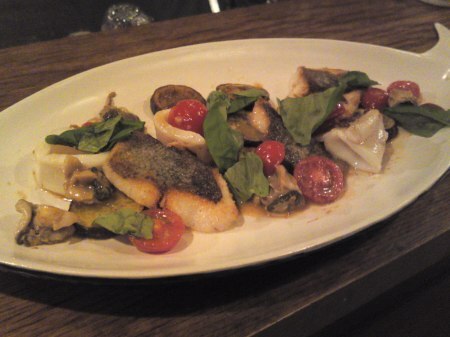 All names of fishermen, places and dates of catch are clearly indicated! 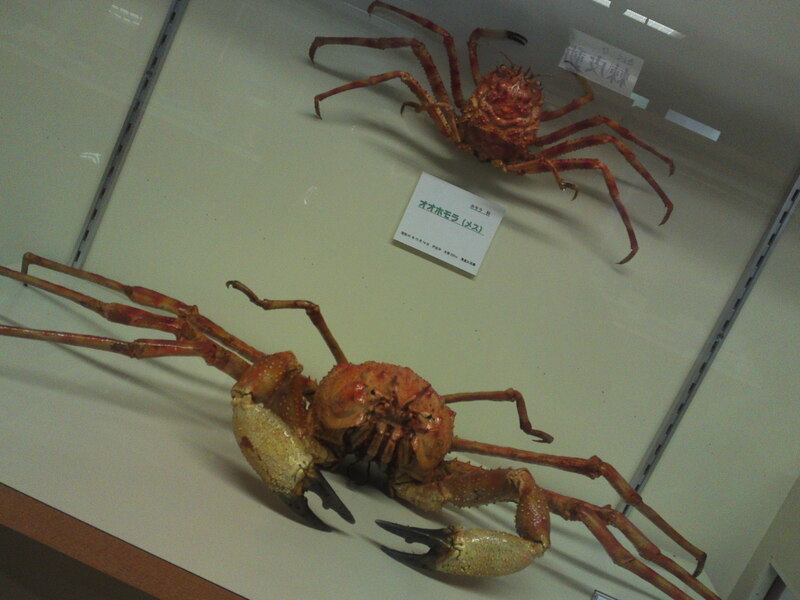 Tasmanian Giant Crab, the crab with the largest body (legs not included) in the world! 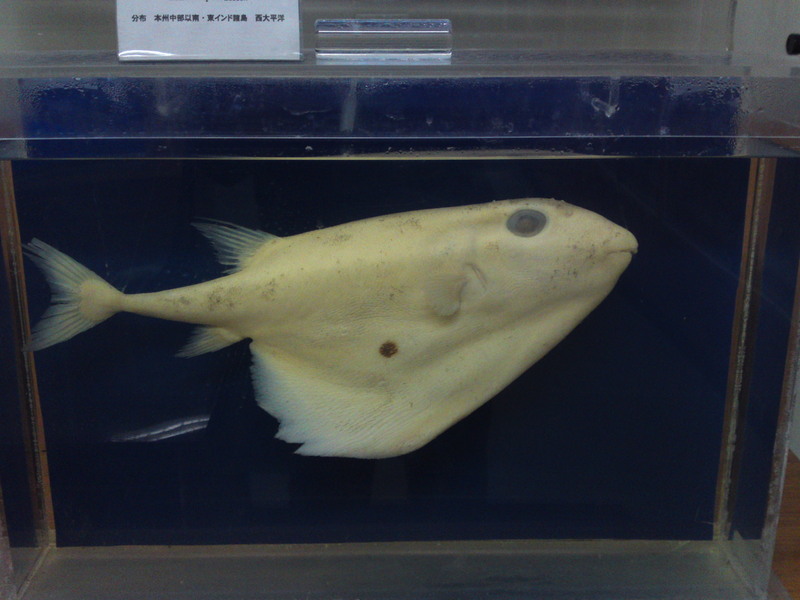 A ghost of the deeps…? 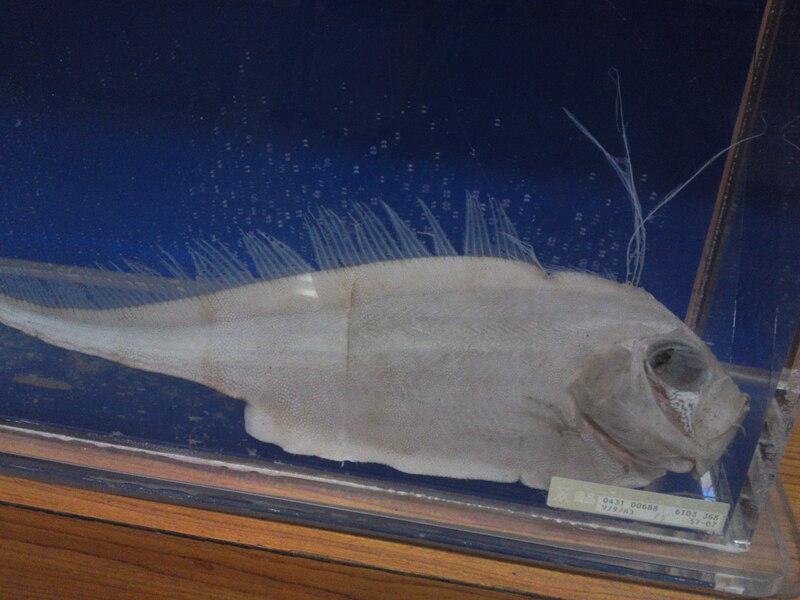 They call that critter from the deeps a fan globefish! 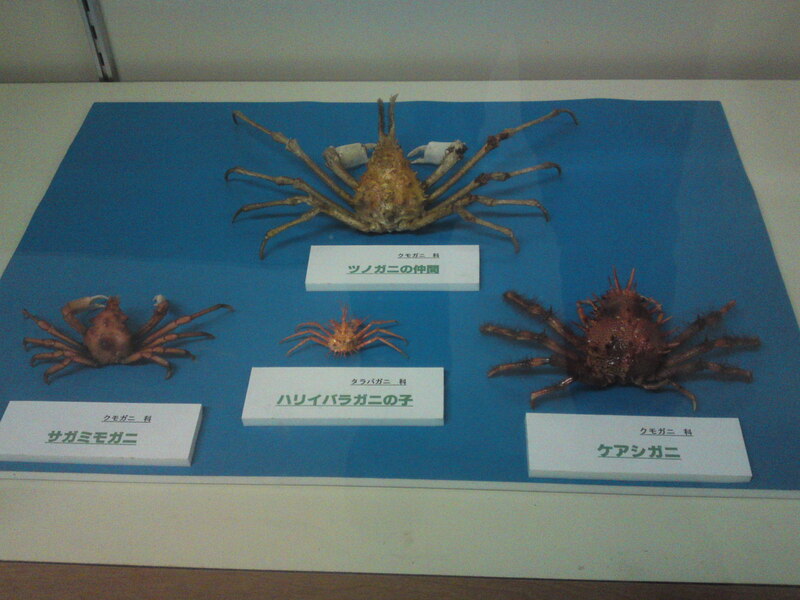 For the marine history buffs! 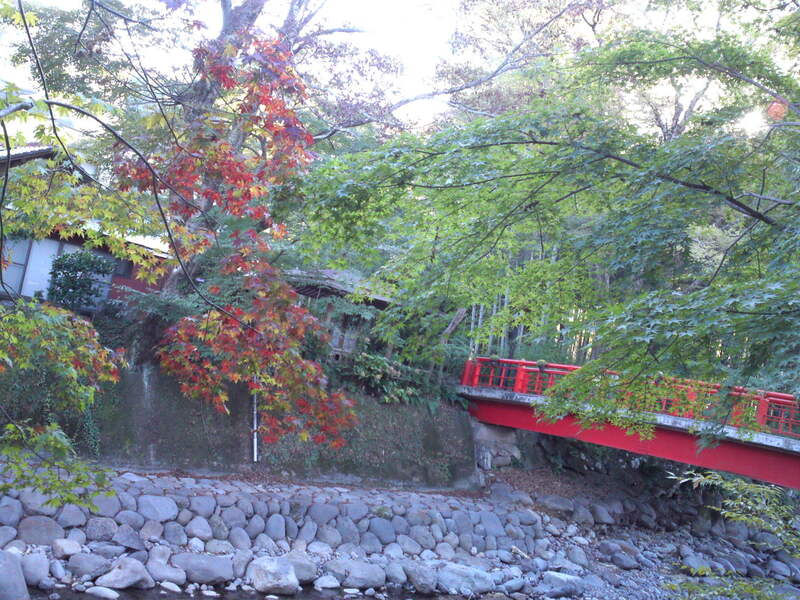 Walking from the Museum towards the inlet you will go past the small quaint Shinto Shrine Maorokuchi Jinjya/諸口神社! 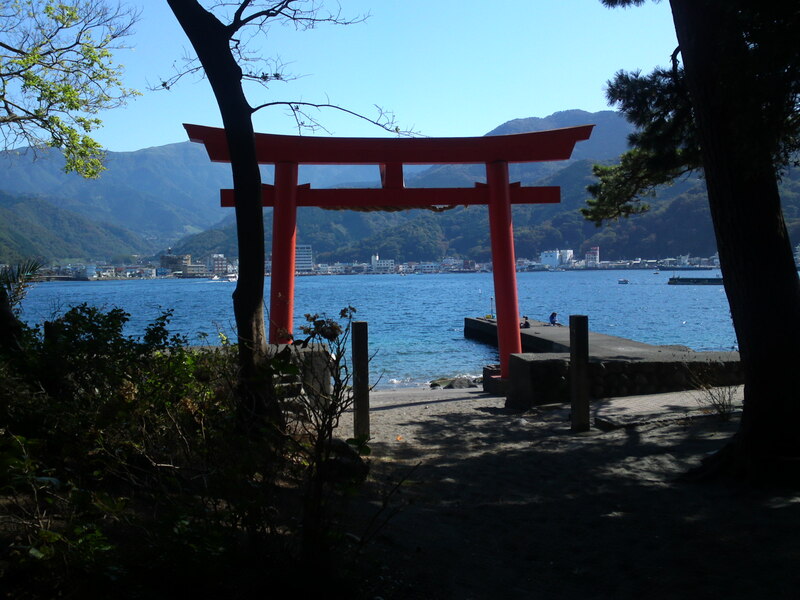 Keep walking under the pines and you will find the sacred shrine portal/torii/鳥居/ overlooking the inlet. 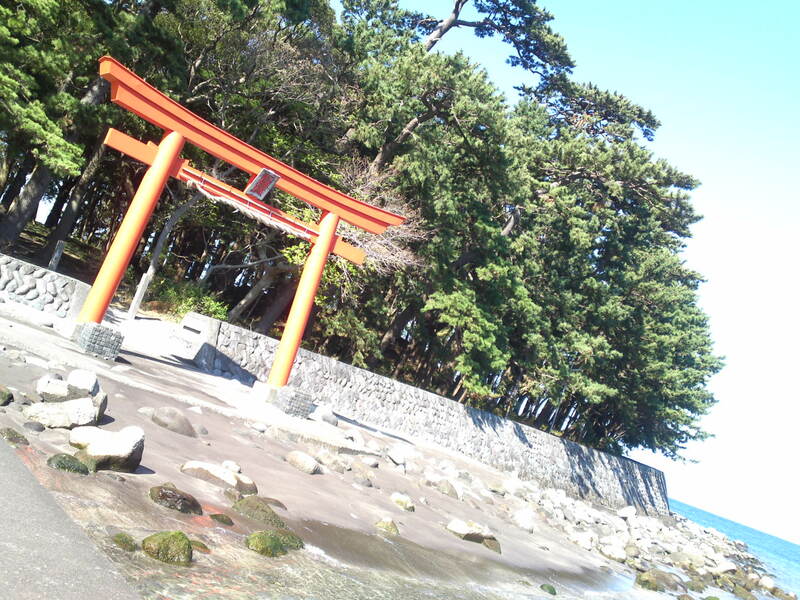 Needless to say that the shrine is there to protect the fishermen and their families! 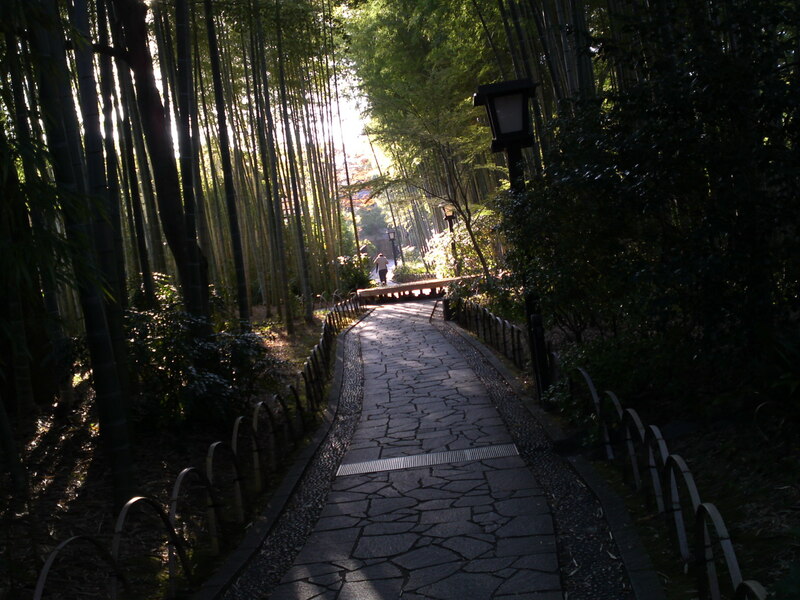 In summer that small pine forest is a welcome haven from the hot sun! 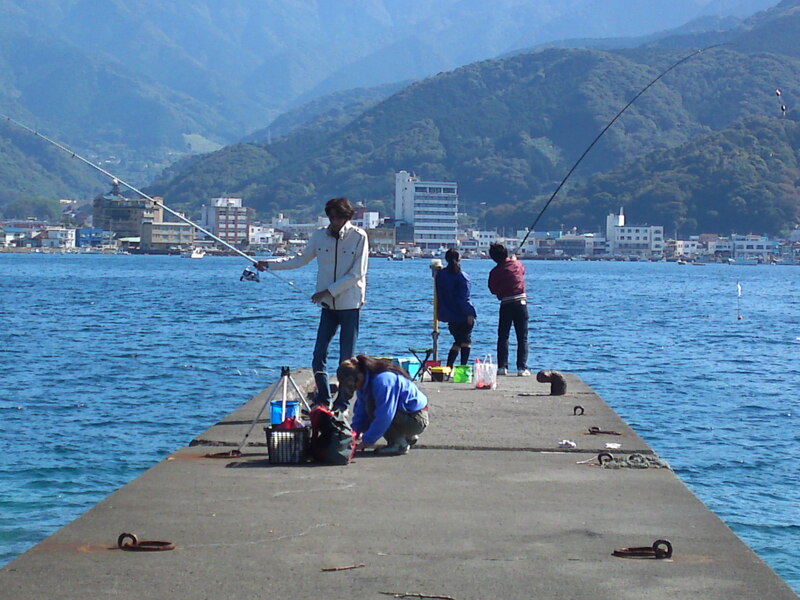 Away from the summer bathers, fishing buffs enjoy the day on the small pier in front of the shrine portal! 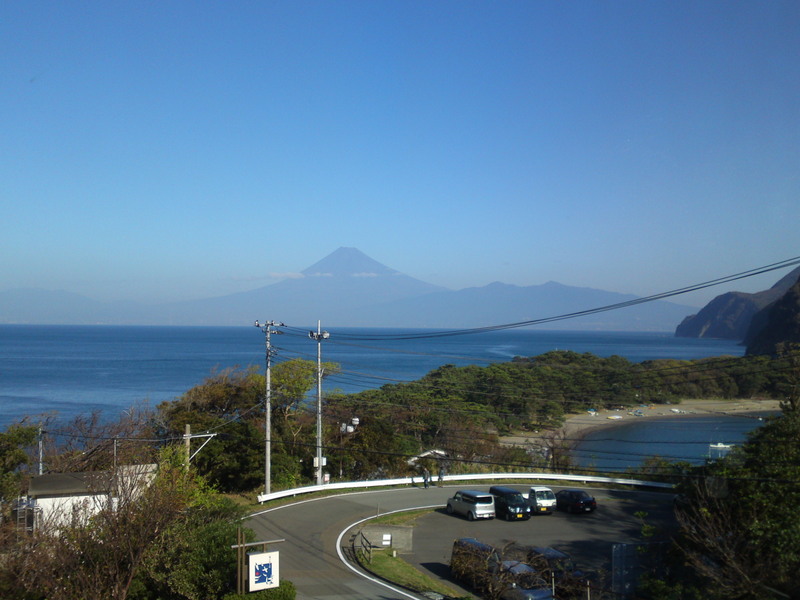 A last picture of Mount Fuji before walking back along the beach! The shrine portal as it looks from inside the cove! 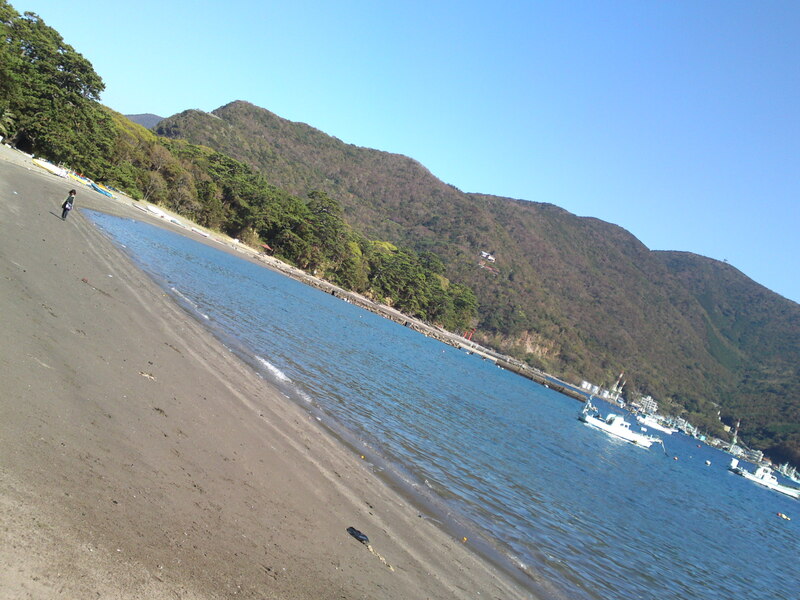 The beach is a great promenade out of season (I mean the bathing season!)! 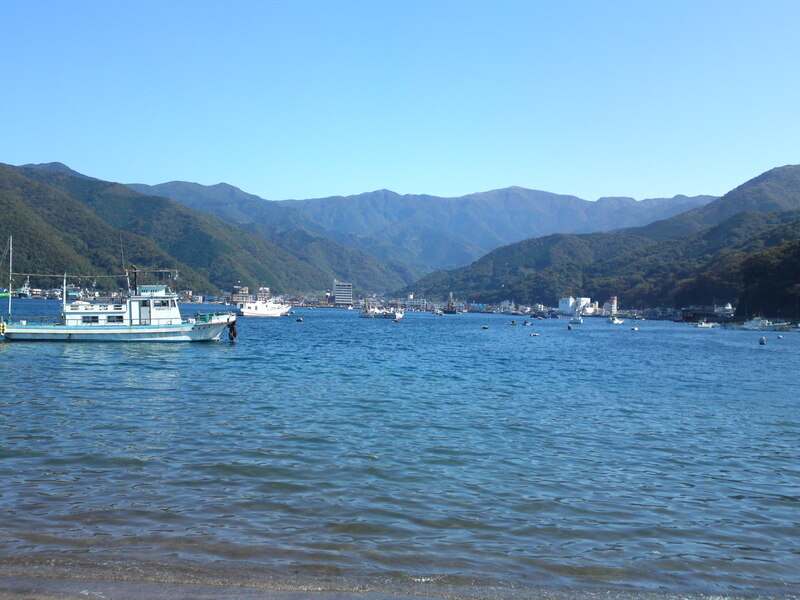 Calm blue and beautiful waters away from the rough seas! 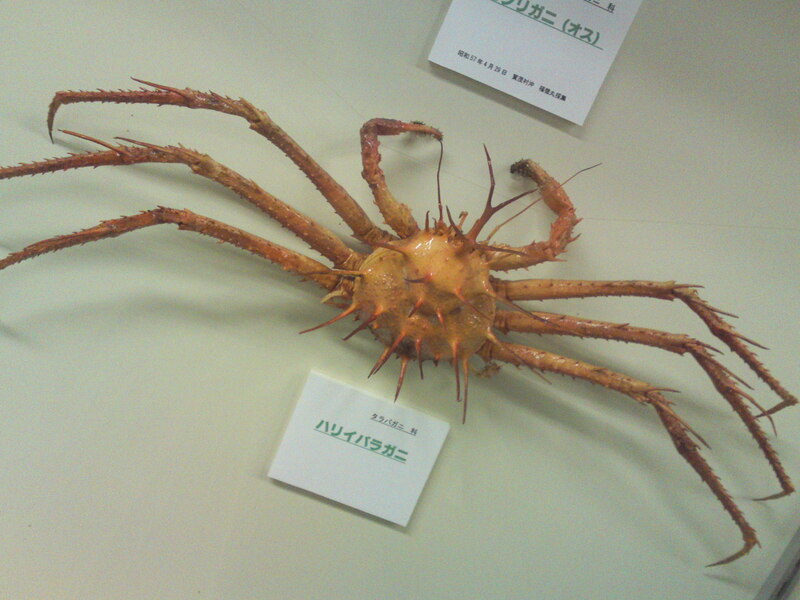 A monster from the deeps…? 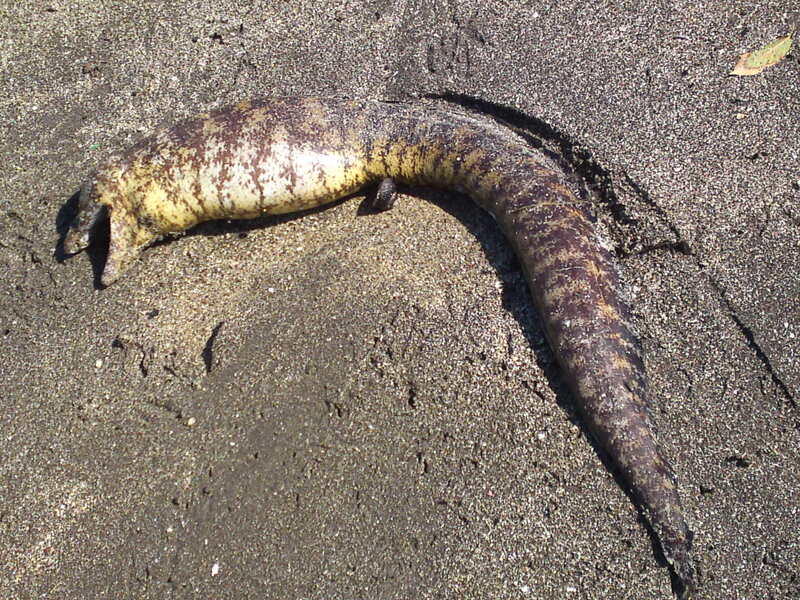 Utsubo/ウツボ/Moray eel! 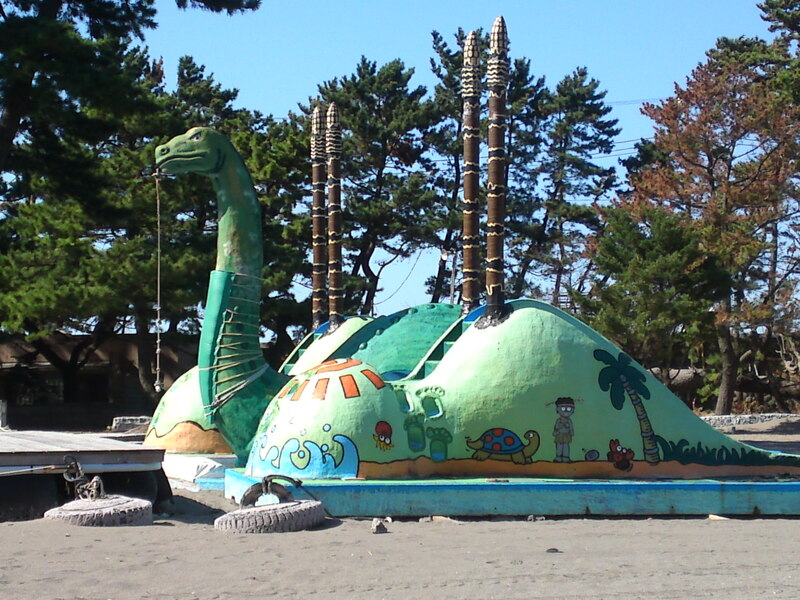 A Nessie monster for the kids! 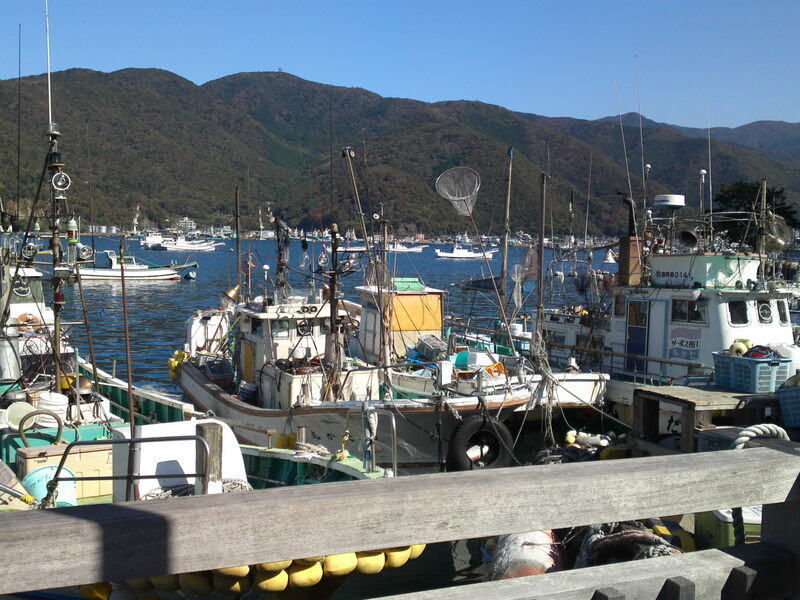 One can walk all the way to the center of Heda past fishing boats! 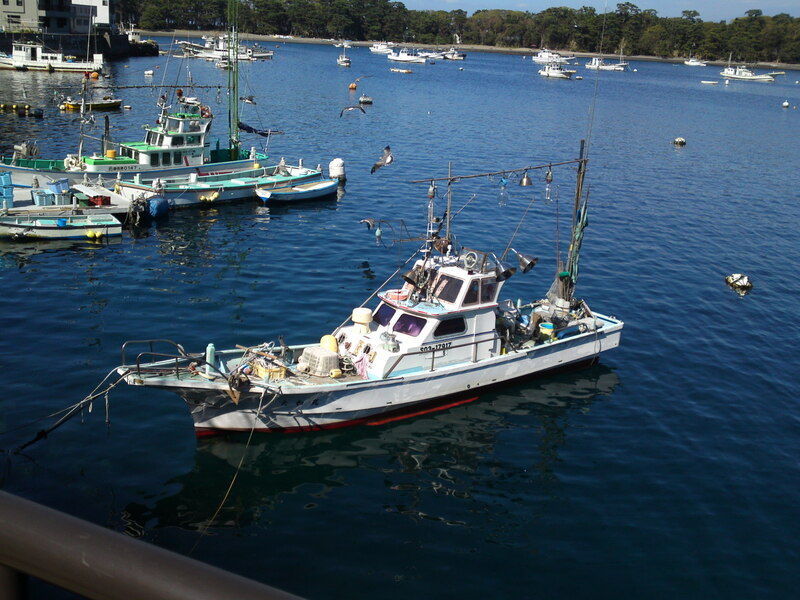 A squid-fishing boat! 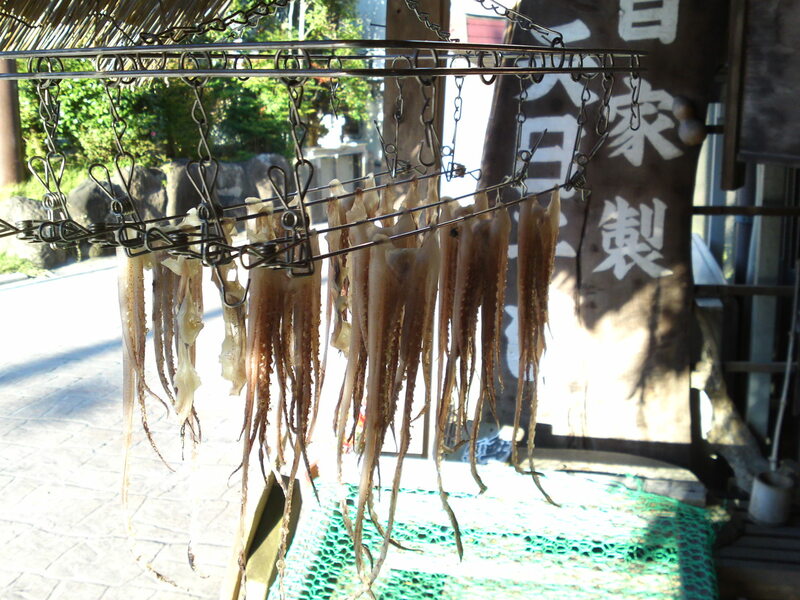 Red squids are a delicacy abundant in the Suruga Bay waters. The boats go at sea at night only. 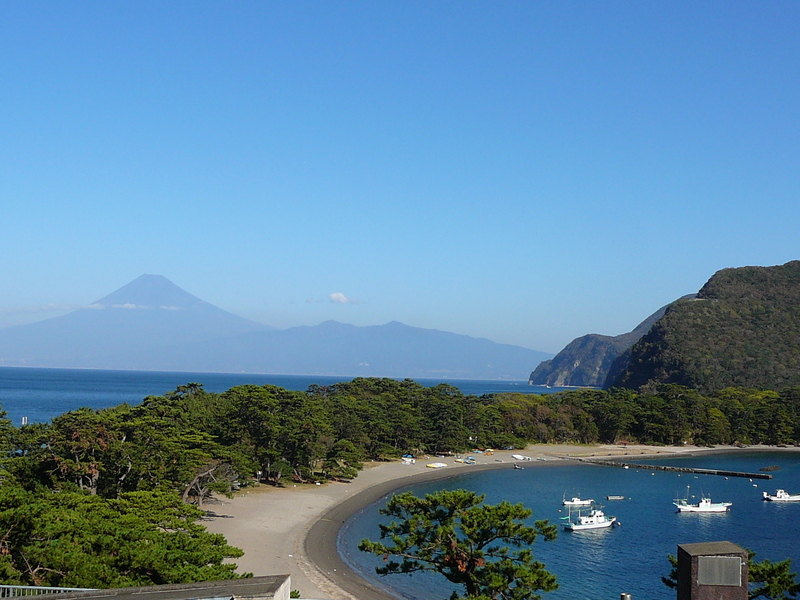 If you have the chance to visit Shuzenji in Izu Peninsula, Shizuoka Prefecture, one of the oldest hot springs resort in Japan whose history has been traced back more than 1,400 years, even a single day return trip would make it worthwhile! 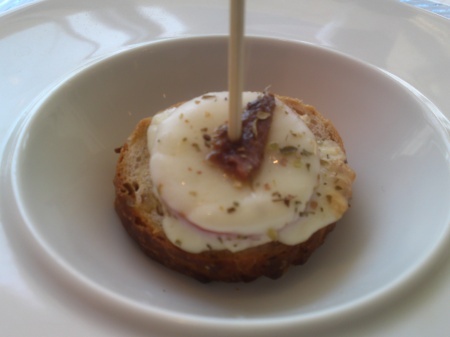 There are lots of things to see, experience and taste there! I make a point to pay it a visit at least twice a year at different seasons! 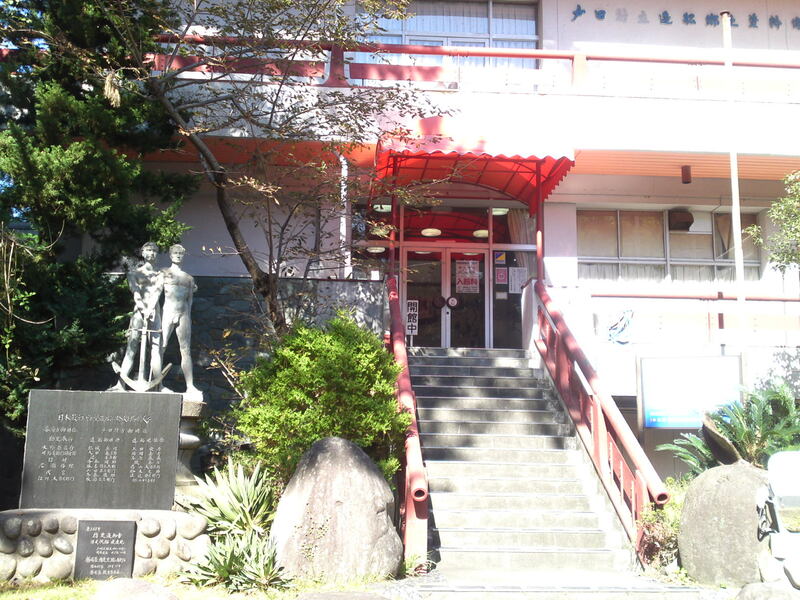 The access is very easy: Change lines and Station at Mishima City, it is only 510 yen and 30 minutes away! 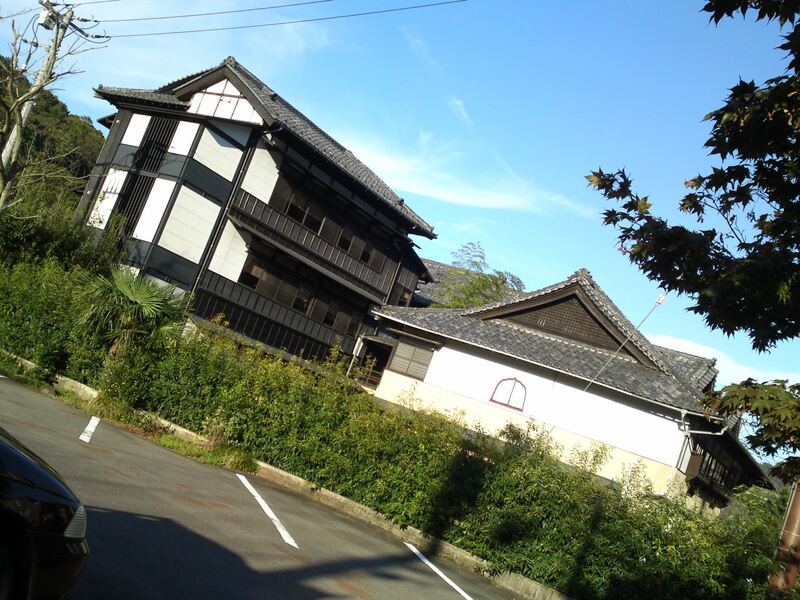 Yesterday I only had a couple of hours to enjoy the place on my way back to Shizuoka City, but I managed to take some pictures just to share a small glimpse of the village (it used to be a city!)! 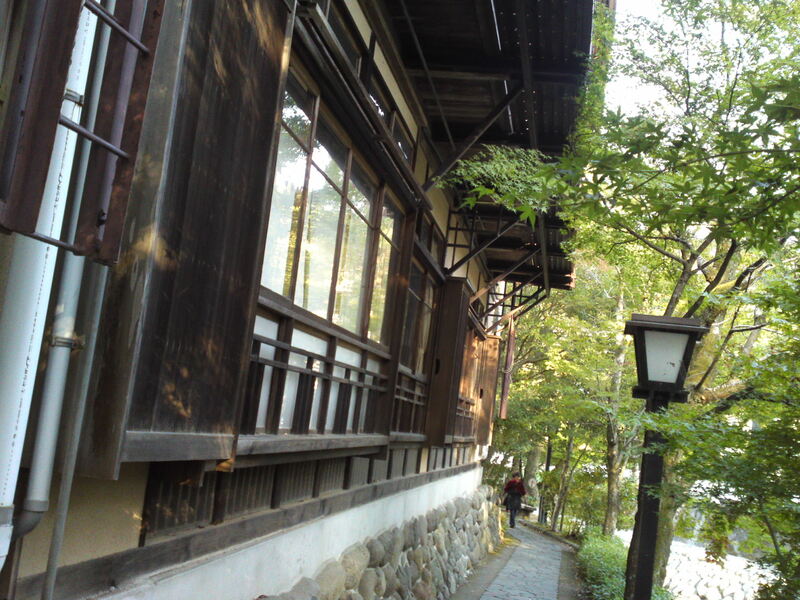 Many traditional houses along the river, be they private abodes or restaurants or shops! A beautiful stream bisects the site into two distinctive halves! Leaves are finally starting to change colors! Keep your eyes open and you will surely discover calligraphic designs to emulate! 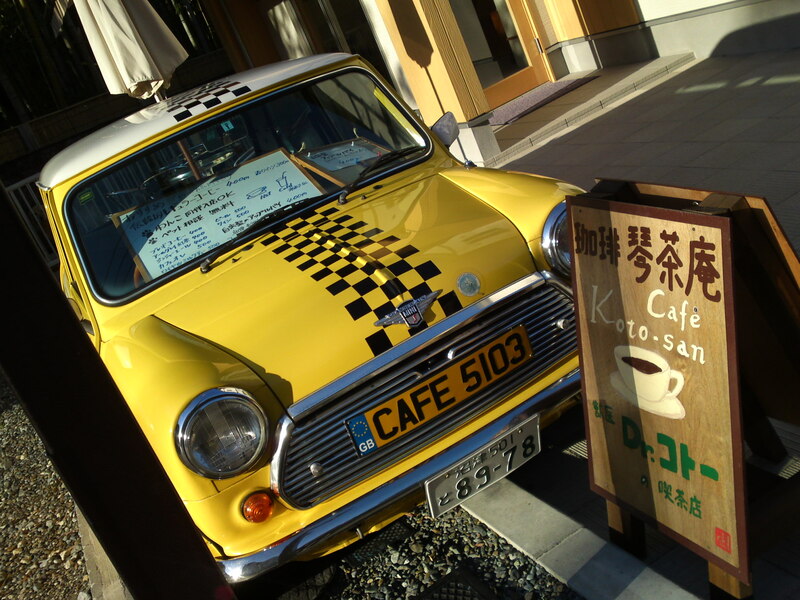 Talking of design, who might have thought of a car for a cafe ensign? 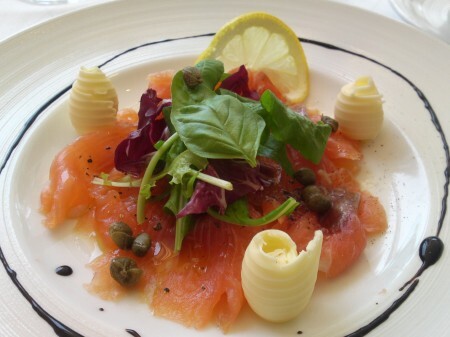 Beautiful cafe, incidentally! 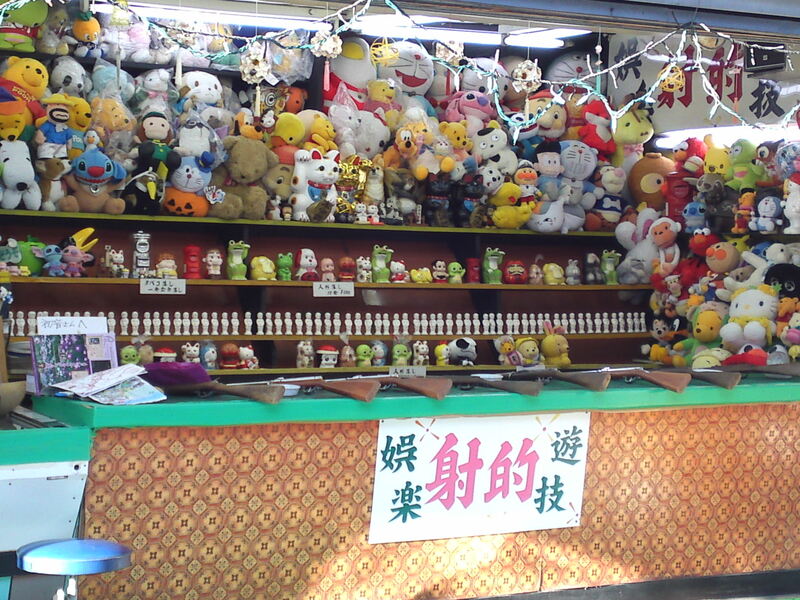 A sight rapidly disappearing in Japan, but there are still at least three of these doll rifle shooting stands in Shuzenji! 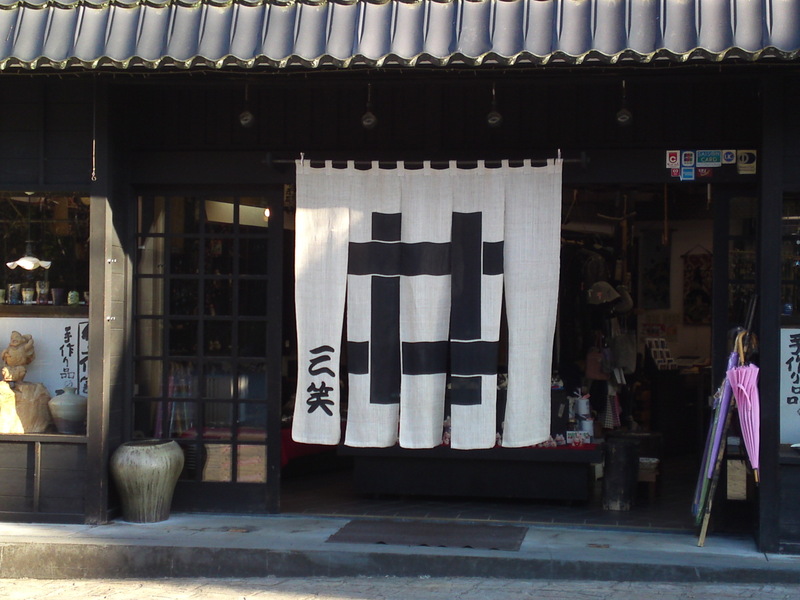 You are bound to discover some beautiful noren/暖簾/shop entrance curtains! 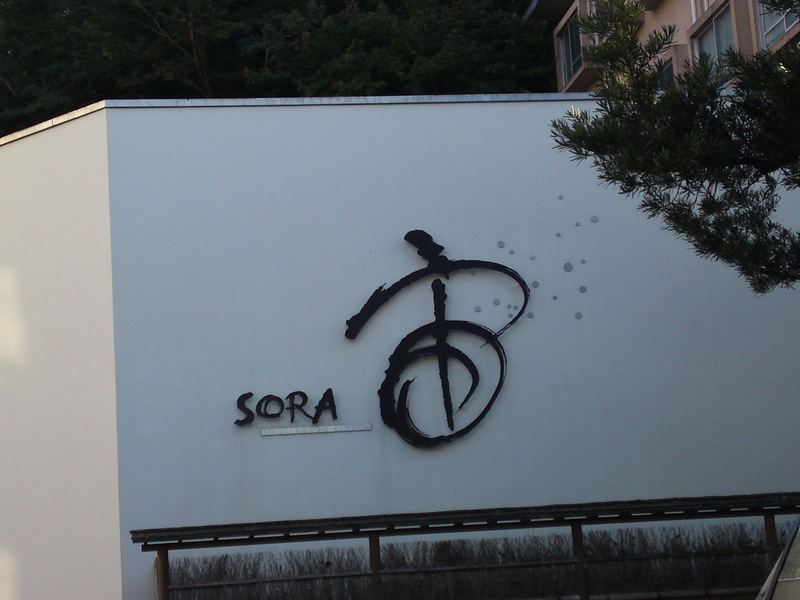 This one is at the entrance of a busy soba restaurant! 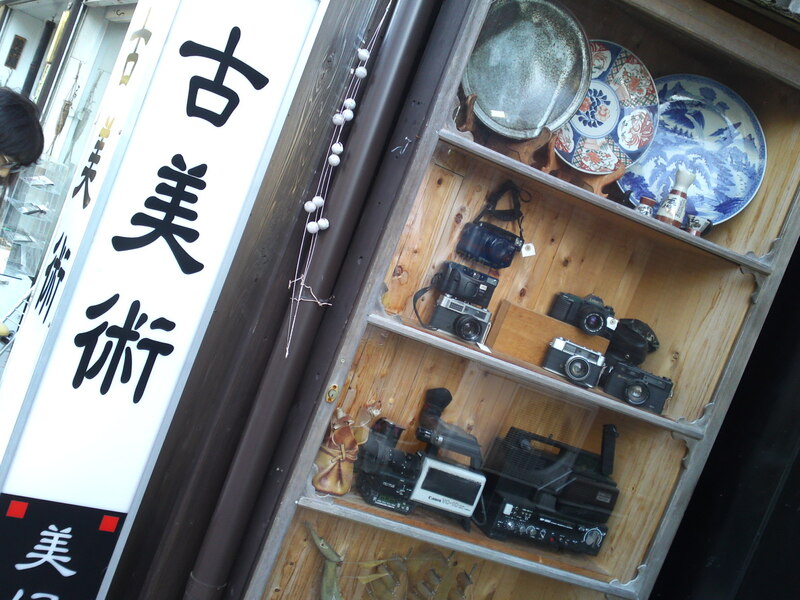 Shuzenji is also a paradise for antiques and collectors! 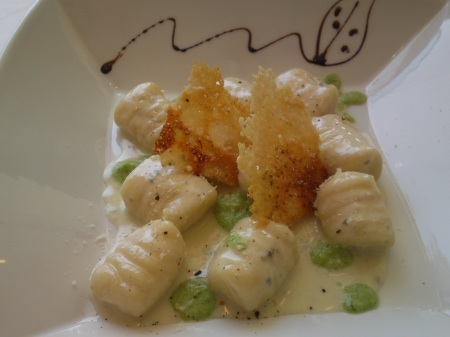 Restaurants are still built and re-built in the traditional way! 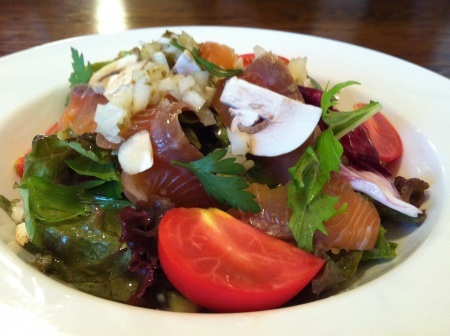 Simplicity made beautiful in a noren! What’s left hanging in front of this big electric fan? 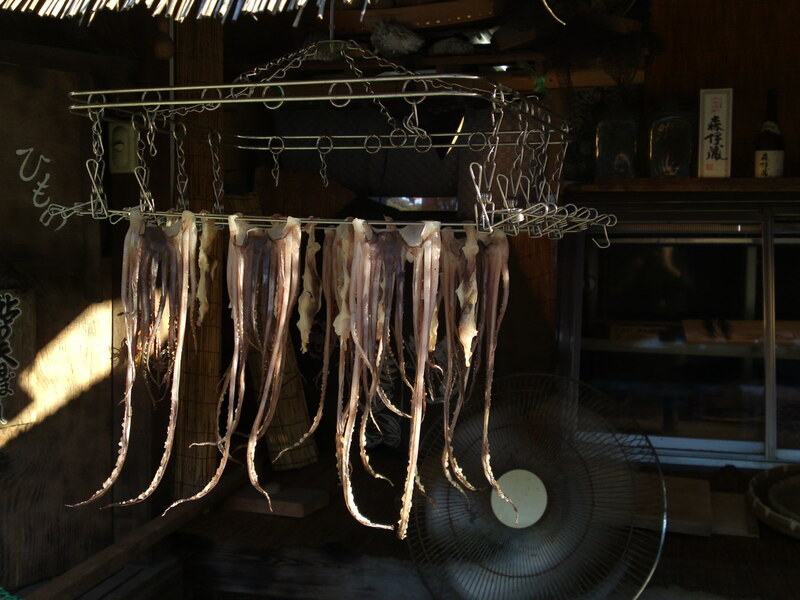 The Izu Peninsula produces half of the whole Japanese sun-dried seafood/himono/干物 in Japan! 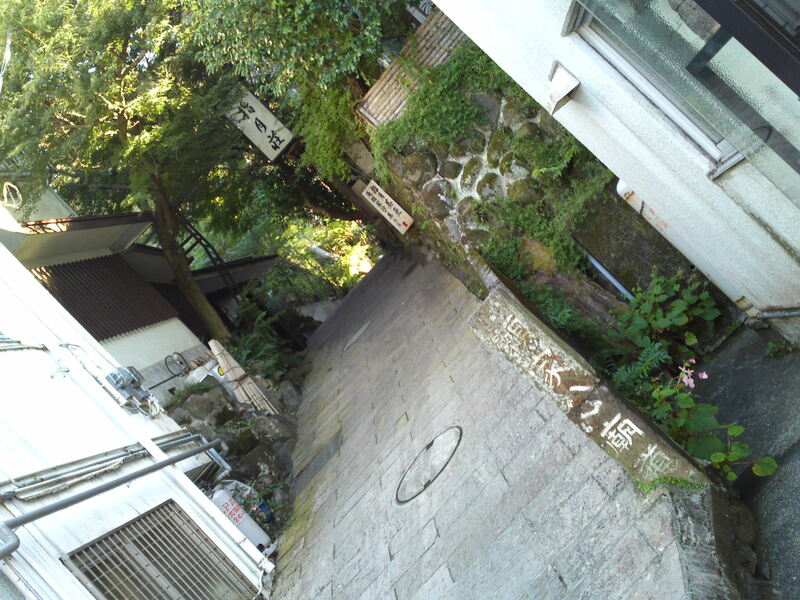 There are plenty of mysterious lanes, streets, passages and stairs to explore! 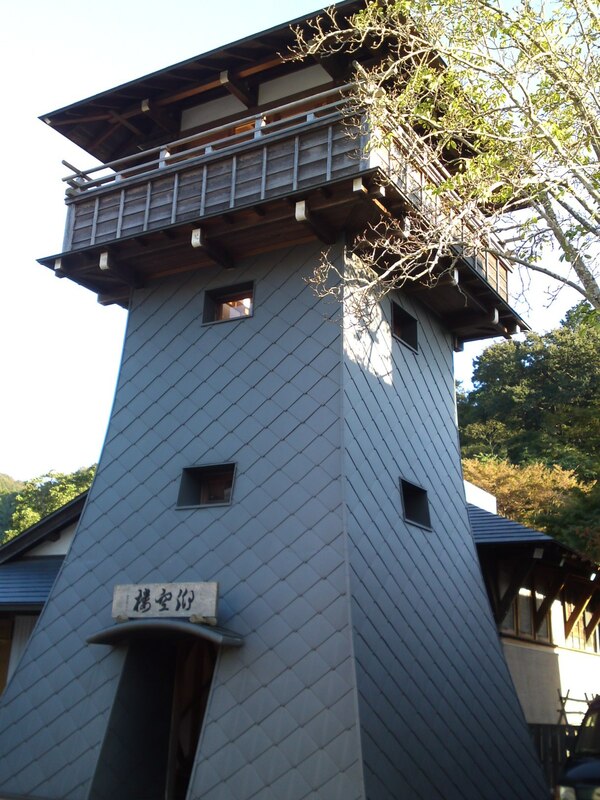 This “tower” is the actual entrance to a public (for a fee) hot springs bath! 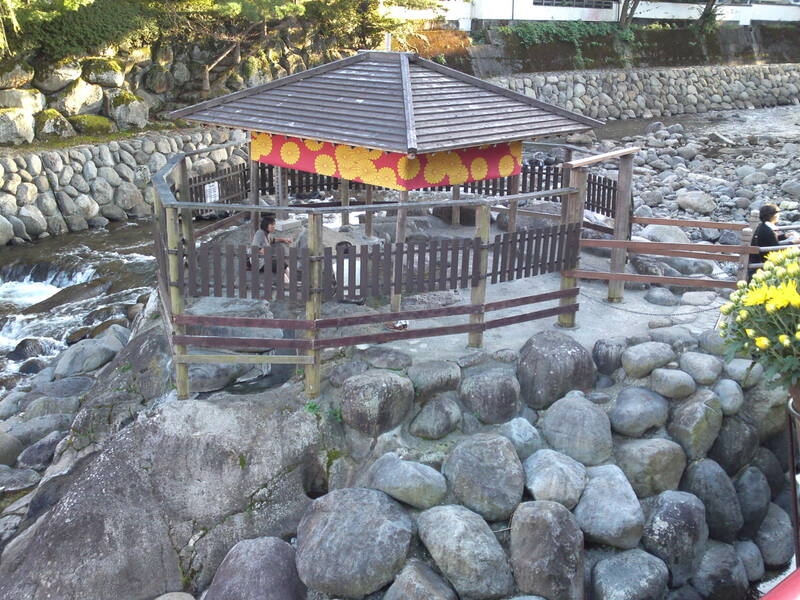 This public and free foot hot spring bath in the middle of the river has a 1,400 year-long history! A welcome dip for my tired feet! 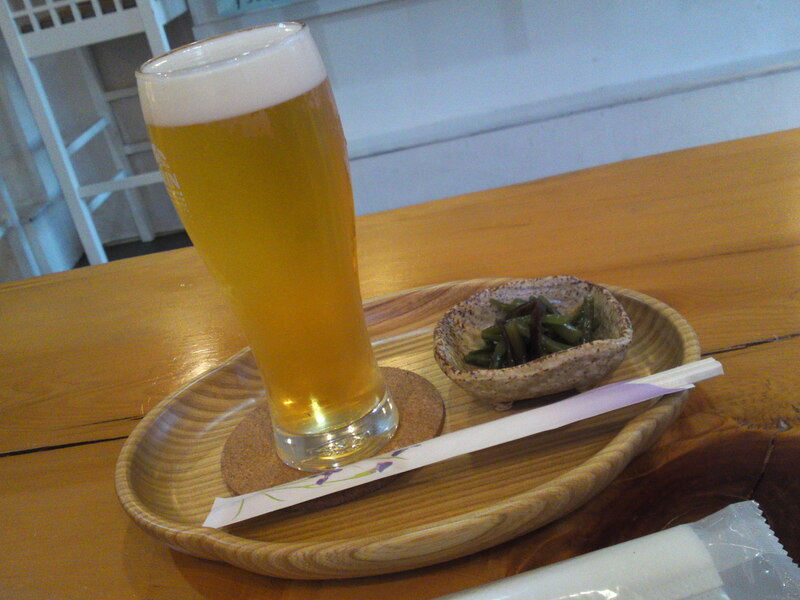 The best way to finish the day: a cold beer in one of the many cute cafes! 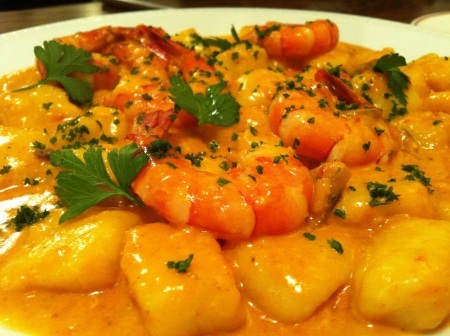 Hoping to meet you somewhere else very soon!